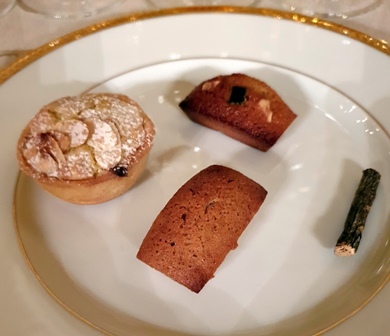 Le 226ème dîner avait eu lieu à la Cave d’Exception de l’hôtel de Crillon et j’avais apprécié la cuisine de Christopher Hache, chef du Crillon. 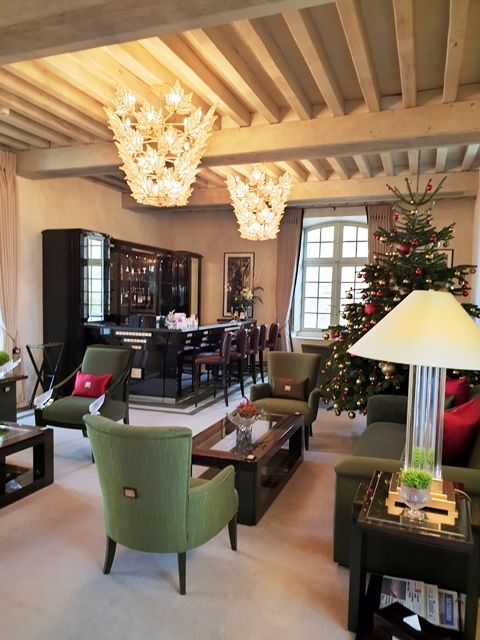 J’ai donc réservé en novembre le même beau salon pour faire avec Christopher Hache le 232ème dîner fin janvier. Et j’avais réservé une table pour faire un déjeuner de travail avec le chef et son équipe une semaine avant le dîner. 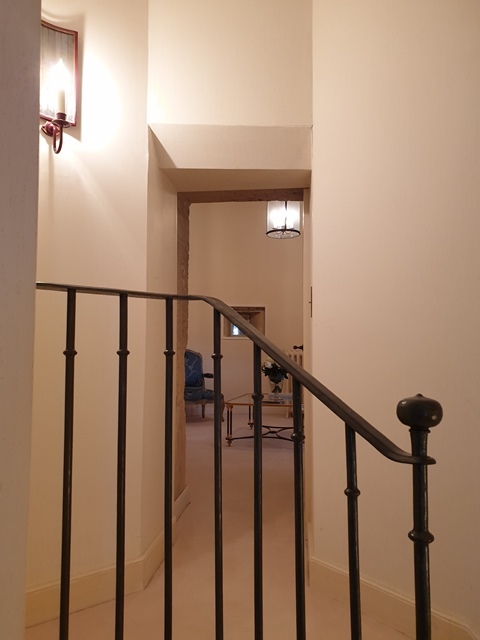 L’ennui, c’est que des mouvements de personnel ayant eu lieu au sein de l’hôtel, mon mail de réservation, confirmé par la responsable, s’est perdu, faute de réelles passations de pouvoir. Un silence étonnant régnait autour de ma réservation pour le déjeuner de travail, comme si on n’osait pas me dire certaines choses. Le déjeuner est reporté au lendemain de la date prévue et c’est Boris Campanella, nouveau chef de la restauration du Crillon qui est mon interlocuteur. Je dois donc comprendre que Christopher Hache n’est plus dans le circuit de la mise en place de mon dîner. Boris a travaillé aux côtés de Yannick Alléno à Megève au 1947 Cheval Blanc qui a obtenu trois étoiles. 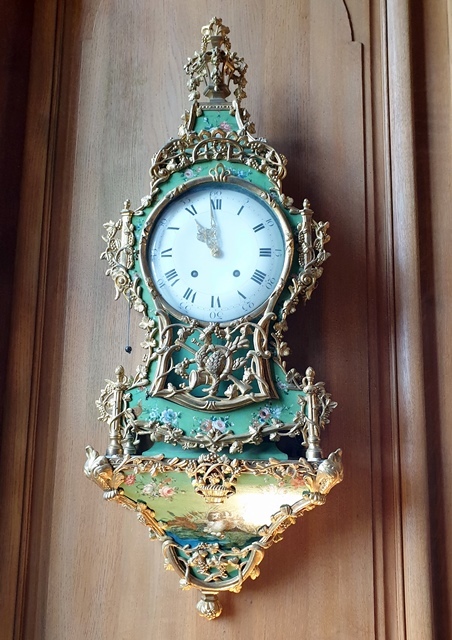 Je pensais à un déjeuner de travail, mais en fait je vais déjeuner seul à l’Ecrin de l’hôtel de Crillon, tout en ayant des séances de travail très productives. D’emblée, Boris Campanella est ouvert, précis et collaboratif. Nous travaillons sur le menu du dîner et nous nous comprenons. Le menu se construit en un temps très court car questions et réponses s’enchaînent logiquement. 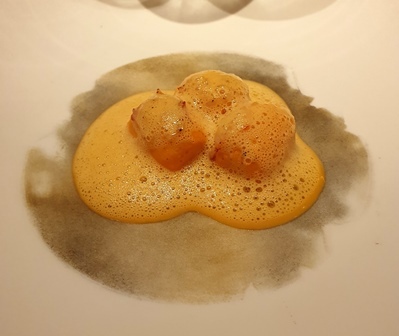 Je demande au chef quels plats pourraient me permettre d’apprécier sa cuisine ce midi et il me suggère les coquilles Saint-Jacques et le veau. 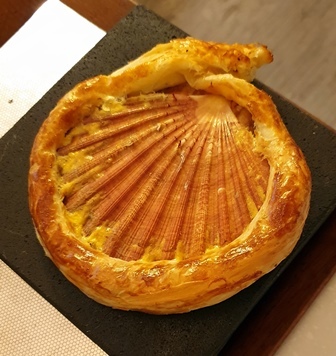 La coquille Saint-Jacques à la truffe noire se présente dans sa coquille lutée très jolie. 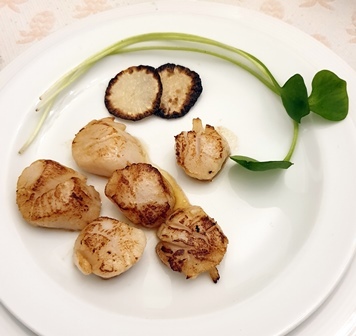 On présente les deux coquilles dans une assiette qui contient les légumes et le jus de cuisson est rajouté sur les coquilles. 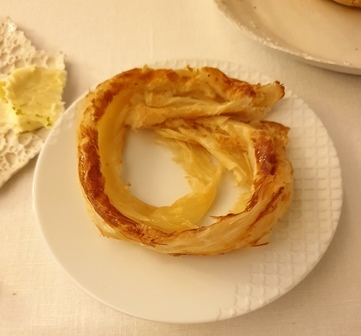 Le plat est absolument délicieux et on mange le lut comme une pâtisserie. 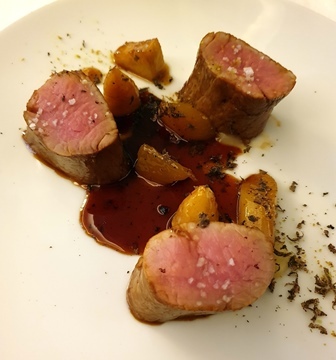 Le veau glacé à la truffe est d’une tendreté agréable. 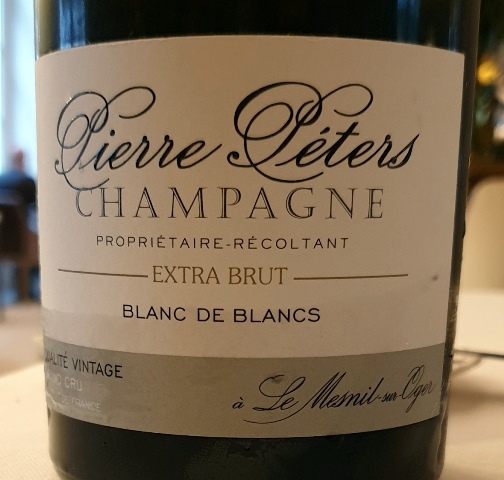 J’avais commandé au verre un Champagne Pierre Péters extra-brut blanc de blancs sans année de belle personnalité. 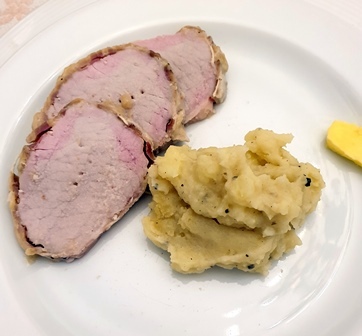 Avec le plat, il perd le côté abrupt de l’extra-brut et avec la sauce seule, divine et un peu salée du fait de la réduction, le champagne devient d’un charme envoûtant. La sauce féconde le champagne de bien belle façon. Le directeur de salle me fait remarquer que l’on m’entend glousser tant je me régale de cette cuisine. 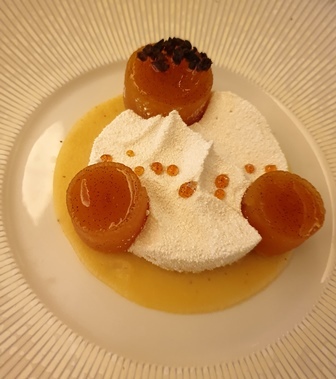 Le dessert à la pomme et au coin est un plat qui est tellement abouti qu’on ne pourrait pas le concevoir autrement. Il est divin et correspond à un niveau de trois étoiles. J’ai félicité Boris pour la qualité de cette belle cuisine. J’étais tenté de remplacer des plats du dîner par ceux que je venais de manger, tant je les ai aimés, mais l’équilibre de ce que nous avions composé en souffrirait. Le sympathique sommelier m’a proposé une liqueur de yuzu au saké qui est rafraîchissante et digestive. L’amitié ne se conçoit que si elle est fidèle. Je suis désolé de ne pas avoir été informé de l’indisponibilité de Christopher Hache que j’apprécie et avec qui j’ai une belle complicité. Mis devant le fait accompli, c’est avec Boris Campanella que l’aventure continue. J’ai vérifié que le dîner de fin janvier est en de bonnes mains. la salle de l’Ecrin, le nouveau restaurant gastronomique. 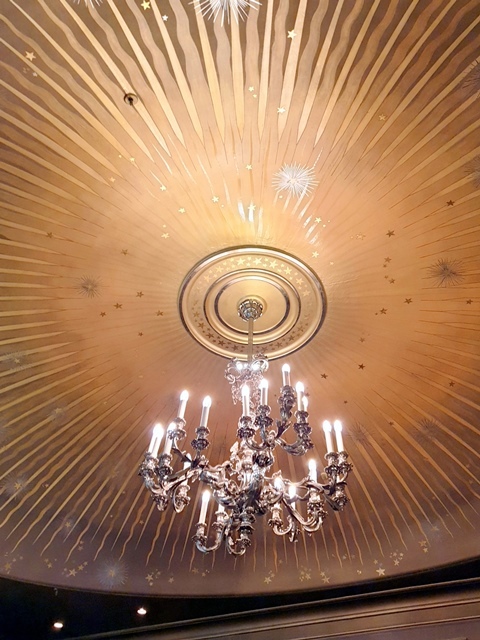 inutile de dire que je regrette l’ancienne salle où se tenait le restaurant gastronomique à la belle décoration de vrai et faux marbre, façon 18ème siècle, qui accueille maintenant le bar. 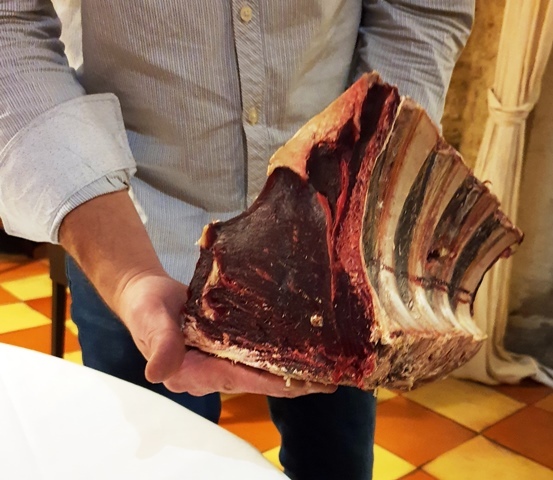 Cette entrée a été publiée dans dîners de wine-dinners le 24 janvier 2019 par François Audouze. The president of the Krug champagne house, Marguerite Henriquez, sends me a message telling me that she wishes to offer a gift to her oenology team. His idea would be a cellar visit with « special » tasting. The use of the word « special » opens the door to all the follies, so, without hesitation, I say yes. 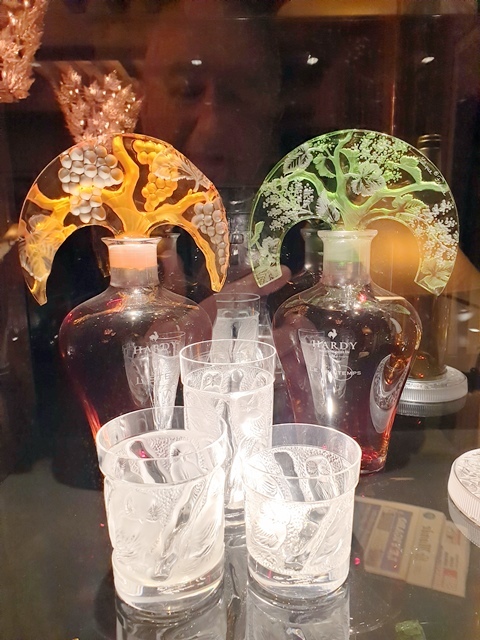 The idea that comes to me then is to treat this visit with the spirit of my dinners with a particularity: in my dinners, the bottles that I choose are among the most beautiful and the most healthy of my cellar. I try to exclude the risk. 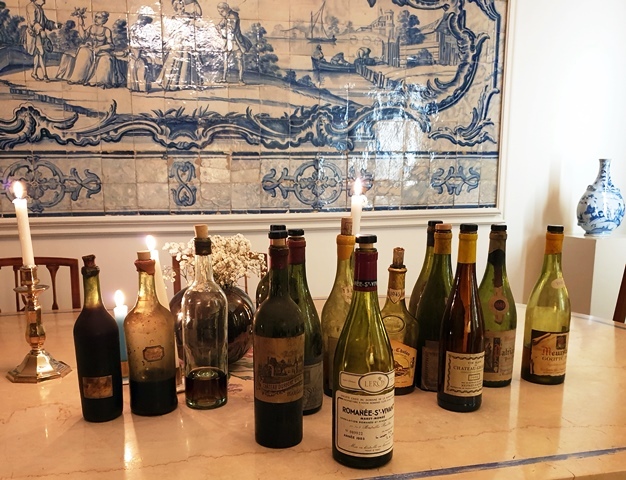 As there will be oenologists to whom I want to show « my world » of wine, I will be able to choose bottles at risk, since I have the opportunity to open others when I’m in my cellar. 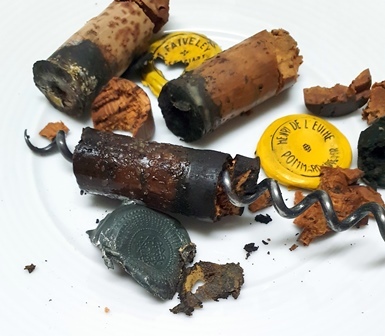 What excites me also is to be able to show that bottles that almost all sommeliers would discard and refuse to serve possess unexpected charms. 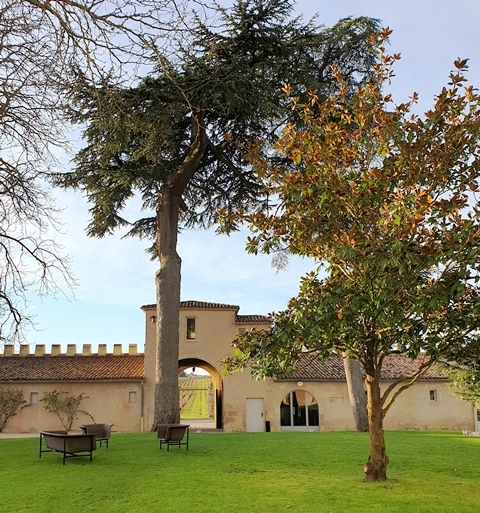 The chance smiles on the daring and also adds two good news: Olivier Krug will be visiting, and it is Arnaud Lallement, the three-star chef of the Assiette Champenoise, who will provide picnic meal in my cellar. I want to make a program of madness and this is the unique opportunity to fill a gap. 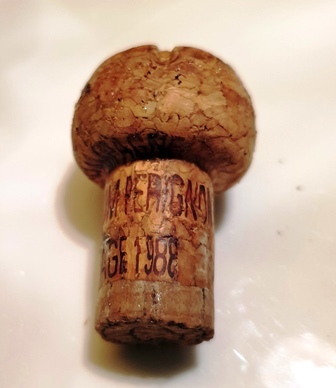 I have drunk all the vintages since 1885 until 2017 except one, the vintage 1902. The opportunity is beautiful to make this series continuous. The eight executives of the Krug house arrive early with the very chic wicker baskets of a competition picnic. The tour begins with a presentation of my vision of wine and what I want them to discover in a wine world that is not their usual world. I announce that there will undoubtedly be tasting of possible dead wines, but that this must be part of the course. After the cellar visit, which allows us to check that I have cellared some Krug (phew), everyone settles at the table. The dishes are spread out like a feast, diced ham, smoked salmon, foie gras, pâté croute pie, cheeses including camembert and epoisses, apple pie. 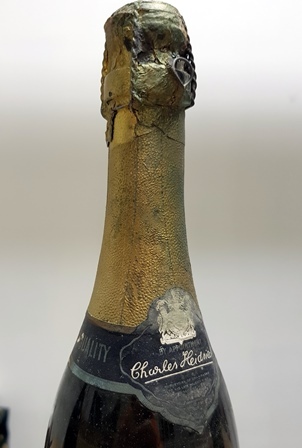 We start with a Champagne Krug Private Cuvée from the 50s / 60s which has lost 20% of its volume. The choice of such a bottle is voluntary. The color is amber with a little gray. There are two levels in this wine. On the attack, we feel bitterness that signs the age, but from the middle of the mouth, it is as if the sun rose, the wine is round, happy, with a smiling fruit. Its final is unquenchable. And what is exciting is that very quickly it no longer has any defect. I announce that the first two whites could be to throw, because at the opening of the wines at 9 o’clock, they were not encouraging. The Meursault Patriarche 1942 at very low level and dark color is the ideal candidate for the sink. At the opening anyone would have rejected and I expected the worst. What a surprise to see that it is round, balanced, discreet no doubt, but very endearing. 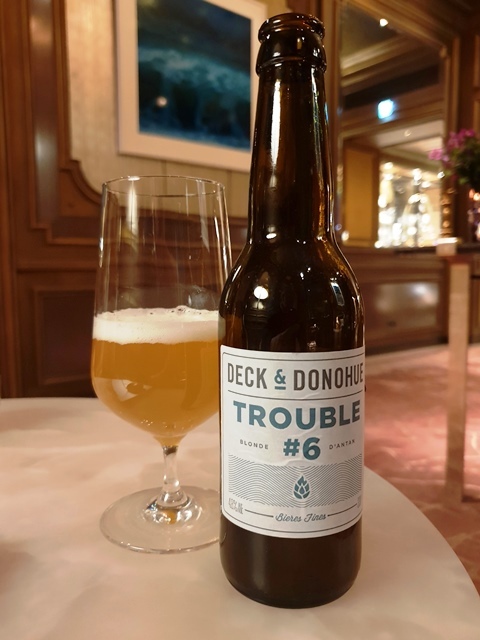 It is even drinkable and the most surprising is that it is consistent. The slow oxygenation has done its work. 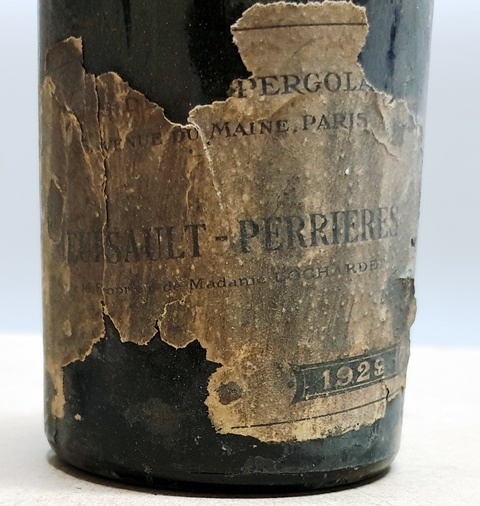 The Meursault-Perrieres Mrs. Lochardet 1929 to the lighter color and the higher level has more presence and depth. 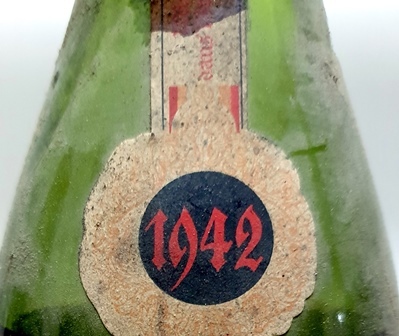 It is more strict with a nice acidity, which makes it possible to hesitate between 1942 and 1929, between roundness and righteousness. The two possible candidates for the sink have shown tastes that interest oenologists. 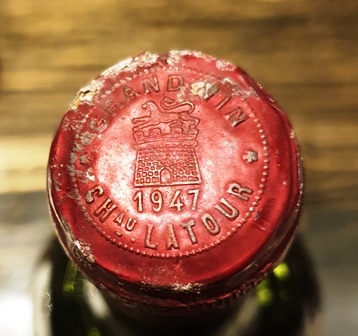 The Meursault Goutte d’Or the grand son of Henri de l’Euthe 1945 is very beautiful and juicy, with great consistency. He has a beautiful fruit. It looks like he’s thirty, it would not shock anyone. There are beautiful rays of sun in this wine. 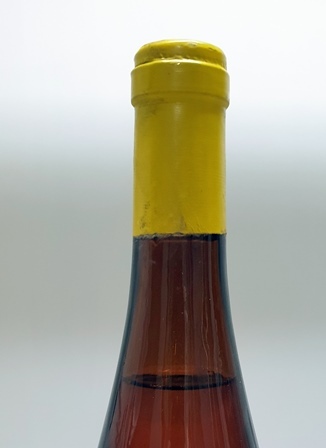 For foie gras, I want to present now a wine planned later, Château Grillet 1982 which, like the Coulée de Serrant, is one of the five great whites for Curnonsky. The level is perfect, the color is clear and immediately, we are in front of a well built wine, solid, square. He is quite esoteric because we know he is great, but we would like to know why. Because he is a colossus who does not want to show his emotions. We love him because he is rich and square but not because we are moved. 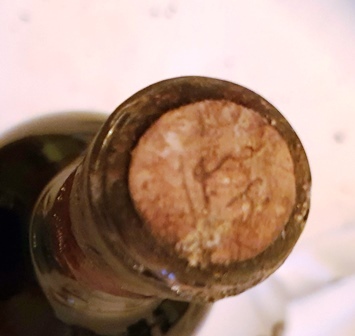 Chablis J. Faiveley 1926 creates a shock for everyone. 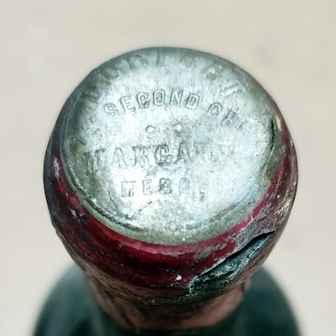 How is it possible that a wine of 1926 that is 92 years old can have the crazy youth of a wine of twenty years? In addition, it is fresh, light, primesautier, ready to all the follies. So, it’s a real shock. With this wine we enter ‘my’ world of wine, ‘my’, not because it belongs to me, but because I live there. For Bordeaux, I did not play the ease. 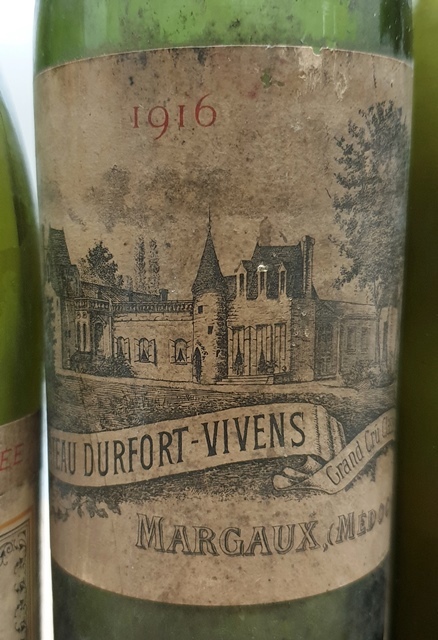 Château Durfort-Vivens 1916 had surprised me by its nose of raspberry and currants at the opening, just like the Beychevelle 1916 of the Academy of ancient wines. It still has those intonations of raspberry and currant, which could be a marker of 1916. The wine has a nice acidity, and a nice strength. It’s a great wine like the 1895 Durfort I had drunk at Bern’s Steak House in Tampa. 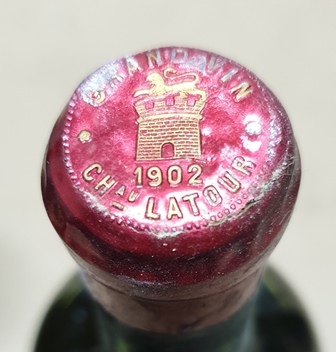 Château Latour 1902 is the first wine I drink of 1902 that allows me to have a chain without discontinuity from 1885 to 2017, to which is added fifty older vintages, but with breaks in this older chain. The nose was engaging. When I serve, oh surprise, the wine is depigmented. The first contact is quite watery. But, it is the magic of the wine, the Latour assembles, is structured. 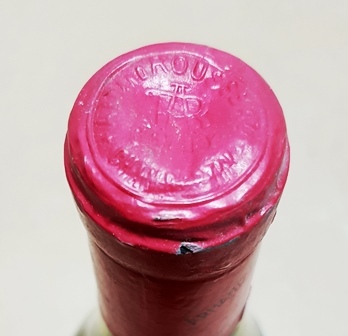 It is not really typical Latour, but we feel its nobility. It’s with my son that I’ll see how the bottom of the over-pigmented wine behaves. 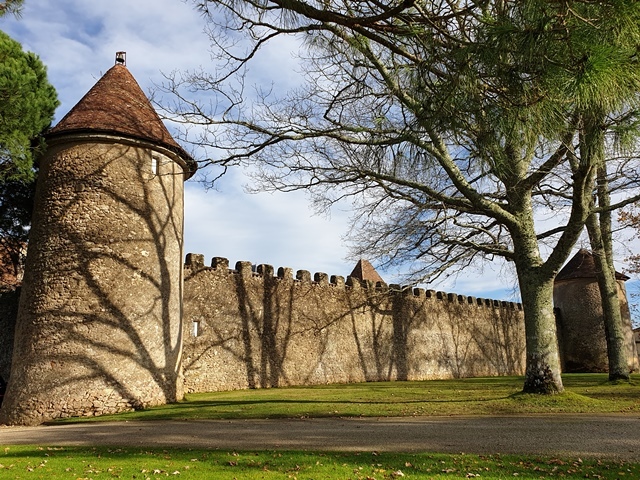 For Burgundy I wanted to make an association without competition of two wines of the same climate. 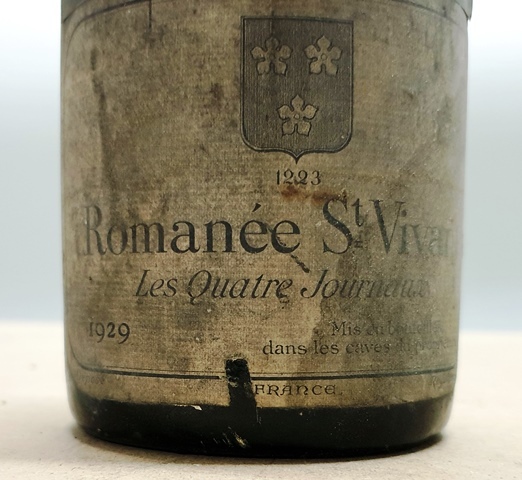 The Romanée Saint-Vivant Les Quatre Journaux 1929 at the very beautiful level is a beautiful and opulent wine, serene, solid, built with a lot of charm. It is an exceptional wine of seduction. Its parcel of Saint-Vivant is next to Romanée Conti. 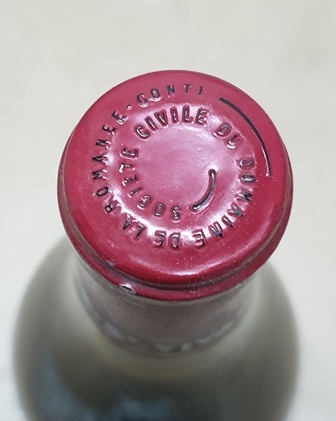 The Romanée Saint-Vivant Domaine Romanée Conti 1983 is from a weak vintage. Also its thundering scent is a big surprise. The nose is captivating and in the mouth the signature of Domaine, rose and salt is a force that I did not suspect of this wine drunk several times. This wine is brilliant. 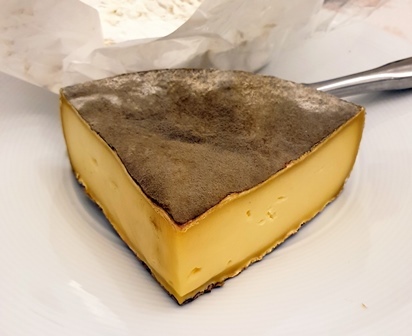 For lack of Comté, it is with the epoisses that we drink the Château Chalon Jean Bourdy 1945. What strikes is that it is all in equilibrium. The nut is discreet, the wine is dosed and accomplished. It is easy to understand because everything in it is measured and elegant. 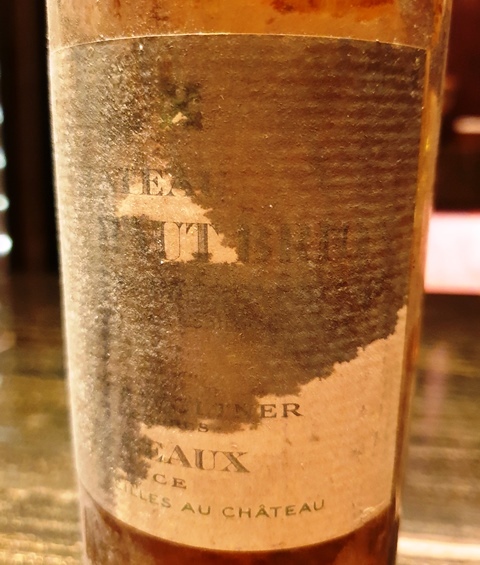 I had planned to finish with a Yquem 1970 but the atmosphere is so nice that I say to myself: let’s be crazy and go back a century. 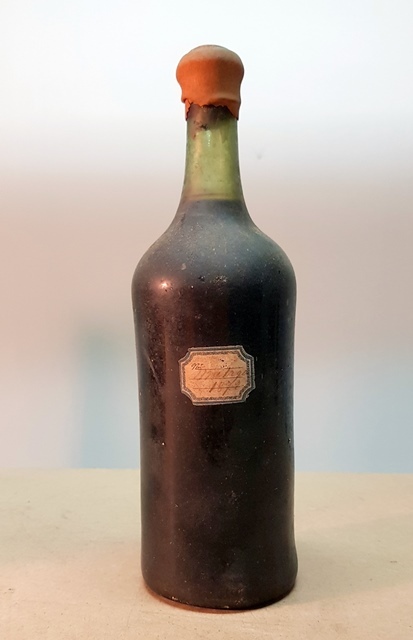 I will look for (and it is the advantage to have a meal in my cellar) a 1870 Cyprus Wine. This wine is the Arabian Nights. It explodes with pepper and liquorice but it is especially a perfect wine. While it is supposed to be soft it is dry and while it is supposed to be heavy, it is airy. Its aromatic persistence is infinite. He will have a banana republic vote. We are voting for our five favorite among twelve wines. We are nine to vote. 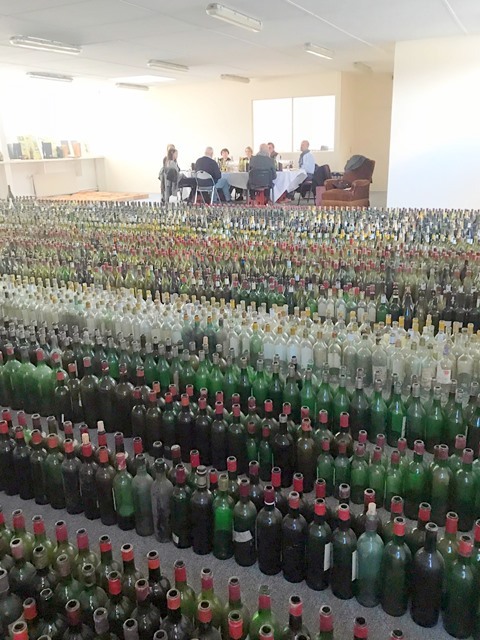 Ten out of twelve wines receive a vote. 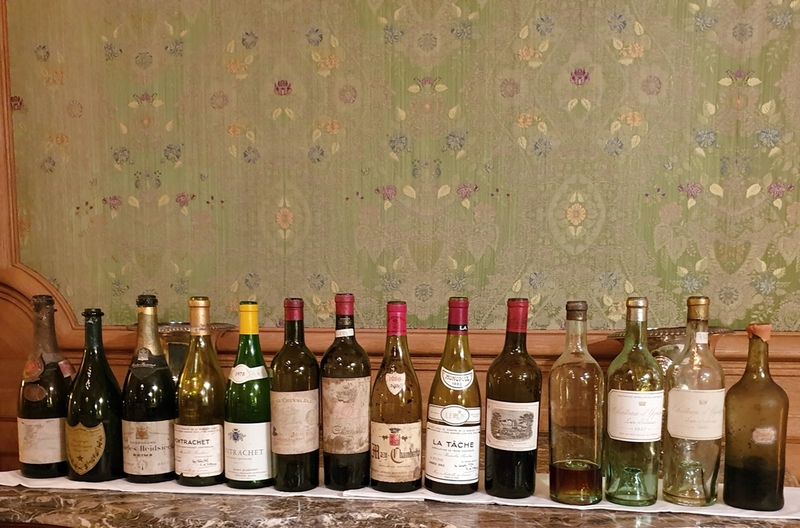 The two excluded are the Krug of the beginning but I think it was out of politeness that my guests did not vote for the wine of their house, and the Meursault 1929 yet appreciable. 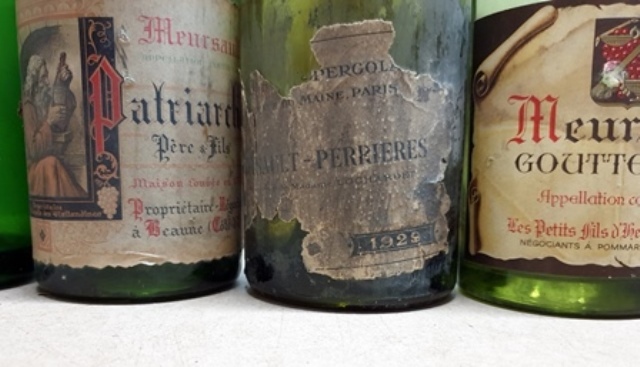 There are only three wines named first because Cyprus has cannibalized six first votes, the wine of Romanée Conti has two first votes and the Meursault 1945 has a vote of first. 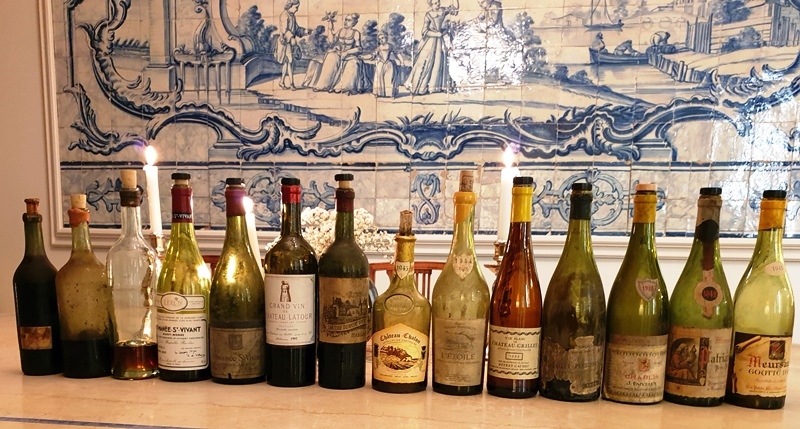 The ranking of the consensus would be: 1 – Wine of Cyprus 1870, 2 – Romanée Saint-Vivant Domaine de la Romanée Conti 1983, 3 – Romanée Saint-Vivant Les Quatre Journaux 1929, 4 – Chablis J. Faiveley 1926, 5 – Meursault Goutte d’Or the grandsons of Henry of Euthe 1945, 6 – Château Latour 1902. 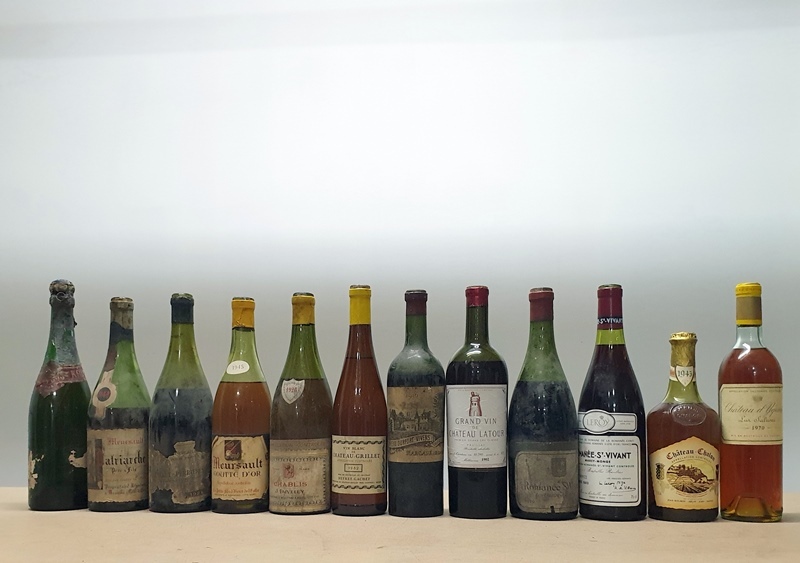 My classification: 1 – 1870 Cyprus Wine, 2 – Romanée Saint – Vivant Domaine de la Romanee Conti 1983, 3 – Romanée Saint – Vivant Les Quatre Journaux 1929, 4 – Chablis J. Faiveley 1926, 5 – Château Grillet 1982. I greatly appreciated the listening attitude of my guests. They entered a world they practice little or not and have discovered that the life of a wine has no limit. The atmosphere of dinette to the good franquette, but franquette three stars anyway, allowed exciting conversations. I was delighted to receive those who make a champagne that I love. This form of meal where we give to bottles at risk the possibility of expressing themselves pleases me a lot. Thank you Maggie for allowing this moment of sharing and warm friendship. 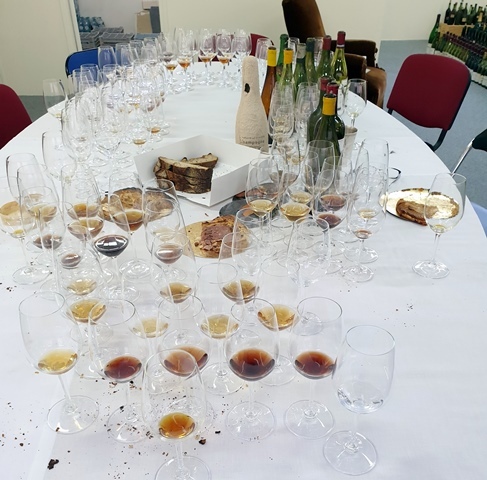 The day after the reception of Krug executives for a picnic in my cellar, I drank with my son, who was not expecting it, the remains of the wines of the lunch, plus two wines that remained from dinner in Yquem, that I absolutely wanted him to discover. My wife has planned scallops with thin slices of fried black radish, a veal cooked at low temperature with a truffle purée, cheeses and meringue hemispheres sprinkled with chocolate chips that once evoked frizzy heads. 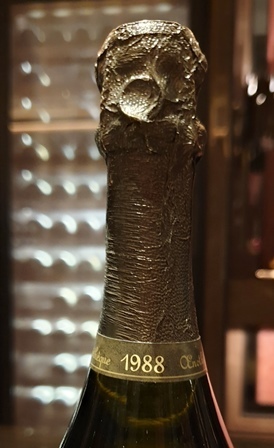 Champagne Krug Private Cuvée 50/60 was finished yesterday, which proves that we liked it. 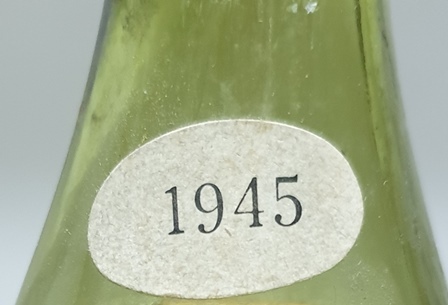 The Meursault Patriarche 1942 still has a gray amber color. Immediately I feel that he is clearly better than yesterday, broad and happy, with good fruit. What a surprise when we know that this wine would have been ignored by amateurs who would not have known that it was necessary to wait. 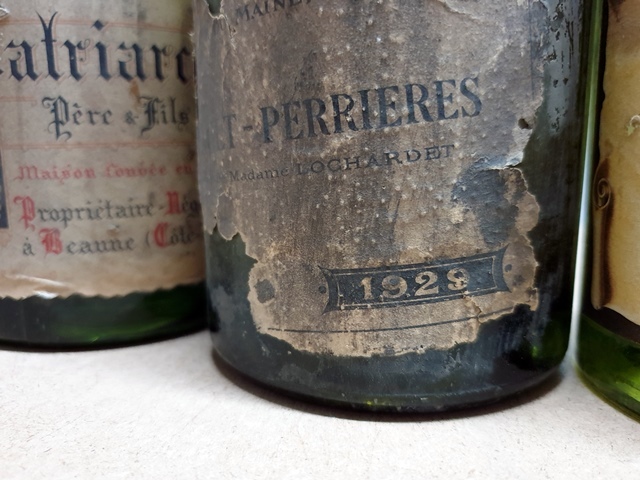 The Meursault-Perrieres Mrs. Lochardet 1929 is also wider than the day before but it still kept its strict character. Yesterday we could hesitate between 1942 and 1929 but today doubt is no longer allowed, the 1942 is much more generous than the 1929 yet a great year. 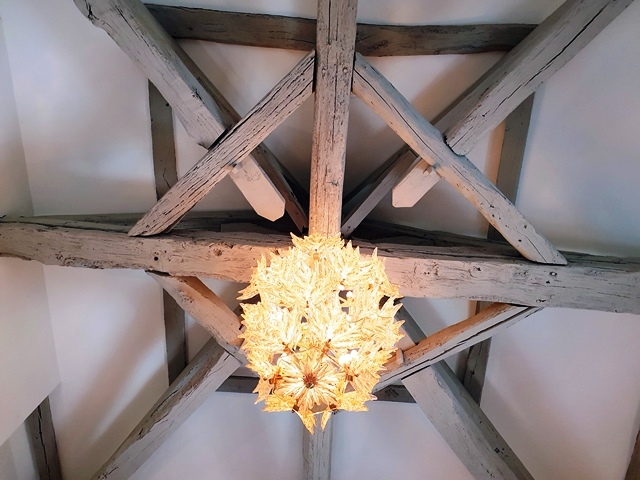 I serve the Meursault Goutte d’Or the grand sons of Henri de l’Euthe 1945 and I see the face of my son who is transformed. He is as if paralyzed. He tells me he never drank that. He finds this wine absolutely perfect. I agree with his analysis even if I do not have such a strong emotion. The wine is now imperial, powerful, broad and opulent. 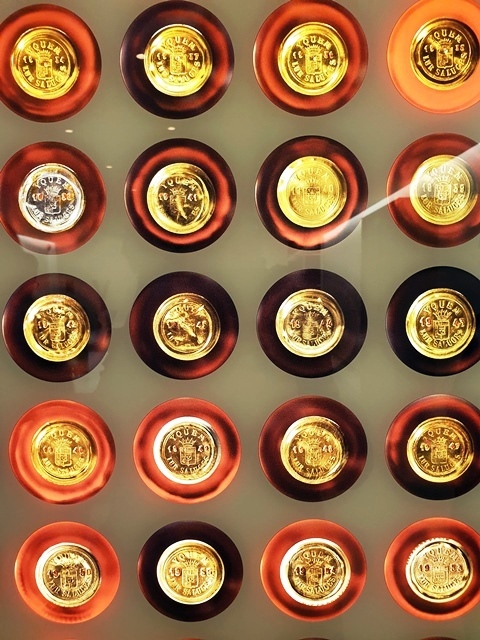 It is properly named because every drop of this wine is gold. This wine is just happiness with a rare depth. Here are three wines that are better than yesterday. 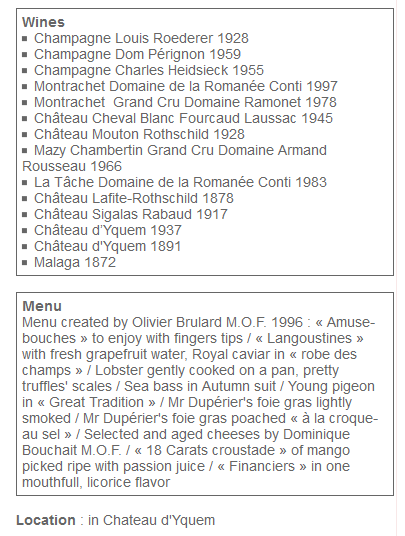 The Château Grillet 1982 is wider than yesterday, solidly camped. He gives more emotion, but still remains on his reserve. Solid, he is brilliant, without delivering yet what time will give him one day. 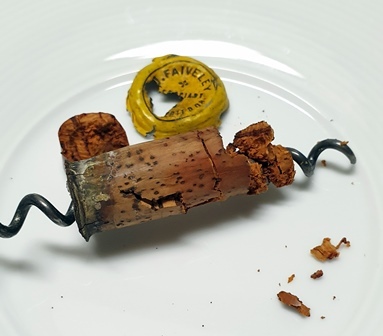 Chablis J. Faiveley 1926 is a surprise as big as yesterday. He is of a youth that cannot be imagined. 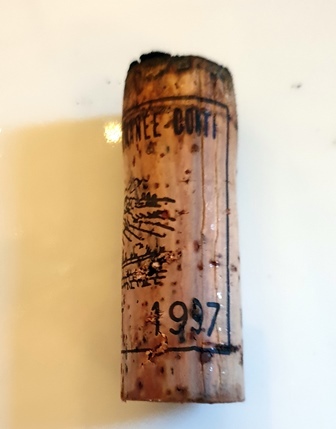 Like father such sons, because yesterday I told my guests that if it was said that this is a 1988 wine nobody would contradict and here is my son who says: we would give him twenty years. This wine is an enigma, fluid, delicate, crazy youth. He is at the same level as yesterday, crazy charm. 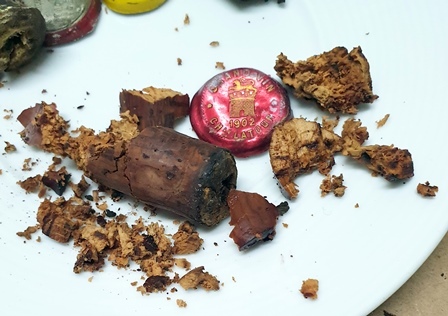 The Château Durfort-Vivens 1916 has lost some of its red fruits, even if you feel them, and it has become stricter with a small hollow in the middle of the mouth. I cannot say that the night has improved it. The reaction of my son on the Meursault 1945, I will have with the Château Latour 1902. 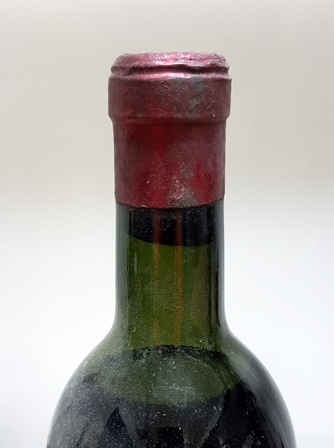 First of all I expected that the depigmentation of the beginning of bottle would give for what remains a black wine loaded with all the pigments, but this is not the case. It is only at lees level that the liquid will be black. But I am absolutely overwhelmed by this wine that has become a monster of charm and delicacy. 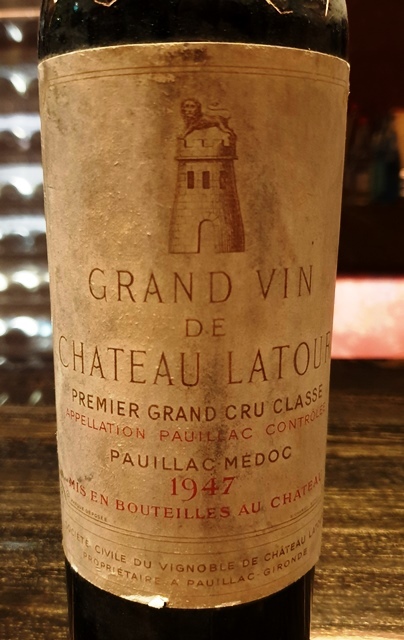 Yesterday, I was looking for his soul Latour and today I have in front of me one of the greatest Latour I had the chance to drink, all lace and suggestion. I enjoy this moment and my son is more reserved on this wine. So we had our moments of grace on two different wines. This Latour is clearly above yesterday. 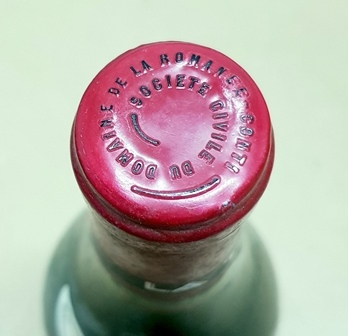 The Romanée Saint-Vivant Les Quatre Journaux 1929 is a racy wine, noble and powerful. He is a lord. He is exactly in line with what he said yesterday. It is a grand and flourishing wine. What a shame that there was so little left, but all the better for my guests yesterday. The Romanée Saint-Vivant Domain Romanée Conti 1983 is significantly less brilliant than yesterday. It was pink and salt. It is still salt, but has lost the flower for a rather roasted taste. He lost his freshness and got a little stuck. He is good of course but does not have the spark of genius that I had perceived yesterday. 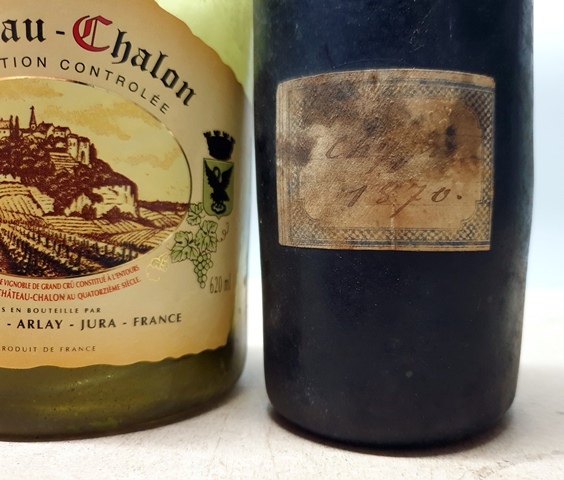 We do not drink Château Chalon Jean Bourdy 1945 that we keep for a future meal, because I wish we would now taste three exceptional liquoreux. 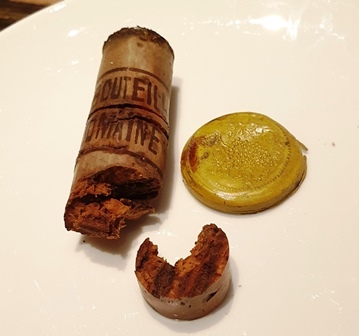 There remains a small part of the 1891 Chateau d’Yquem from the dinner at Yquem. 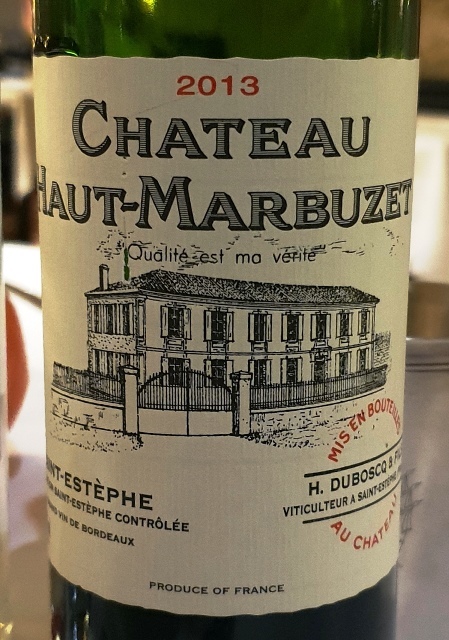 One can feel a tiny trace of evaporation that has extinguished some fires, but this Yquem is still splendid, with evocations of orange zest extremely delicate. He is always so well structured. My wife drinks what makes me happy. We turn the page of a historic wine of the most beautiful nobility. The following exercise excites me to the highest point. Because it is very rare that I put together so old muscatés sweet wines. I put one at the end of the meal and I do not remember to have put two. 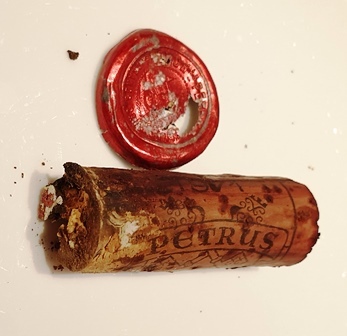 The 1870 Cyprus Wine is lively, very dry, with a very nice little bitterness and its markers are pepper and licorice. 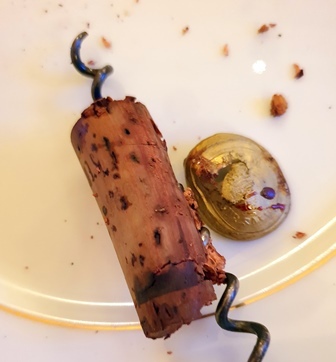 The 1872 Malaga I had included in the dinner at Yquem is a little rounder and fat. It has more sun and its markers are coffee and cocoa. So here are two wines that I have each ranked first in the meal where he was who are face to face. 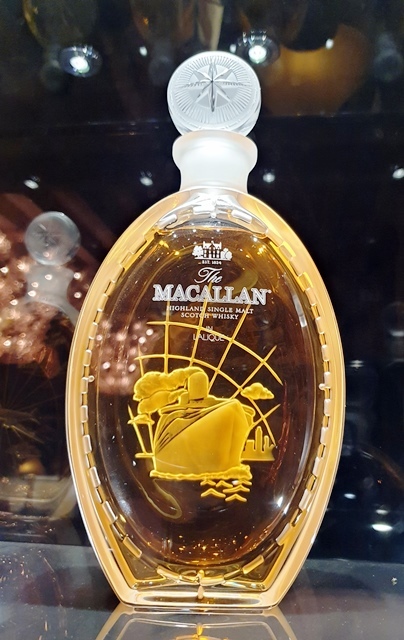 They are very different and I must say that, as for my son, the Malaga is my favorite because it has more joy of life and depth. Both wines are marvels, with endless aromatic persistence, and deserve the first places they had in my votes, in the two meals where they were placed, in final bouquet. This second tour of the wines of the day before leads me to questions. 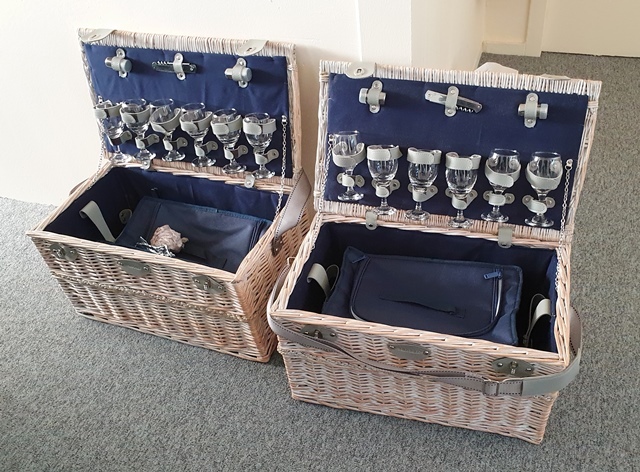 I opened the wines yesterday at 9 o’clock and they may not have had enough time to assemble. They were served and stirred, moved in my car in the cave-house route, and a majority of them are better today than yesterday. Does this mean that I should have opened them the day before? Or would a carafe after slow oxygenation have brought them to the state they had today? This is a subject that I will have to dig. 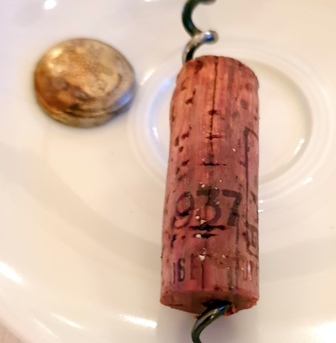 In addition, the youngest wine, 1983 Romanée Conti is the only one that has regressed frankly when he was brilliant yesterday. Does this extra day only benefit old wines? 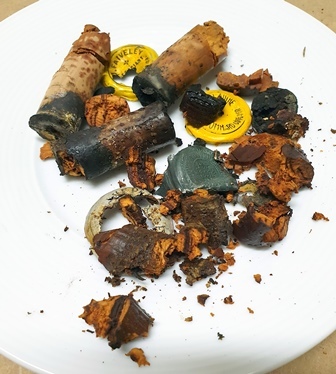 In addition, it was the wines that had the lowest levels in the bottle that benefited the most from additional oxygenation. These are some questions that I will have to solve. Because it is fascinating to see how much the elected representatives of the day of my son and me, Meusault 1945 and Latour 1902 have progressed, beyond all expectations. Wine is a mystery and I’m never at the end of its surprises. 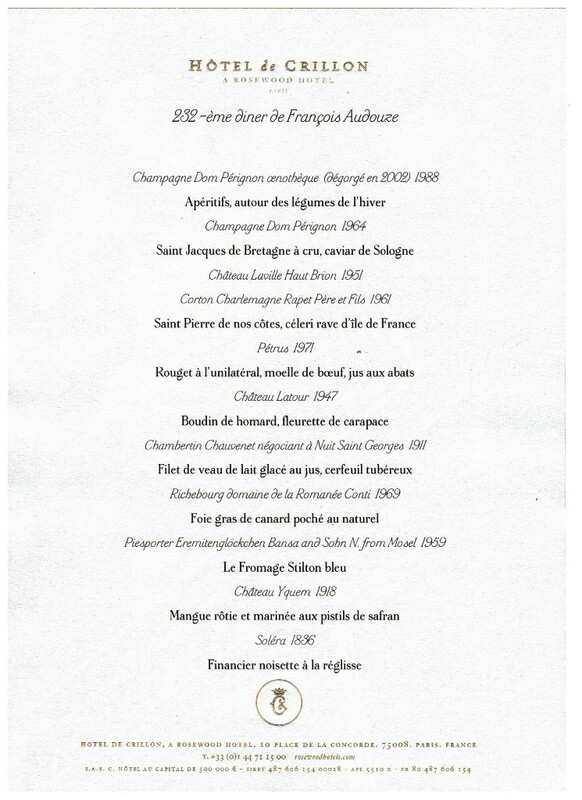 Cette entrée a été publiée dans dîners de wine-dinners le 15 décembre 2018 par François Audouze. Le lendemain de la réception des cadres de Krug pour un piquenique dans ma cave, j’ai bu avec mon fils, qui ne s’y attendait pas, les fonds de bouteilles du déjeuner, plus deux vins qui restaient du dîner à Yquem, que je voulais absolument qu’il découvre. 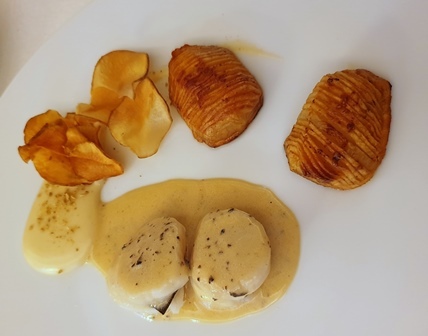 Ma femme a prévu des coquilles Saint-Jacques avec de fines tranches de radis noir poêlées, un veau cuit à basse température avec une purée à la truffe, des fromages et ces hémisphères de meringue saupoudrés de copeaux de chocolat qui évoquaient jadis des têtes crépues. 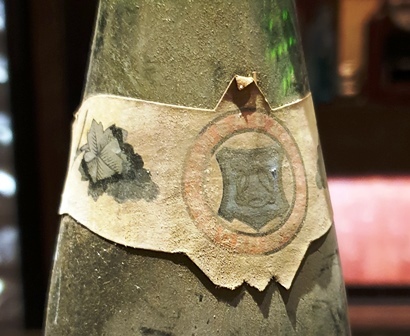 Le Champagne Krug Private Cuvée années 50/60 avait été fini hier, ce qui prouve qu’on l’avait aimé. 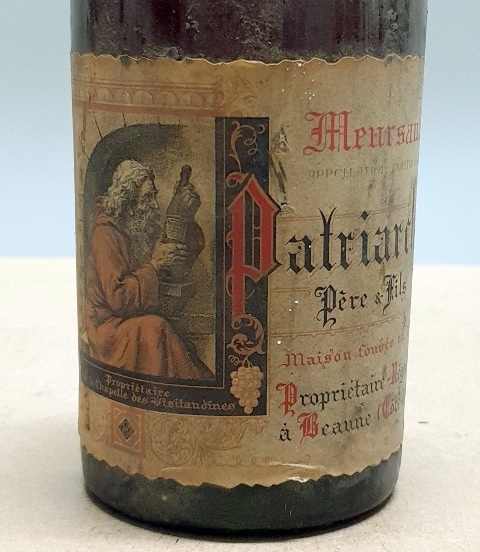 Le Meursault Patriarche 1942 a toujours une couleur d’un ambre grisé. Immédiatement je sens qu’il est nettement meilleur qu’hier, large et joyeux, au beau fruit. 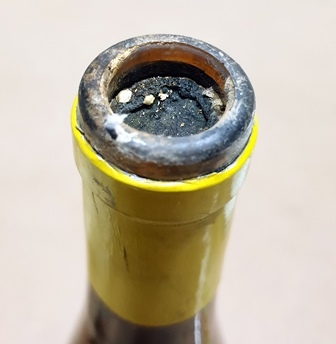 Quel étonnement quand on sait que ce vin aurait été ignoré par des amateurs qui n’auraient pas su qu’il fallait attendre. Le Meursault-Perrieres Mme Lochardet 1929 est lui aussi plus large que la veille mais il a quand même gardé son caractère strict. Hier on pouvait hésiter entre le 1942 et le 1929 mais aujourd’hui le doute n’est plus permis, le 1942 est beaucoup plus généreux que le 1929 pourtant d’une grande année. Je sers le Meursault Goutte d’Or les petits fils d’Henri de l’Euthe 1945 et je vois le visage de mon fils qui se transforme. Il est comme tétanisé. Il me dit qu’il n’a jamais bu cela. Il trouve ce vin absolument parfait. Je rejoins son analyse même si je n’ai pas une émotion aussi forte. Le vin est maintenant impérial, puissant, large et opulent. 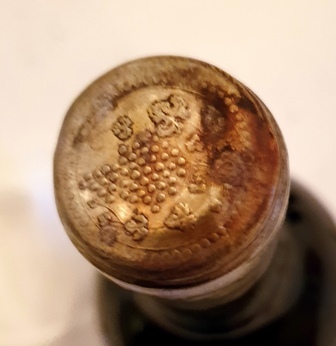 Il porte bien son nom car chaque goutte de ce vin est de l’or. 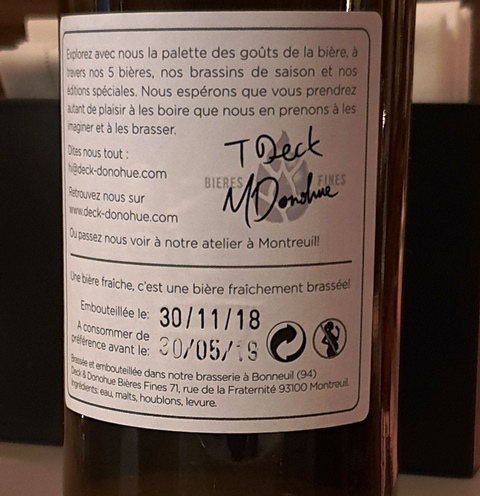 Ce vin n’est que du bonheur avec une profondeur rare. 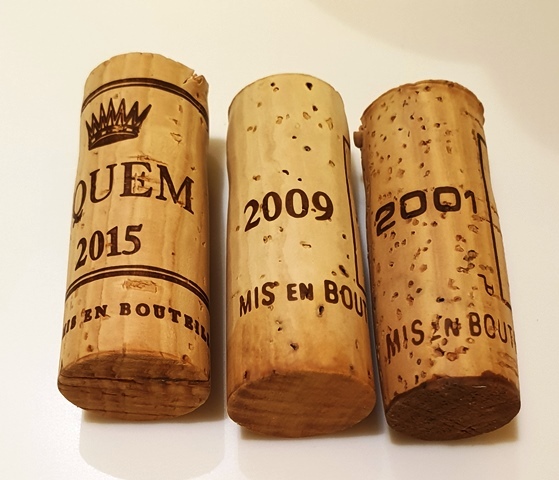 Voilà trois vins qui se présentent mieux qu’hier. Le Château Grillet 1982 est plus large qu’hier, solidement campé. Il donne plus d’émotion, mais reste encore sur sa réserve. Solide, il est brillant, sans délivrer ce que le temps lui donnera un jour. 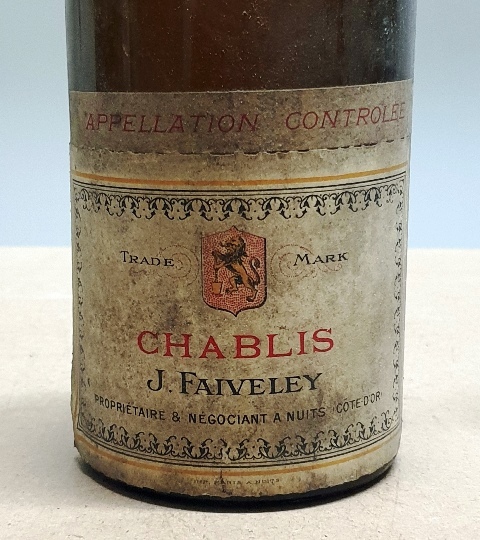 Le Chablis J. Faiveley 1926 est une surprise aussi grande qu’hier. Il est d’une jeunesse qu’on ne peut pas imaginer. 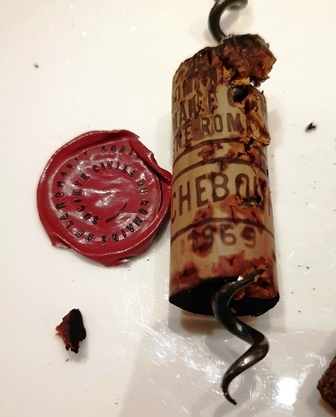 Tel père tels fils, car hier j’avais dit à mes invités que si on disait qu’il s’agit d’un vin de 1988 personne ne contredirait et voici que mon fils dit : on lui donnerait vingt ans. Ce vin est une énigme, fluide, délicat, de folle jeunesse. Il est au même niveau qu’hier, fou de charme. 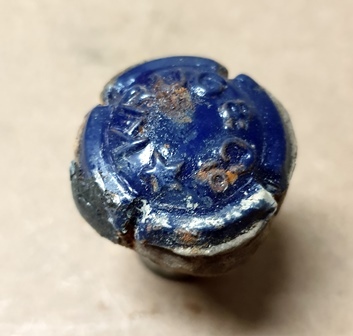 Le Château Durfort-Vivens 1916 a perdu un peu de ses fruits rouges, même si on les ressent, et il est devenu plus strict avec toutefois un petit creux en milieu de bouche. Je ne peux pas dire que la nuit l’a amélioré. La réaction de mon fils sur le Meursault 1945, je vais l’avoir avec le Château Latour 1902. 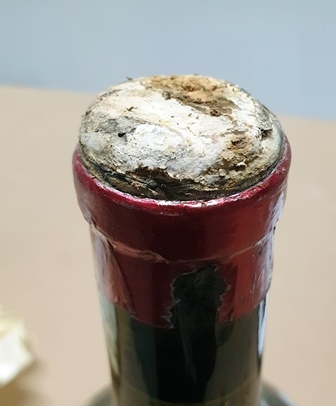 Tout d’abord je m’attendais que la dépigmentation du début de bouteille donnerait pour ce qui reste un vin noir chargé de tous les pigments, mais ce n’est pas le cas. Ce n’est qu’au niveau des lies que le liquide sera noir. 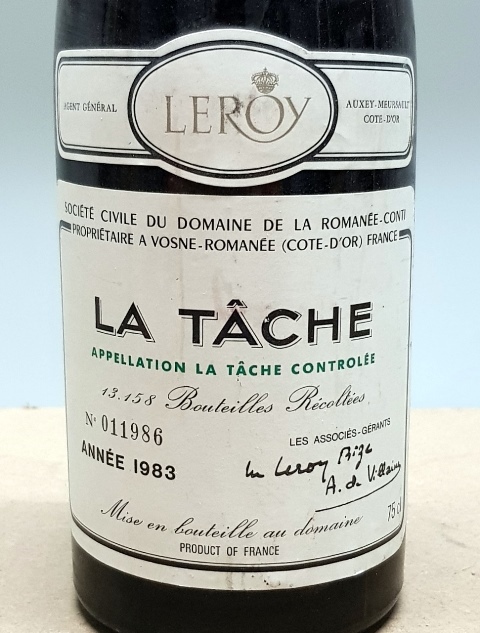 Mais je suis absolument subjugué par ce vin qui est devenu un monstre de charme et de de délicatesse. 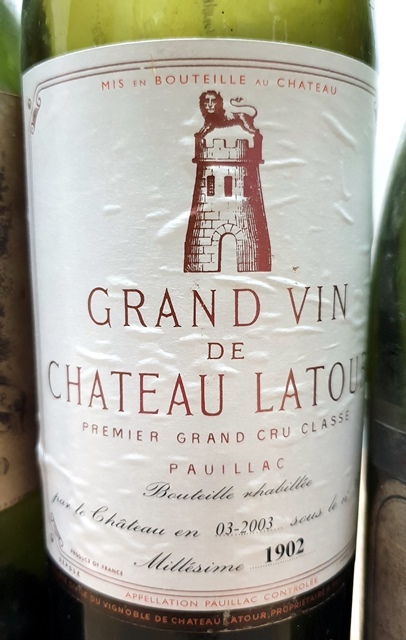 Hier, je cherchais son âme de Latour et aujourd’hui j’ai en face de moi l’un des plus grands Latour que j’aie eu la chance de boire, tout en dentelle et en suggestion. Je jouis de ce moment et mon fils est plus réservé sur ce vin. Nous avons donc eu nos moments de grâce sur deux vins différents. Ce Latour s’est montré nettement au-dessus d’hier. 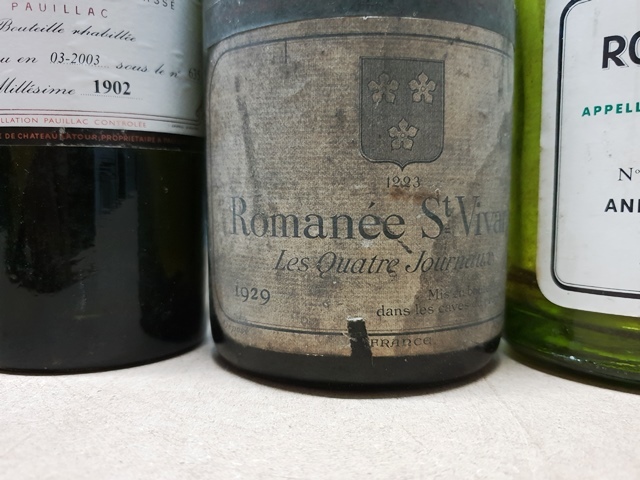 La Romanée Saint-Vivant Les Quatre Journaux 1929 est un vin racé, noble et puissant. C’est un seigneur. Il est tout-à-fait dans la ligne de ce qu’il exposait hier. C’est un vin grandiose et épanoui. Quel dommage qu’il en restât si peu, mais tant mieux pour mes invités d’hier. 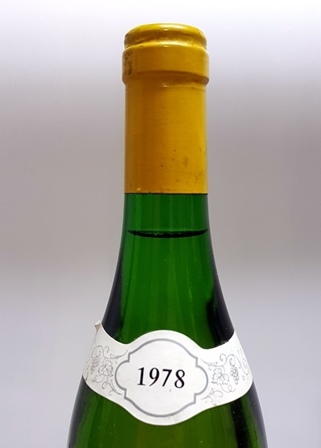 La Romanée Saint-Vivant Domaine de la Romanée Conti 1983 est nettement moins brillant qu’hier. Il était rose et sel. Il est toujours sel, mais a perdu la fleur pour un goût assez torréfié. Il a perdu de sa fraîcheur et s’est un peu coincé. Il est bon bien sûr mais n’a pas l’étincelle de génie que j’avais perçue hier. 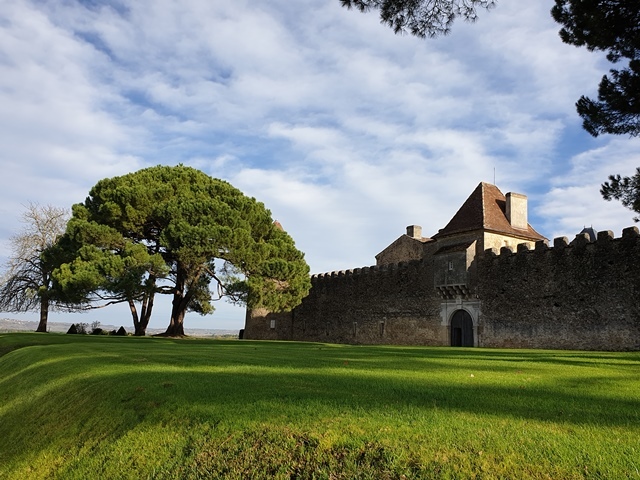 Nous ne buvons pas le Château Chalon Jean Bourdy 1945 que nous gardons pour un futur repas, car je souhaite que nous goûtions maintenant trois liquoreux exceptionnels. 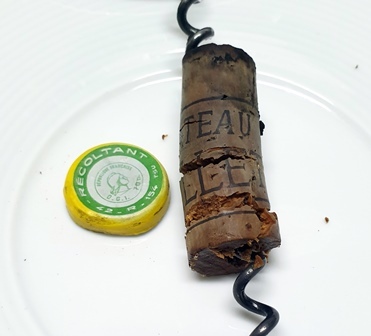 Il reste un fond de bouteille du Château d’Yquem 1891 du dîner à Yquem. On peut sentir une infime trace d’évaporation qui a éteint quelques feux, mais cet Yquem est encore splendide, avec des évocations de zestes d’orange extrêmement délicates. Il est toujours aussi bien structuré. Ma femme en boit ce qui me fait plaisir. 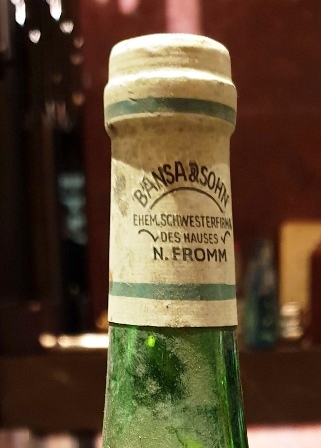 Nous tournons la page d’un vin historique de la plus belle des noblesses. L’exercice qui va suivre m’excite au plus haut point. Car il est très rare que je mette ensemble des liquoreux muscatés aussi vieux. J’en mets un en fin de repas et je n’ai pas le souvenir d’en avoir mis deux. 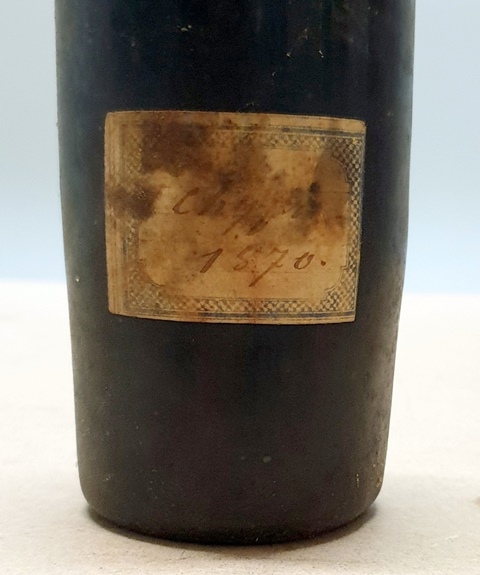 Le Vin de Chypre 1870 est vif, très sec, avec une petite amertume très sympathique et ses marqueurs sont le poivre et la réglisse. 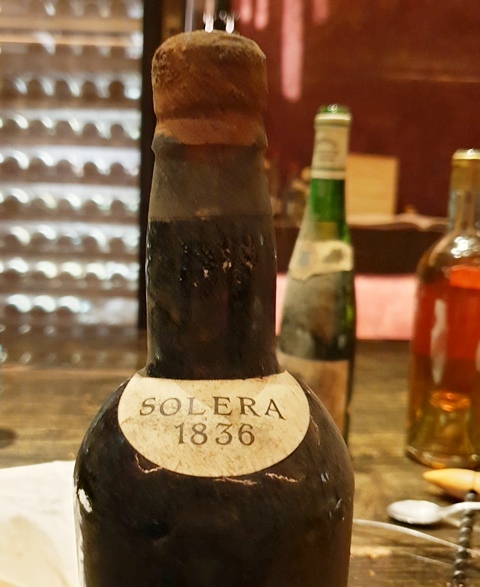 Le Malaga 1872 que j’avais inclus dans le dîner à Yquem est un peu plus rond et gras. Il a plus de soleil et ses marqueurs sont le café et le cacao. 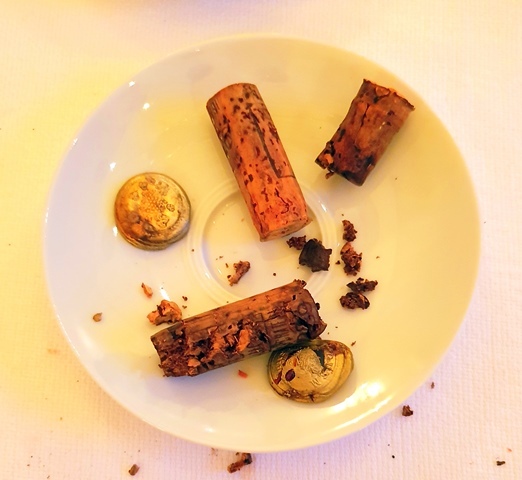 Voilà donc deux vins que j’ai classés chacun premier dans le repas où il était qui se trouvent face à face. Ils sont très différents et je dois dire que, comme pour mon fils, le Malaga est mon préféré, car il a plus de joie de vivre et de profondeur. 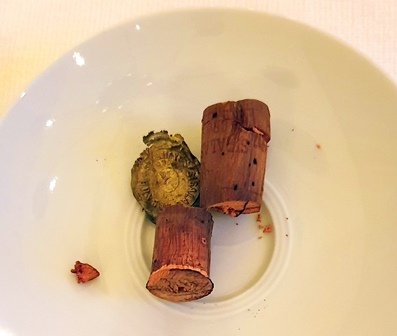 Les deux vins sont des merveilles, avec des persistances aromatiques infinies, et méritent bien les places de premier dans mon vote, dans les deux repas où ils ont été placés, en bouquet final. Cette deuxième tournée des vins de la veille me conduit à des questions. J’avais ouvert les vins hier à 9 heures et ils n’ont peut-être pas eu assez de temps pour s’assembler. Ils ont été servis et remués, ont bougé dans ma voiture dans le trajet cave – maison, et une majorité d’entre eux sont meilleurs aujourd’hui qu’hier. Est-ce à dire que j’aurais dû les ouvrir la veille ? Ou est-ce qu’un carafage après oxygénation lente les aurait amenés à l’état qu’ils ont eu aujourd’hui ? C’est un sujet qu’il me faudra creuser. 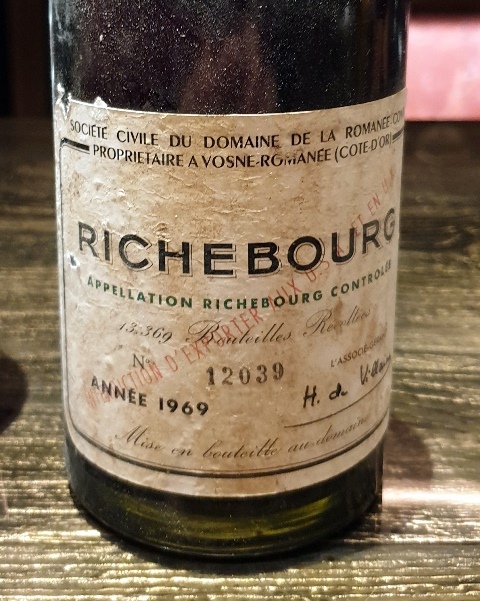 Par ailleurs, le vin le plus jeune, le 1983 de la Romanée Conti est le seul qui a franchement régressé alors qu’il était brillant hier. 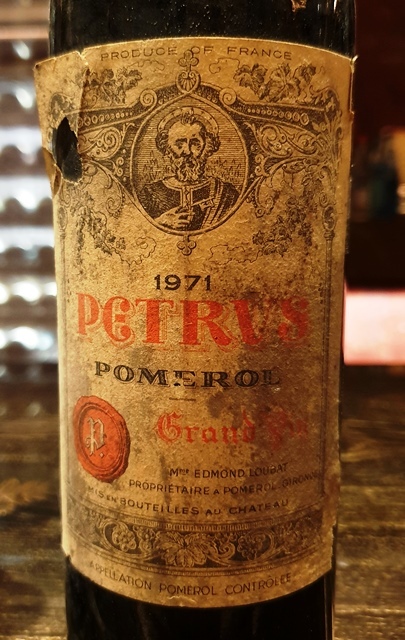 Est-ce que cette journée de plus ne profite qu’aux vins anciens ? Par ailleurs, ce sont les vins qui avaient les niveaux les plus bas dans la bouteille qui ont profité le plus d’une oxygénation supplémentaire. Voilà des questions qu’il va falloir que je résolve. Car c’est fascinant de voir à quel point les élus du jour de mon fils et de moi, le Meusault 1945 et le Latour 1902 ont progressé, au-delà de toute attente. Le vin est un mystère et je ne suis jamais au bout de ses surprises. Surprise de mon fils quand il voit toutes ces bouteilles à finir !!! La présidente de la maison de champagne Krug, Marguerite Henriquez, m’envoie un message me disant qu’elle souhaite offrir un cadeau à son équipe d’œnologie. Son idée serait une visite de cave avec dégustation « spéciale ». L’utilisation du mot « spéciale » ouvre la porte à toutes les folies, aussi, sans hésiter, je lui dis oui. L’idée qui me vient ensuite, c’est de traiter cette visite comme un de mes dîners avec une particularité : dans mes dîners, les bouteilles que je choisis sont parmi les plus belles et les plus saines de ma cave. J’essaie d’exclure le risque. Comme il y aura des œnologues à qui je veux montrer mon « monde » du vin, je vais pouvoir choisir des bouteilles à risque, puisque j’ai instantanément la possibilité d’en ouvrir d’autres lorsque l’on est dans ma cave. 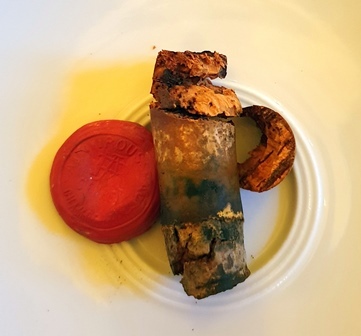 Ce qui m’excite aussi, c’est de pouvoir montrer que des bouteilles que presque tous les sommeliers écarteraient et refuseraient de servir possèdent des charmes inattendus. La chance sourit aux audacieux aussi s’ajoutent deux bonnes nouvelles : Olivier Krug sera de la visite, et c’est Arnaud Lallement, le chef trois étoiles de l’Assiette Champenoise, qui va fournir le piquenique du repas dans ma cave. J’ai envie de faire un programme de folie et c’est l’occasion unique de combler une lacune. J’ai bu tous les millésimes depuis 1885 jusqu’à 2017 sauf un, le millésime 1902. L’occasion est belle de rendre cette série continue. Les huit cadres de la maison Krug arrivent en avance avec les paniers en osier très chics d’un piquenique de compétition. La visite commence par un exposé que je fais de ma vision du vin et de ce que je souhaite faire découvrir dans un monde de vins qui n’est pas leur monde habituel. J’annonce qu’il y aura sans doute à la dégustation des vins morts, mais que cela doit faire partie du parcours. Après la visite de cave, qui permet de vérifier notamment que j’ai quelques Krug en cave (ouf), tout le monde s’installe à table. Les mets sont étalés comme en un festin, jambon en dés, saumon fumé, foie gras, pâté en croûte, fromages dont camembert et époisses, tarte aux pommes. 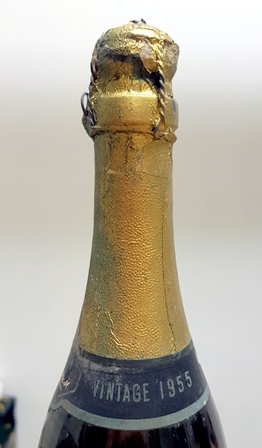 Nous commençons par un Champagne Krug Private Cuvée des années 50/60 qui a perdu 20% de son volume. 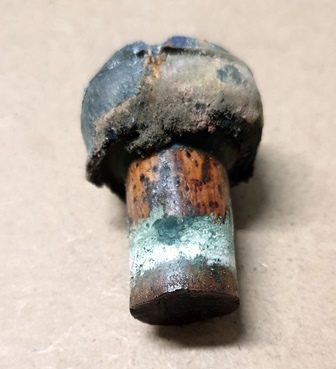 Le choix d’une telle bouteille est volontaire. La couleur est ambrée avec un peu de gris. 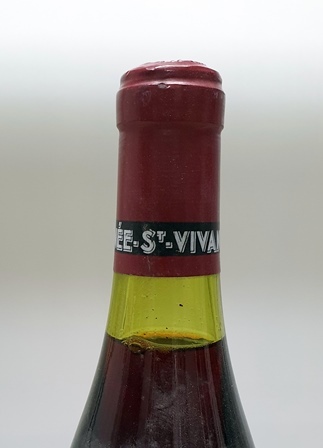 Il y a deux niveaux dans ce vin. A l’attaque, on ressent des amertumes qui signent l’âge, mais dès le milieu de bouche, c’est comme si le soleil se levait, le vin est rond, joyeux, d’un fruit souriant. Son finale est inextinguible. Et ce qui est passionnant c’est que très rapidement il n’a plus aucun défaut. J’annonce que les deux premiers blancs pourraient être à jeter, car lors de l’ouverture des vins à 9 heures, ils n’étaient pas encourageants. Le Meursault Patriarche 1942 au niveau très bas et à la couleur foncée est le candidat idéal pour l’évier. A l’ouverture n’importe qui l’aurait rejeté et je m’attendais au pire. Quelle surprise de voir qu’il est rond, équilibré, discret sans doute, mais très attachant. Il est même buvable et le plus surprenant est qu’il est cohérent. L’oxygénation lente a fait son œuvre. Le Meursault-Perrieres Mme Lochardet 1929 à la couleur plus claire et au niveau plus élevé a plus de présence et de profondeur. Il est plus strict avec une belle acidité, ce qui fait qu’on peut hésiter entre le 1942 et le 1929, entre rondeur et droiture. Les deux candidats possibles à l’évier ont montré des goûts qui intéressent les œnologues. 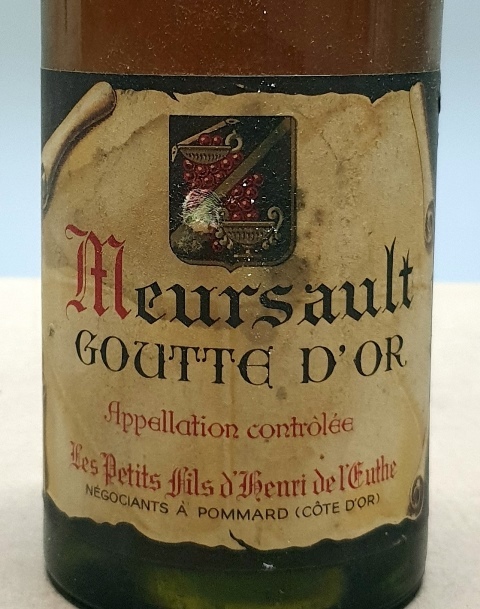 Le Meursault Goutte d’Or les petits fils d’Henri de l’Euthe 1945 très beau est juteux, de belle mâche. Il a un beau fruit. On dirait qu’il a trente ans, cela ne choquerait personne. 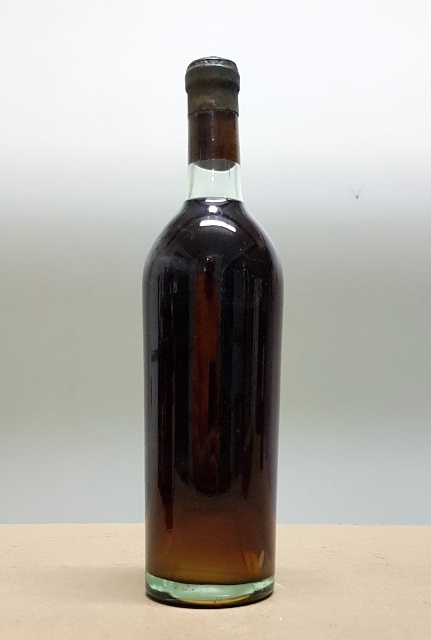 Il y a de beaux rayons de soleil dans ce vin. 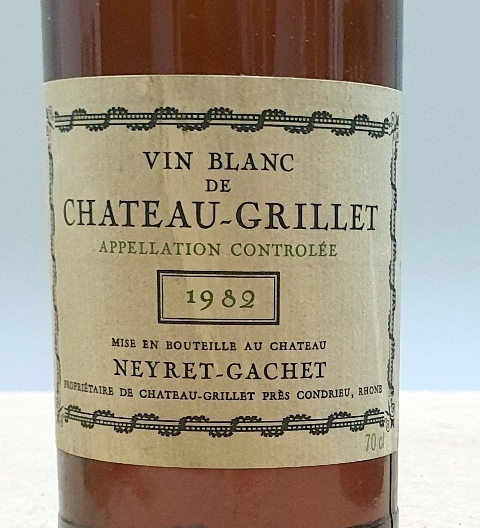 Pour le foie gras, j’ai envie de présenter maintenant un vin prévu plus tard, le Château Grillet 1982 qui, comme la Coulée de Serrant, fait partie des cinq grands blancs de Curnonsky. Le niveau est parfait, la couleur est claire et d’emblée, on est en face d’un vin bien construit, solide, carré. Il est assez ésotérique car on sait qu’il est grand, mais on aimerait bien savoir pourquoi. Car c’est un colosse qui ne veut pas montrer ses émotions. On l’aime parce qu’il est riche et carré mais pas parce qu’il émeut. 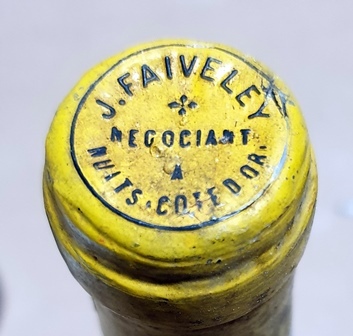 Le Chablis J. Faiveley 1926 crée un choc pour tout le monde. 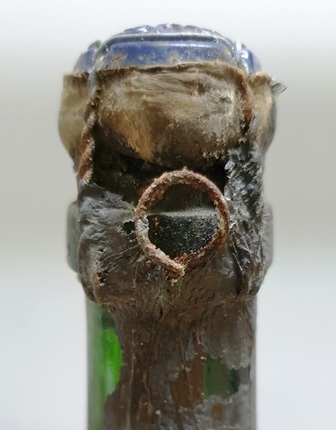 Comment est-il possible qu’un vin de 1926 qui a 92 ans puisse avoir la folle jeunesse d’un vin de vingt ans ? En plus, il est frais, léger, primesautier, prêt à toutes les folies. Alors, c’est un vrai choc. Avec ce vin on entre de plain-pied dans ‘mon’ monde du vin, ‘mon’, non pas parce qu’il m’appartient, mais parce que j’y vis. Pour les bordeaux, je n’ai pas joué la facilité. 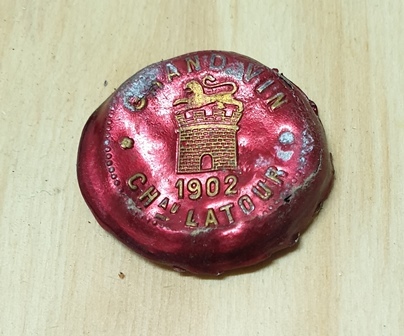 Le Château Durfort-Vivens 1916 m’avait surpris par son nez de framboise et de groseilles à l’ouverture, exactement comme le Beychevelle 1916 de l’académie des vins anciens. Il a toujours ces intonations de framboise et groseille, qui pourraient être un marqueur de 1916. Le vin a une belle acidité, et une belle force. 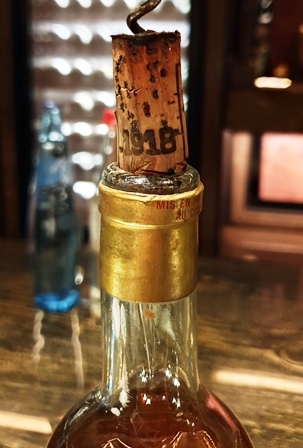 C’est un grand vin comme le 1895 Durfort que j’avais bu au Bern’s Steak House de Tampa. 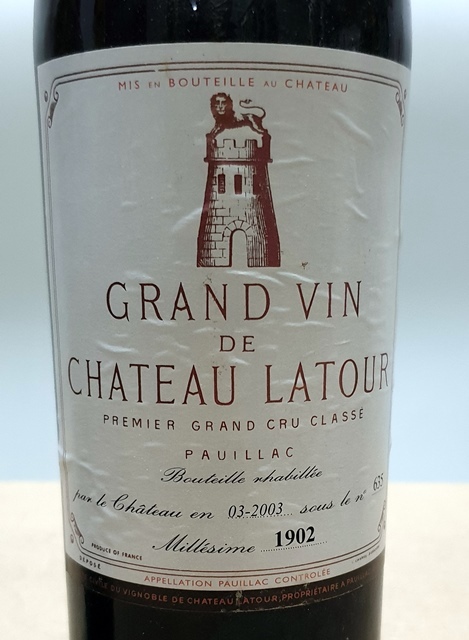 Le Château Latour 1902 est le premier vin que je bois de 1902 qui me permet d’avoir une chaîne sans discontinuité de 1885 à 2017, à laquelle s’ajoute une cinquantaine de millésimes plus anciens, mais avec des ruptures dans cette chaîne angtérieure. Le nez était engageant. 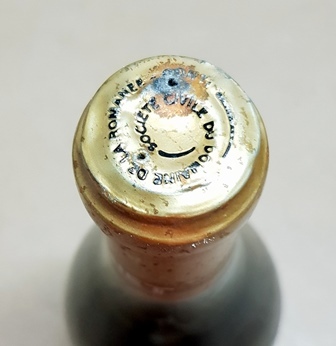 Quand je sers, oh surprise, le vin est dépigmenté. Le premier contact est assez aqueux. 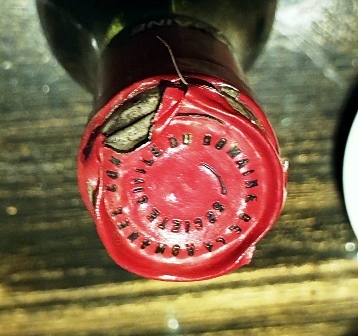 Mais, c’est la magie du vin, le Latour s’assemble, se structure. Il n’est pas vraiment typiquement Latour, mais on sent sa noblesse. C’est avec mon fils que je verrai comment se comporte le fond du vin sur-pigmenté. Pour les bourgognes j’ai voulu faire une association sans compétition de deux vins du même climat. 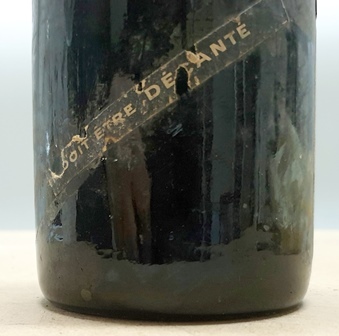 La Romanée Saint-Vivant Les Quatre Journaux 1929 au très beau niveau est un vin magnifique et opulent, serein, solide, construit avec énormément de charme. C’est un vin exceptionnel de séduction. 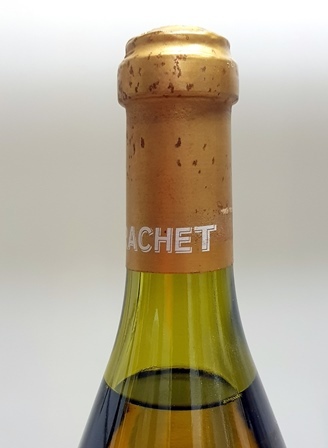 Sa parcelle de Saint-Vivant jouxte la Romanée Conti. 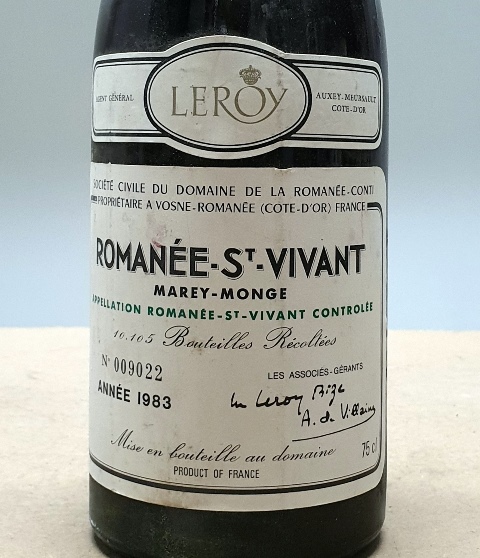 La Romanée Saint-Vivant Domaine de la Romanée Conti 1983 est d’un millésime faible. Aussi son parfum tonitruant est-il une grande surprise. Le nez est envoûtant et en bouche la signature du Domaine, de rose et de sel est d’une vigueur que je ne soupçonnais pas de ce vin bu plusieurs fois. Ce vin est brillantissime. 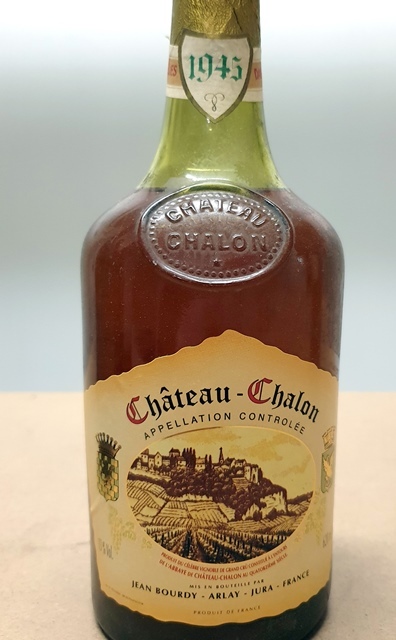 Faute de comté, c’est avec l’époisses que nous buvons le Château Chalon Jean Bourdy 1945. Ce qui frappe, c’est qu’il est tout en équilibre. La noix est discrète, le vin est dosé et accompli. Il est facile à comprendre car tout en lui est mesuré et élégant. 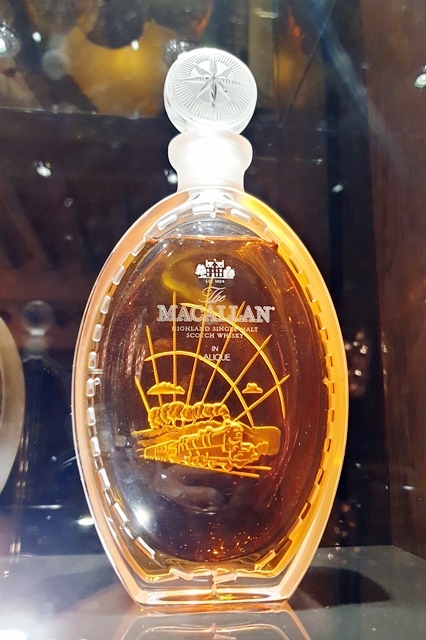 J’avais prévu de finir par un Yquem 1970 mais l’atmosphère est si sympathique que je me dis : soyons fou et reculons d’un siècle. 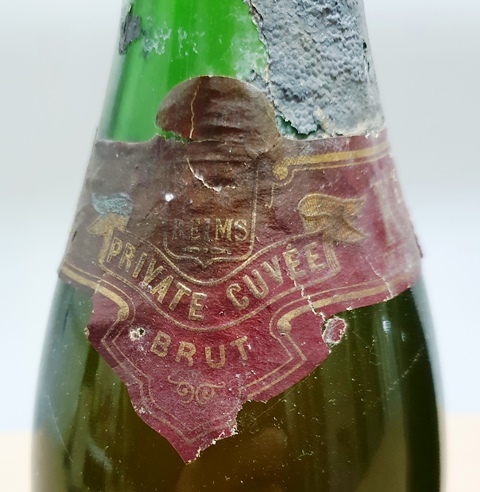 Je vais chercher (et c’est l’avantage de prendre le repas dans ma cave) un Vin de Chypre 1870. Ce vin, c’est les mille et une nuits. Il explose de poivre et de réglisse mais c’est surtout un vin parfait. Alors qu’il est supposé être doux il est sec et alors qu’il est supposé être lourd, il est aérien. Sa persistance aromatique est infinie. Il aura un vote de république bananière. Nous votons pour nos cinq préférés des douze vins. Nous sommes neuf à voter. Dix vins sur douze reçoivent un vote. 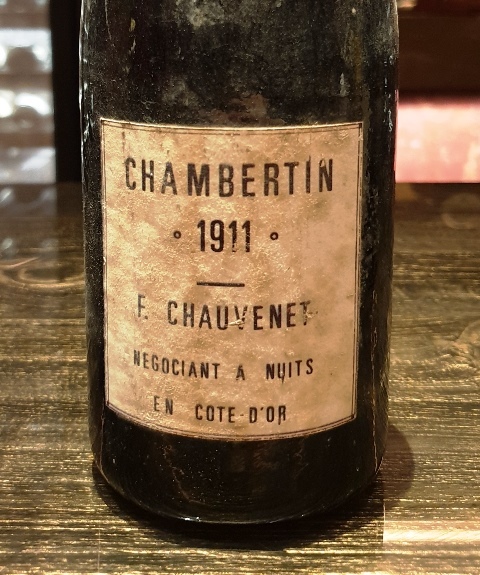 Les deux exclus sont le Krug du début mais je pense que c’est par politesse que mes convives n’ont pas voté pour le vin de leur maison, et le Meursault 1929 pourtant appréciable. 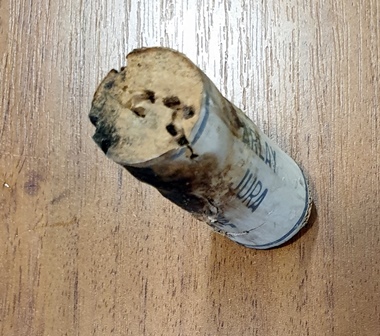 Il n’y a que trois vins nommés premiers car le Chypre a cannibalisé six votes de premier, le vin de la Romanée Conti a deux votes de premier et le Meursault 1945 a un vote de premier. 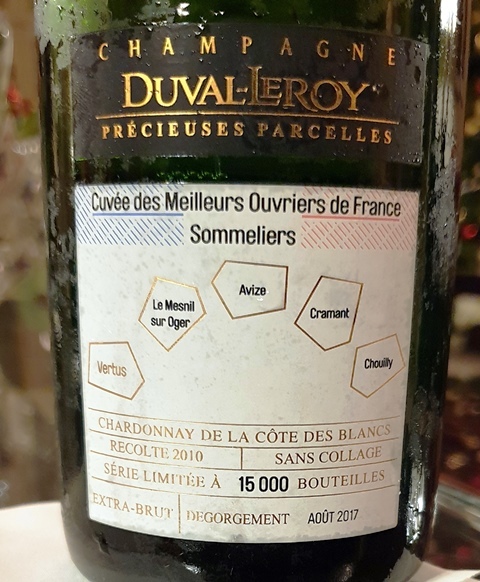 Le classement du consensus serait : 1 – Vin de Chypre 1870, 2 – Romanée Saint-Vivant Domaine de la Romanée Conti 1983, 3 – Romanée Saint-Vivant Les Quatre Journaux 1929, 4 – Chablis J. Faiveley 1926, 5 – Meursault Goutte d’Or les petits fils d’Henri de l’Euthe 1945, 6 – Château Latour 1902. 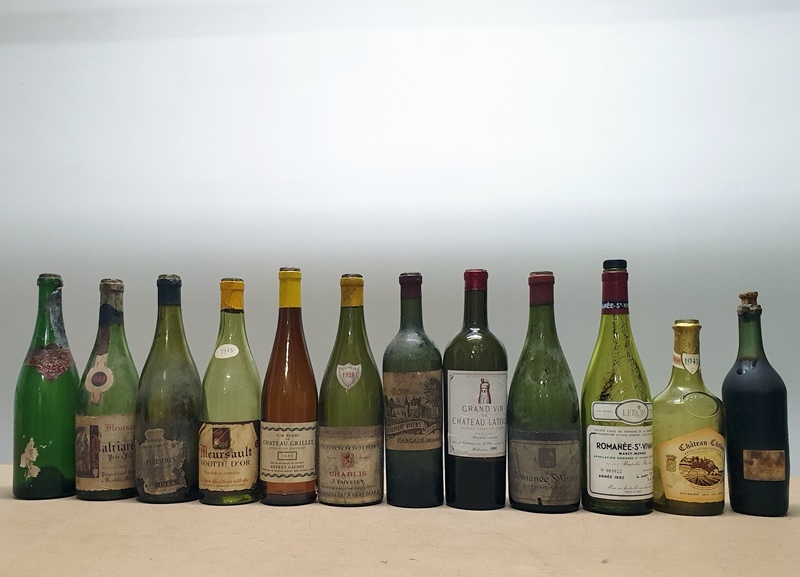 Mon classement : 1 – Vin de Chypre 1870, 2 – Romanée Saint-Vivant Domaine de la Romanée Conti 1983, 3 – Romanée Saint-Vivant Les Quatre Journaux 1929, 4 – Chablis J. Faiveley 1926, 5 – Château Grillet 1982. J’ai énormément apprécié l’attitude d’écoute de mes convives. Ils entraient dans un monde qu’ils pratiquent peu ou pas et ont découvert que la vie d’un vin n’a pas de limite. L’ambiance de dinette à la bonne franquette, mais franquette trois étoiles quand même, a permis des conversations passionnantes. J’ai été ravi de recevoir ceux qui font un champagne que j’adore. Cette forme de repas où l’on laisse à des bouteilles à risque la possibilité de s’exprimer me plait beaucoup. Comme ce repas a pris la forme de l’un de mes dîners, ce sera le 231ème de mes repas. Merci Maggie d’avoir permis ce moment de partage et de chaude amitié. 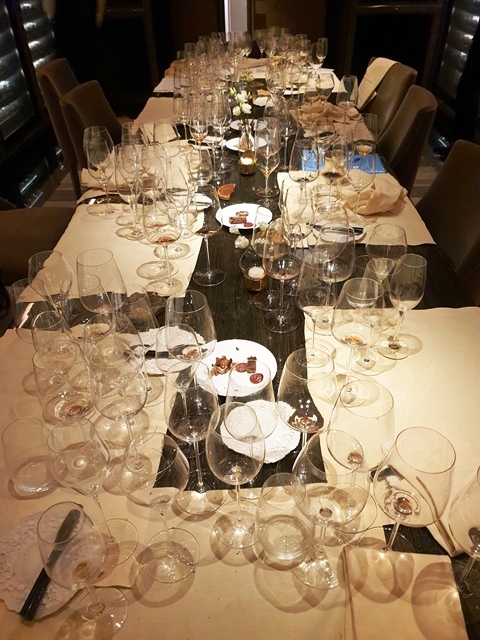 Cette entrée a été publiée dans dîners de wine-dinners le 14 décembre 2018 par François Audouze. 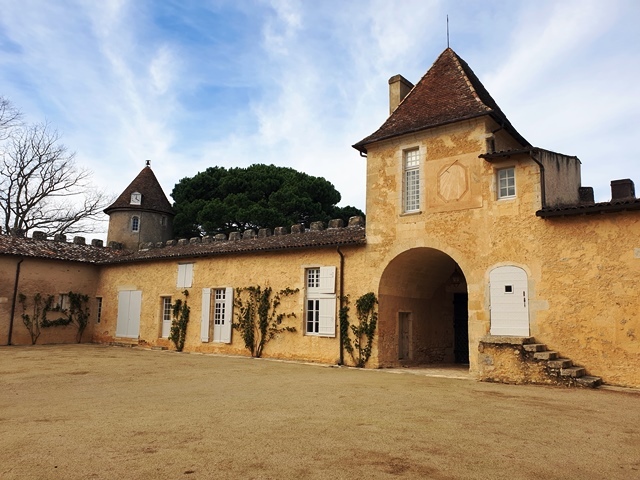 The dinner will be held at the Château d’Yquem, with my wines. I came to deliver them two months ago and I worked to build the menu with the chef of the castle Olivier Brulard best worker of France (MOF) 1996 who worked during his career especially with Michel Guérard. The day of the dinner, at noon we present ourselves to the castle. Valérie, the precious collaborator of the president of Yquem who assisted Alexandre de Lur Saluces and now Pierre Lurton will be present at the traditional lunch preceding my dinners in this place, while Sandrine Garbay and Francis Mayeur, the two who make Yquem and attended the previous lunches before my dinners will not be there, held back by other obligations. We will be four to test dinner dishes, two American friends, Valerie and me. 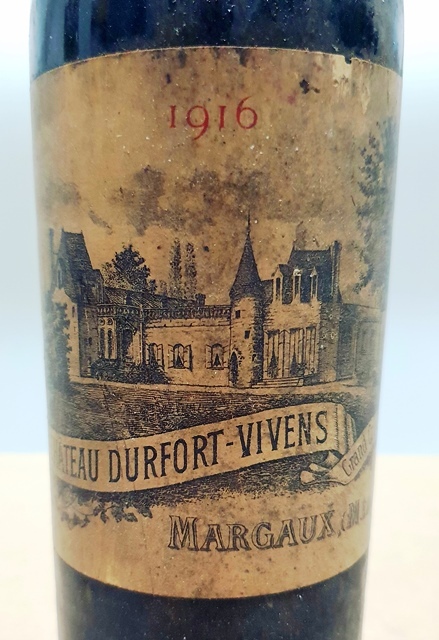 I brought a Maury of Vignerons de Maury 1929 which can accompany the dishes that we will test but will not serve as a witness, because it is very different wines that will be on the dishes tonight. 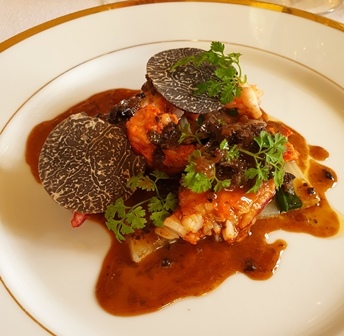 The first dish that we try is the lobster cooked gently on the salt pan with pretty scales of truffles. The dish is delicious. The chervil in fine leaves refreshes well the dish as well as the leaves of chard but it is necessary to remove the heart of chard too abundant and bitter and to keep only tiny stamps of this vegetable. We drink a ‘Y’ Yquem 2016 very green and a little too dry, which will expand during the rest of the meal. The Maury is very suitable for lobster and creates a nice deal because this 16 ° wine has a lot of freshness. He has aged in demi-muids for more than sixty years which gave him a beautiful fluidity and a great delicacy. The dish will accompany two montrachets, one of the domain of Romanée Conti and one of Ramonet. Olivier agrees to make a smaller dish, more airy and less salty. We understand each other well. We then try the foie gras. In the menu it is planned: Mr. Dupérier’s foie gras, lightly smoked and then poached, with salt and pepper. 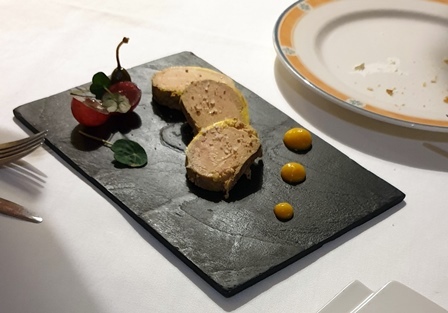 The plate includes foie gras in two ways, poached and smoked. 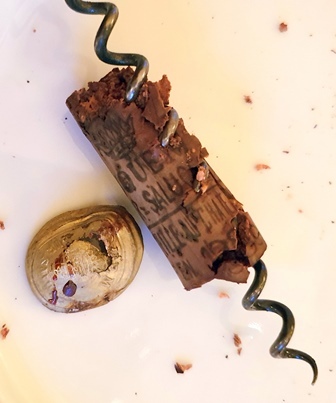 It seems to me at once that the smoked will not be useful, because Lafite 1878 will not accept it. We must also remove the pine nuts planted in the livers. 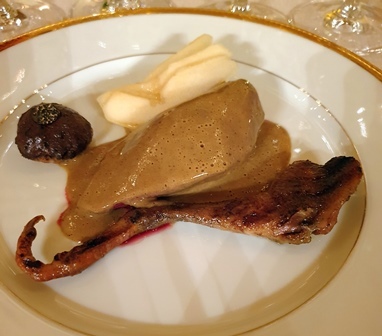 It turns out that Olivier who prepared the livers will not be able to put two slices of poached per person so the solution we adopt is that the smoked foie gras be served as a second course for the Burgundies, after the pigeon, and the foie gras poché will be as planned for the Lafite. 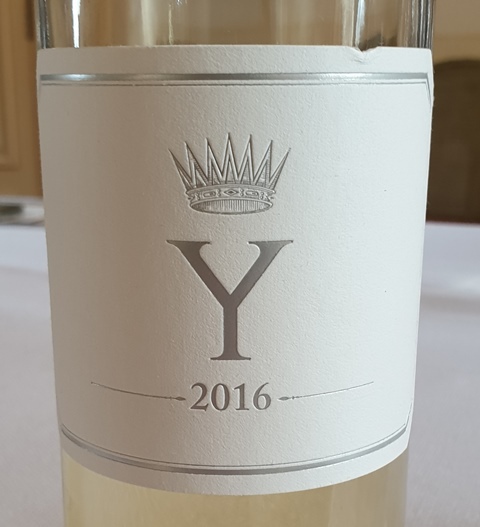 We drink Chateau d’Yquem 2016, wonderful in its crazy youth because it has the candor and rosy cheeks of a baby. And that goes well with the livers. The Maury also finds its place with the non-smoked liver. 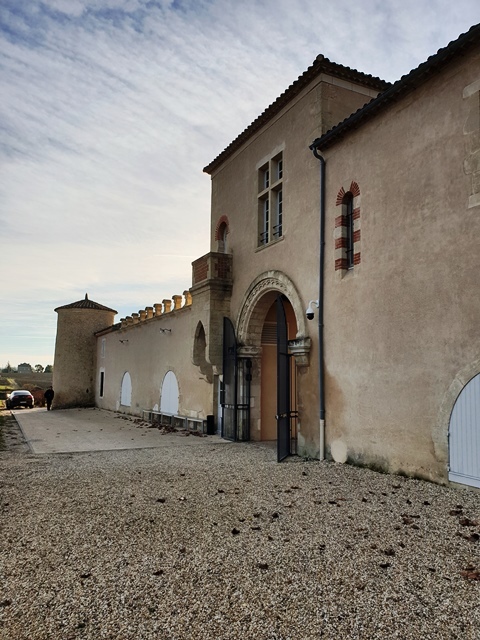 The 2016 Yquem will be big, a Yquem cooler than powerful. 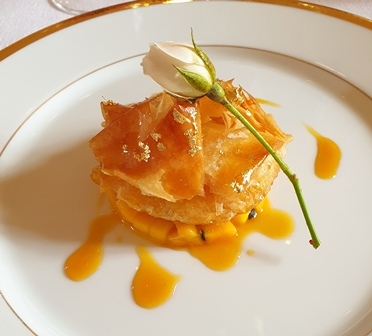 The dessert is an 18-carat crunch of mango picked ripe with passion fruit juice. 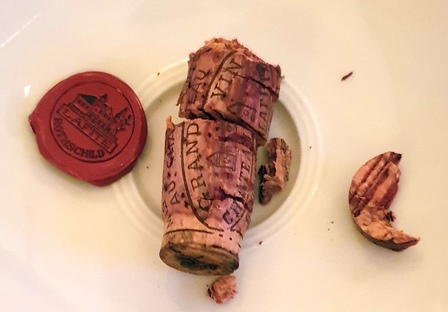 I have a little trouble with the lump of the crisp, the laminated breaks in the mouth, but as my lovely guests are accommodated, we will not touch this traditional recipe of Landes will be perfect for the three Sauternes of 1937 , 1917 and 1891. We make the debriefing with Olivier Brulard. 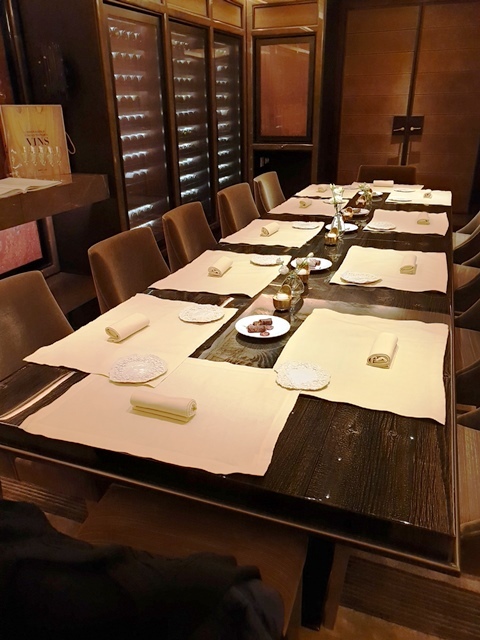 I change the size of the knives to cut the lobster, I exclude the breads for the plate of cheese, I determine the position of the glasses on table, because we will have fourteen glasses who will remain on the spot, I give the instructions of service of the wine compared to the dishes. Everything seems on track. 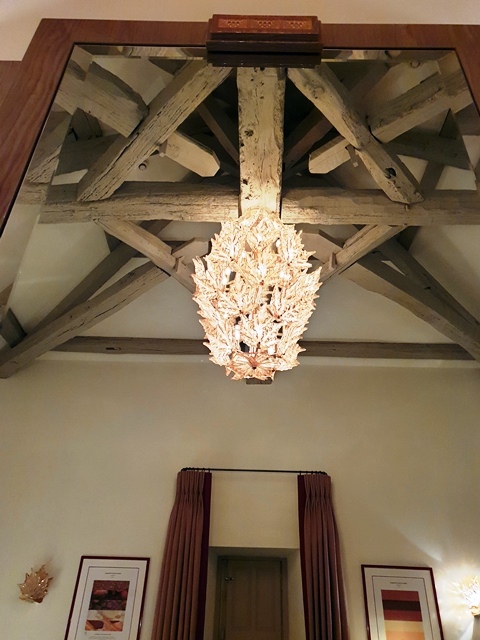 This evening Olivier will be assisted by the Cheval Blanc chef to take advantage of this experience. After a walk and a tiny nap, I’m ready for the opening of the wines. Valerie has reinforced the usual kitchen team of the castle and there will be a sommelier for the service of the wines, who assists in addition to my American friends at this ceremony. I open the wines in the order of service. 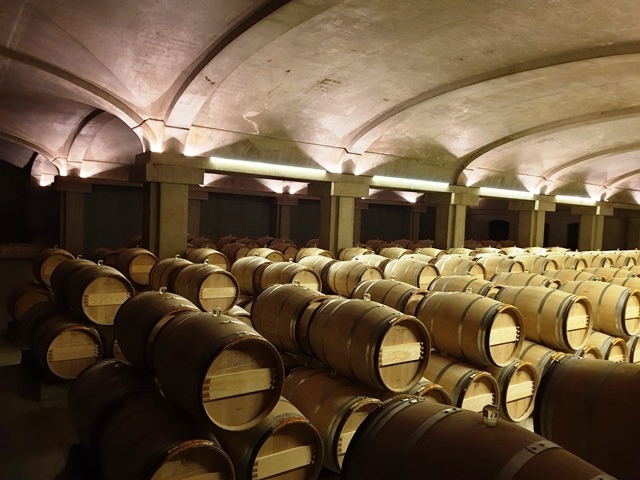 The Domaine de la Romanée Conti 1997 Montrachet has a fragrance of rare generosity. He is fat and happy. The Montrachet Domaine Ramonet 1978 scares me. I dread a possible taste of cap, despite the fact that the cap does not smell cap. The sommelier does not smell anything. Hopefully everything is going well. The perfume of the Cheval Blanc 1945 is imperial and glorious. Phew! Because I would have been embarrassed if the wine that runs Pierre Lurton was not up to par. 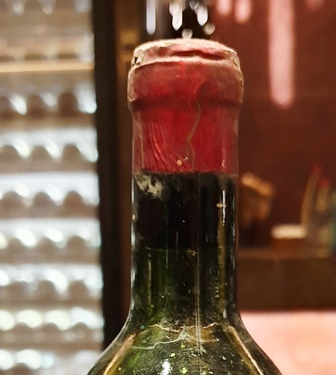 The Mouton Rothschild 1928 has a scent that seems to me of rare delicacy. For now, that’s fine. 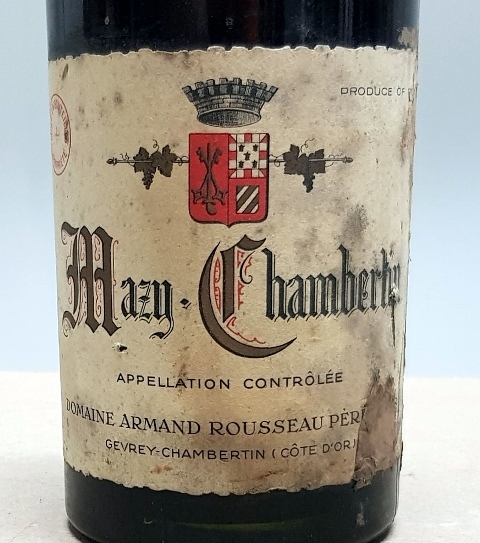 The Mazy Chambertin Armand Rousseau 1966 has a devilish scent. It is all the earthly and laborious Burgundy that explodes in my nostrils. 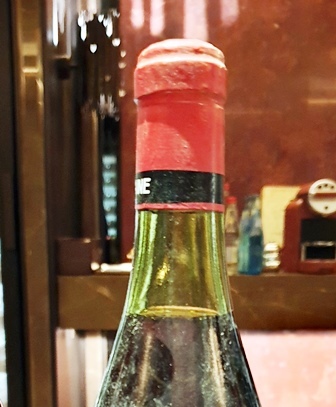 Conversely, the La Tâche Domaine de la Romanée Conti 1983 has a noble and distinguished perfume while restraint. It was going well for Bordeaux, it goes well for Burgundy. As Laetitia, Napoleon’s mother, said, « let us hope that it will go on that way ». 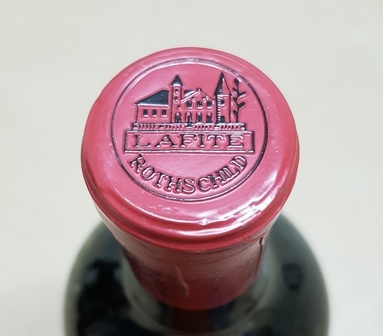 The Lafite-Rothschild 1878 has a miraculous fragrance. 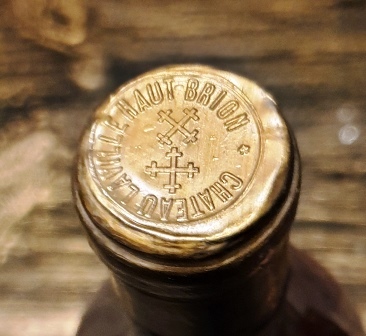 The bottle was reconditioned at the castle in 1990. The wine has a very clear ruby ​​color. The wine looks sweet. There too, I push a « phew » of satisfaction. 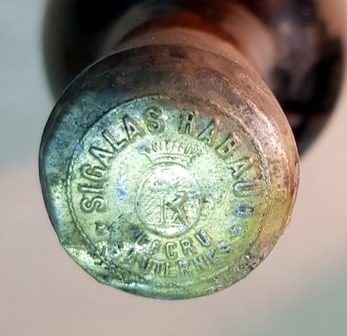 The Sigalas Rabaud 1917 is a huge surprise because its perfume (I do not taste any wine, I feel it only) plays in the big leagues. 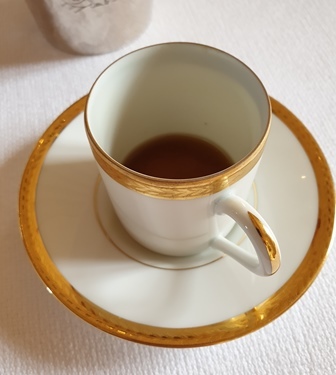 It will match the thundering scent of Yquem 1937, which comes from Yquem’s cellar and has never moved, and with the fragrance of a confusing subtlety of Yquem 1891. 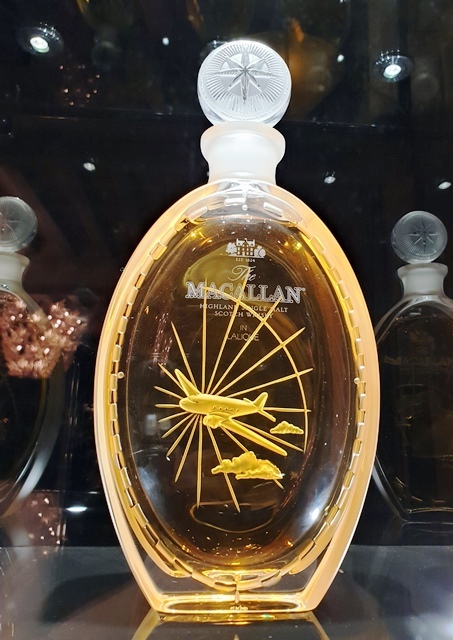 And the last piece of cake, like Liz Taylor being Cleopatra, it is the unmistakable perfume of the Malaga 1872, concentrated with the fragrances of the Arabian Nights. 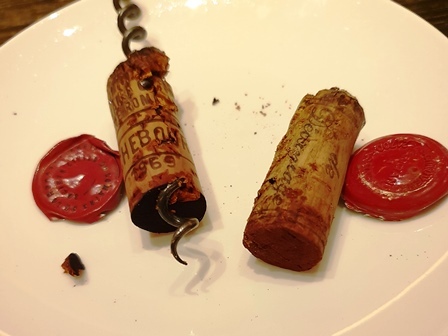 The opening operation lasted an hour and a half because I fought with many corks which did not want to go out. 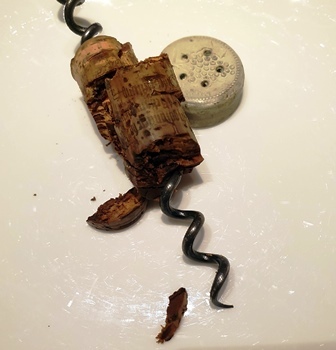 And I had a fright that gave me sweats, it is with the cap of the Yquem 1891 which, as soon as I cut the capsule went down in the neck and would have plunged in the liquid if I had not been able to grip it by manipulating it with extreme gentleness since every attempt to poke the cork made it go down. Exhausted by these 90 minutes of permanent tension I go back to my room to prepare because the festivities begin in half an hour. Under my shower I have the smug smile of the idiot of the village, I am ‘Lou delighted’ because I know that my wines will be at the rendezvous. 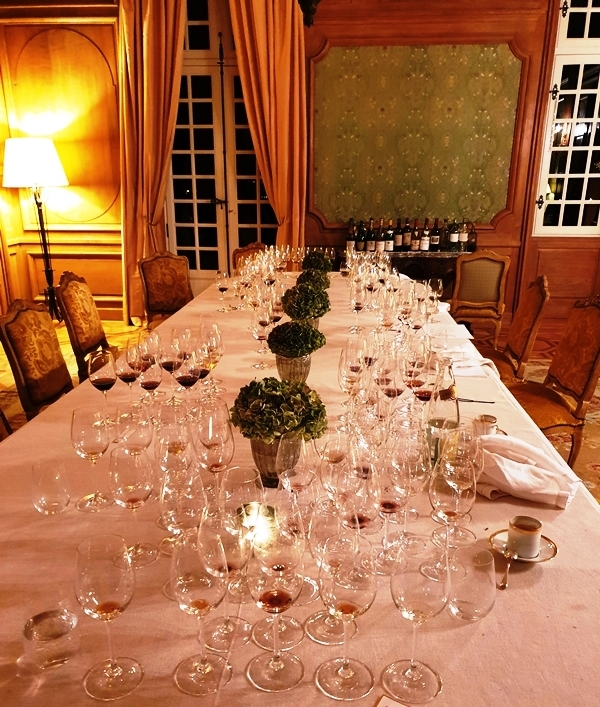 The rendezvous of the dinner is at 6 pm in the oldest living room of the Château d’Yquem. 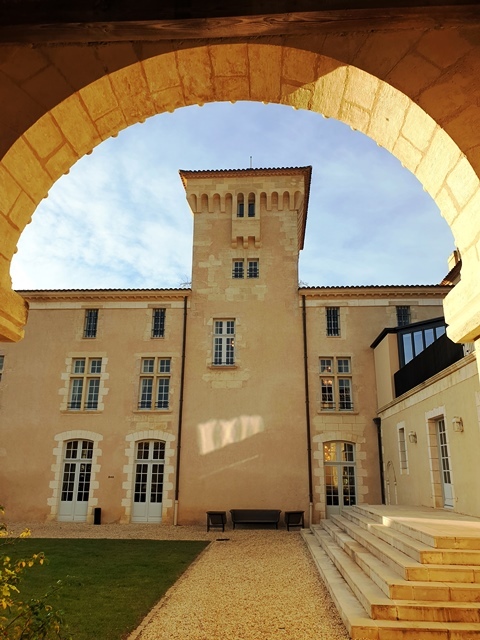 We will be twelve at table, received by Pierre Lurton, president of Yquem and Cheval Blanc. Our assembly of eight men and four women is very cosmopolitan with three Americans from three different cities, Charlotte, Boston and San Francisco, a French living in New York, a French living in Singapore with his Japanese-born wife, two Chinese living in Oxford, an Italian, a German and me. Six participants were at some of my greatest dinners. Four guests participate for the first time. We introduce ourselves and Pierre Lurton joins us to welcome us. 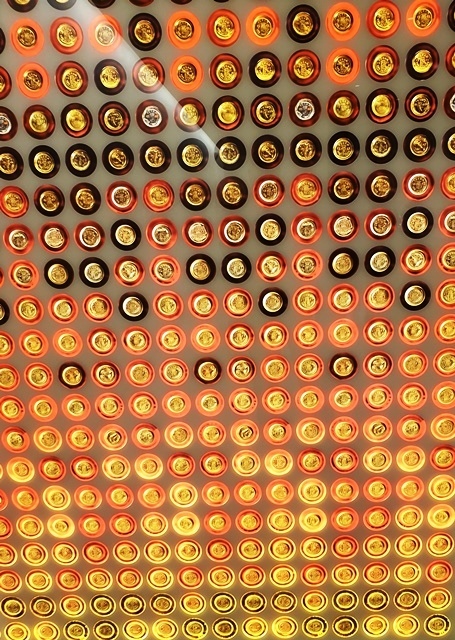 He makes us visit the cellars and quickly gives explanations on the botrytis, the harvest and the aging of Yquem. 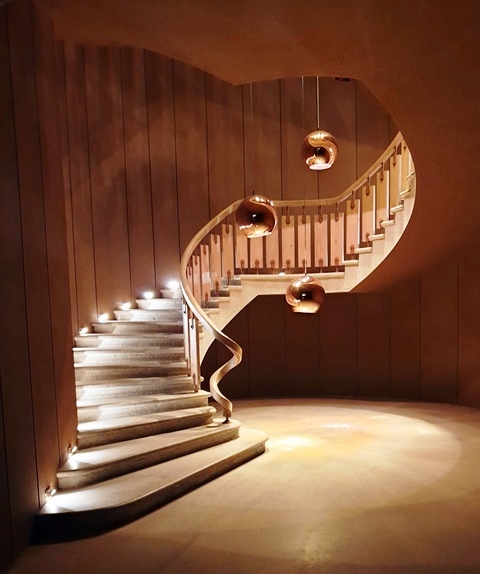 We then go to the beautiful tasting room to taste three young Yquem. Their colors are very close and very clear, the 2001 being slightly more amber. 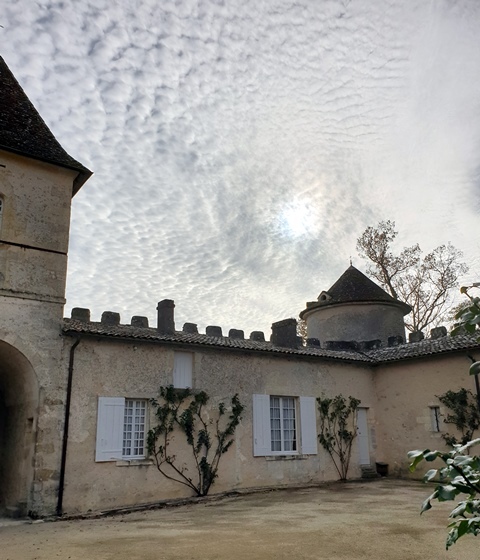 Pierre Lurton says he prefers the Château d’Yquem 2015 that we drink to the 2016. I agree with him for the future because the 2015 is powerful and rich. But for the immediate pleasure I prefer the 2016 drunk at lunch, more fluid, more delicate, while the 2015 is very marked by a strong sugar. 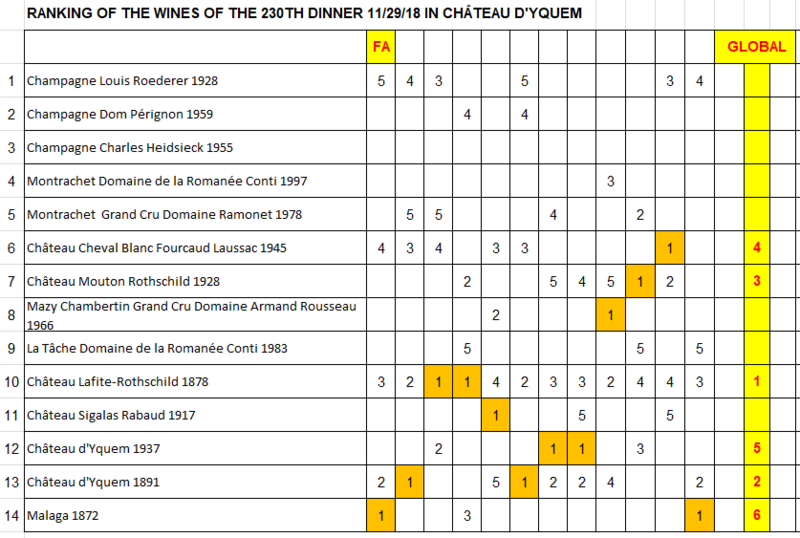 Château d’Yquem 2009 is a marvel of balance. He has everything for him. 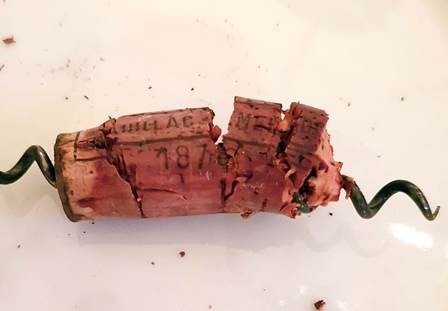 It evokes me gladly the 1893 which is probably the most balanced of all the Yquem. This 2009 is the joy of living. The Château d’Yquem 2001 is a punch in my heart. 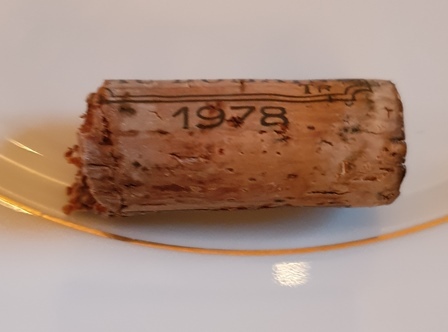 This 2001 is a conquering Yquem warrior and in my imagination, while I never drank the 1847, the most famous Yquem with 1811, I imagine the 2001 is as big and legendary as the 1847. This Yquem has everything for him. After this quick tasting commented by Pierre Lurton always so truculent, we go to the large antique lounge for aperitif. I opened all the wines but I did not open any champagne. So for me this is a big unknown, because if we start with a tired champagne, it can change the atmosphere of dinner. 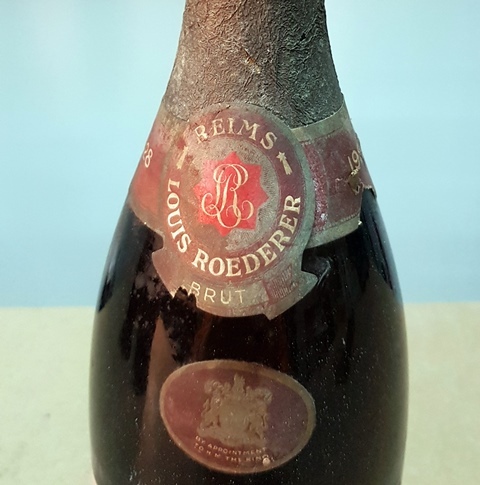 I pray the sky and the sommelier pours me the first glass of the Champagne Louis Roederer 1928. The color is almost pink. There is no bubble but in the mouth I feel the sparkling and, phew, the champagne is of exemplary purity. It is precise, does not have a gram of defect and its taste is charming, intense, deep. 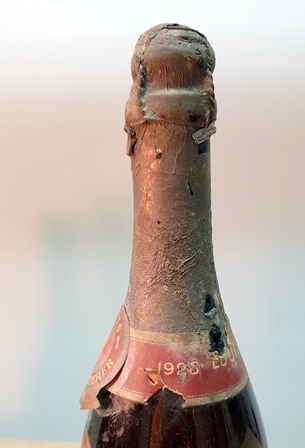 It is an immense champagne of 1928. It leaves in the mouth a strong trace made of beautiful red fruits. 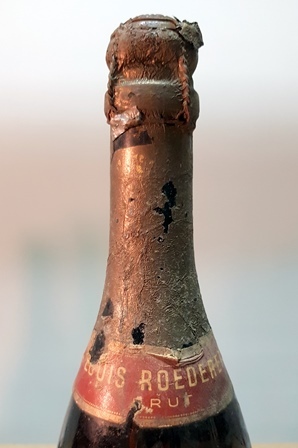 Champagne Dom Pérignon 1959 is open and if the pschitt is weak, the bubble is more visible and the color is lighter. It’s obviously a big Dom Pérignon, vinous, active and present, but I admit that I have a soft spot for the more complex Louis Roederer. Small canapés are delicate. We sit at the table in the very pretty dining room of the castle. The menu designed by Olivier Brulard, chef of the castle and developed with me is: appetizers to enjoy with fingertips / langoustines « blue » with fresh water grapefruit, Royal caviar in dress field / cooked lobster gently in the saltire, pretty scales of truffles first / line bar in autumn coat / squab « Great Tradition » / foie gras M. Dupérier slightly smoked / poached foie gras, with croque-au-sel / selected cheeses and refined by Dominique Bouchait MOF / Crisp « 18 Carats » of mango picked ripe with passion / financial juice from a mouthful of licorice. 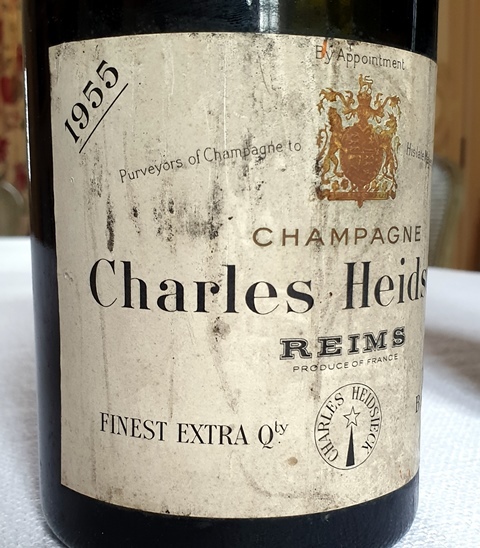 The Champagne Charles Heidsieck 1955 is like the two previous ones of a purity and a remarkable precision. My guests wonder how it is possible to have three champagnes as old, so at risk, which are so perfect. 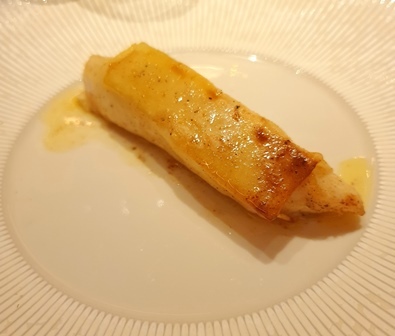 The 1955 is racy, long, with a strong personality that will find with the lobster and grapefruit water jelly an agreement that is probably the best of the meal with the one that we will have on a poached foie gras. The presentation of the dish is of a remarkable aesthetic. 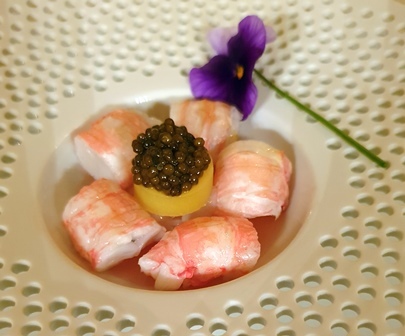 The champagne vibrates with the flesh of the langoustine served fresh but even more with the water of grapefruit. And the end point is given by the caviar highlighted by a sweet potato that gives a boost to the champagne. 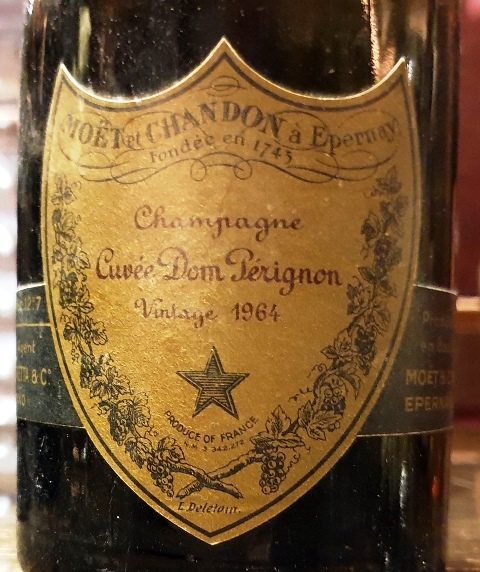 Of the three champagnes, it is the Dom Pérignon which made its age that is to say a beautiful maturity, while the other two because of their intensity have no age. On lobster we have two montrachets. 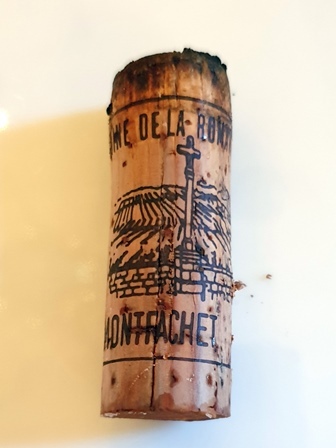 The Montrachet Domaine de la Romanée Conti 1997 has the glorious nose of the estate’s Montrachet. Theoretically it is not a very powerful year, but in practice it is flamboyant and very broad. He is not as fat as others who are more powerful, but he is joyfully thick and intense. 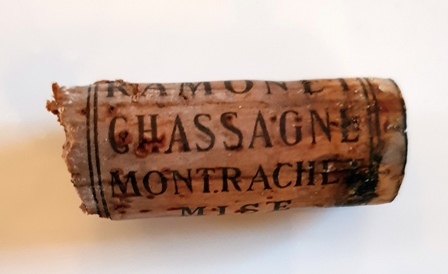 The Montrachet Grand Cru Domaine Ramonet 1978 is very different. First of all, he does not have the slightest trace of a cork that I feared. I was scared for nothing. 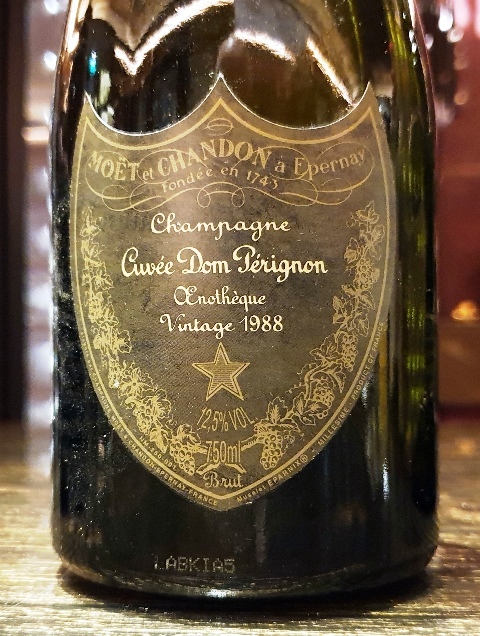 If the 1997 is an extreme width, giving a joyful mouth, the 1978 is all in depth and refinement. To prefer one or the other is not easy. The Italian friend prefers the Ramonet which is of an ideal presentation and has no age. The Ramonet is very racy, the Conti is very gourmand. I would say that for the perfect lobster and generously truffled, it is the 1997 Conti that is the most rewarding. But the nobility of Ramonet is extreme. 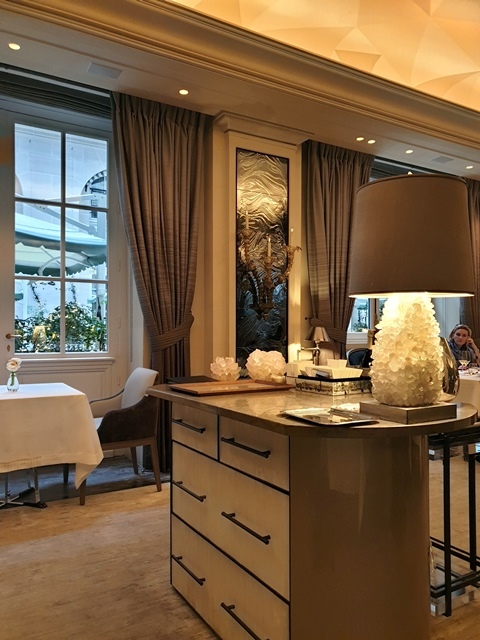 The mushroom line bar is accompanied by two great Bordeaux and many guests will admire the relevance of an agreement they would not have imagined. 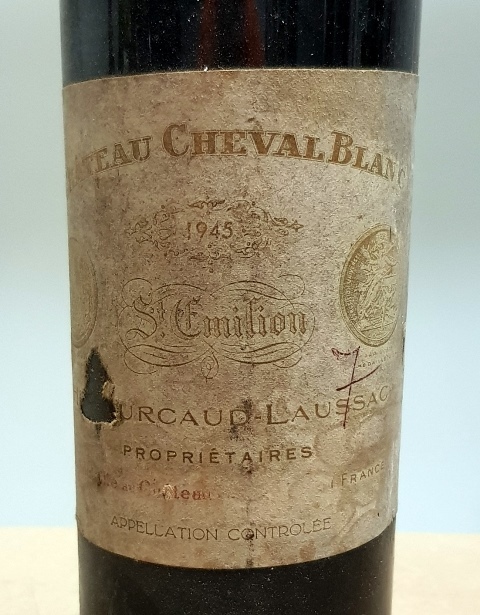 Château Cheval Blanc Fourcaud Laussac 1945 has a truffle nose of extreme power and on the palate, it is generous, powerful, concentrated, square, glorious and so good that one would be ready to place it over the most legendary 1947 Cheval Blanc which more more atypical. This truffled wine is a splendor and I am happy to have put it in the presence of the one who runs the Cheval Blanc castle. The wine has such a balance that it seems indestructible and built for eternity. 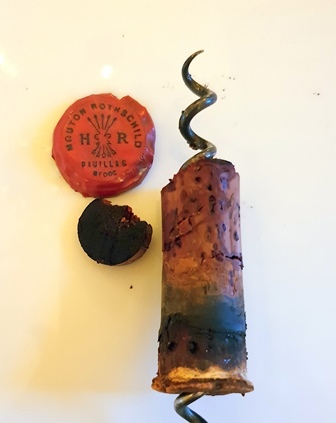 Beside him, the Château Mouton Rothschild 1928 is an exceptional Mouton, full of charm and enigmas. He is elusive. I am totally under his spell. The Cheval Blanc is masculine, solid warrior while the Mouton is feminine, all in charm. And what’s good is that the two wines do not harm each other, on the contrary, we go from one to the other by developing our pleasure. 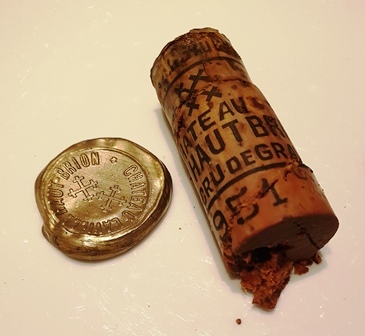 We drink two huge wines and I did not expect Mouton 1928 to be so complex and brilliant. 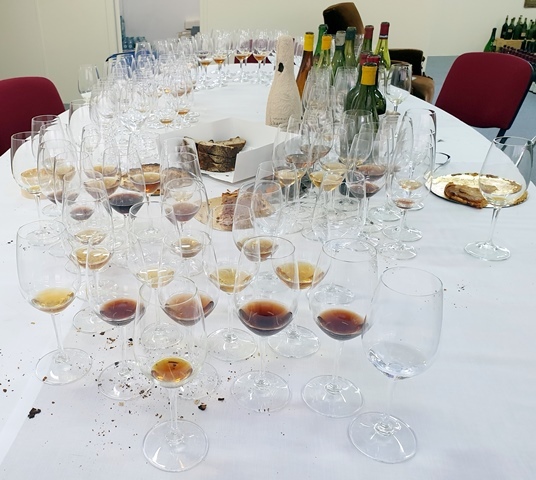 The pigeon accompanies two Burgundy wines, and here again, as for the Montrachets and the Bordeaux wines, two very different wines. 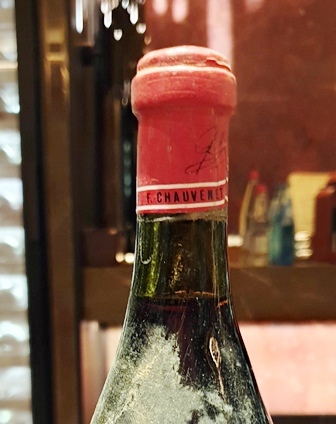 The Mazy Chambertin Grand Cru Domaine Armand Rousseau 1966 has a diabolical nose to wake the dead. This is the affirmation of Burgundy the most earthly, hardworking, feet in the clay. It is a Burgundy that takes the guts and in the mouth we have a wine of pleasure, nature, diabolically attractive. Beside, La Tâche Domaine de la Romanée Conti 1983 is carrying the subtlety of the domaine of Romanée Conti. We are in elegance. The pigeon speaks a lot more with Mazy Chambertin. 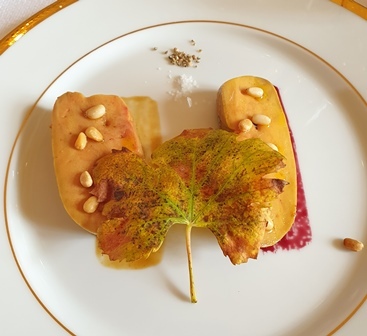 While the smoked foie gras that is served after converse elegantly with La Tâche. I have a soft spot for the most ‘commoner’ of the two. 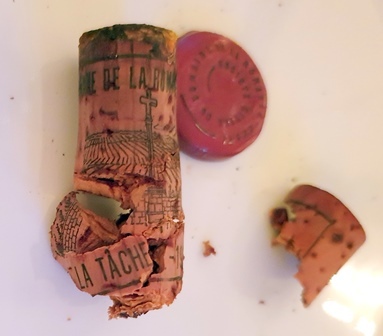 Château Lafite-Rothschild 1878 is like the 1955 Charles Heidsieck alone on a dish, on poached foie gras. 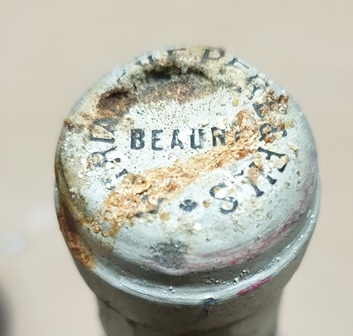 This wine was reconditioned at the château in 1990 with the marks attesting to this operation. The wine has a beautiful color very young. The nose is intense. It is incredible finesse, nobility and accomplishment. It seems so natural. I spoke discreetly with Pierre Lurton, who agrees with me, the age feels with a slightly meaty taste probably latent and arisen during refilling, which signs the authenticity of the wine and does not harm the pleasure to the point that this wine will be the only one to appear on the twelve voting sheets, devoting its first place to the wines of the meal. The accord with the foie gras is magical and the sweetness highlights all the subtleties of the wine. 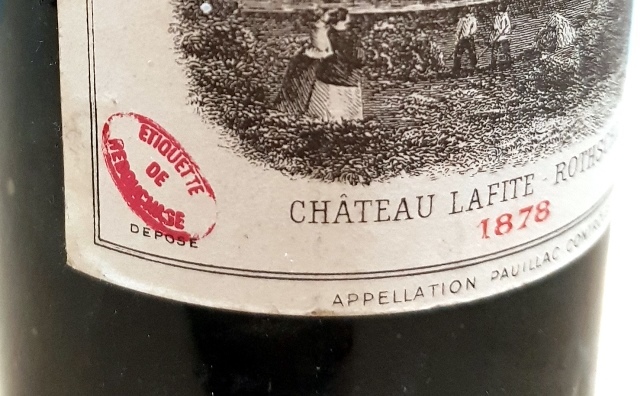 We had at a previous dinner a superb Lafite 1898. This one is at least the same level, maybe a little more romantic and delicate. It is a 140 year old anthology. At this stage we wonder how we will be able to prioritize wines as different and all perfect. It is now the moment of the three Sauternes served at the same time. 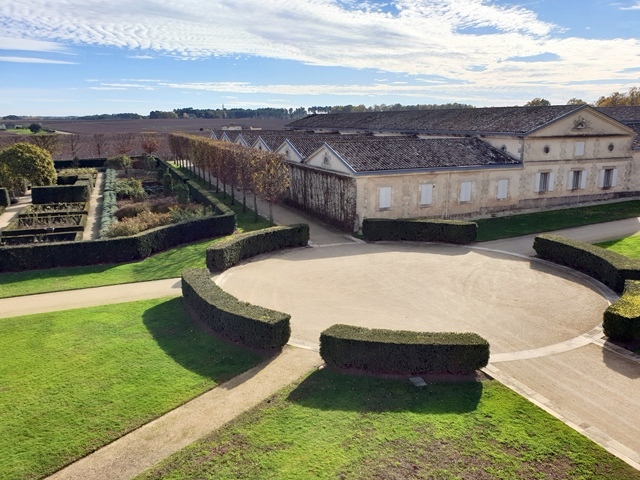 From left to right we have Château Sigalas Rabaud 1917, Château d’Yquem 1937, Château d’Yquem 1891. The colors of the two extremes are almost identical, of a very dark mahogany, and the 1937 is amber but lighter than the two others. 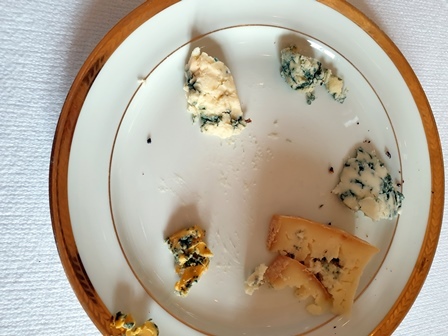 These three wines will have two services, the five cheeses then the dessert. 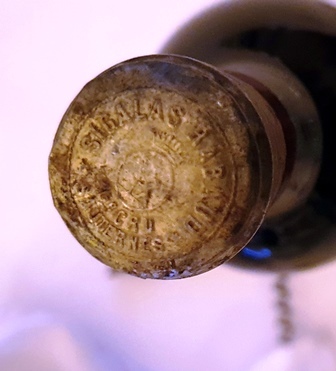 The Château Sigalas Rabaud 1917 is a huge surprise because it is at the top of the elite tastes of Sauternes. It is deep, rich, with notes of caramel or candied banana, but it is especially his race that is beautiful. He will be voted once as first and he deserves it. 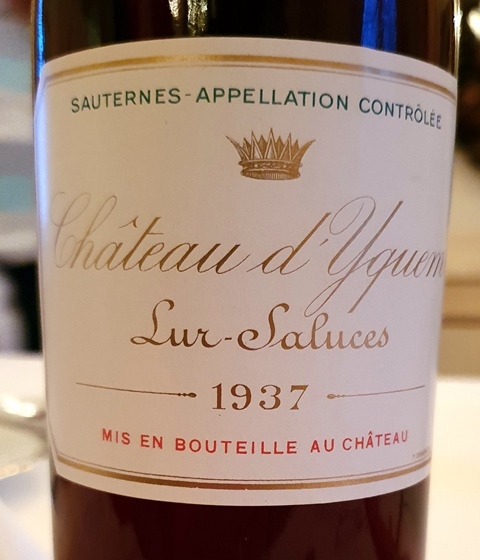 The Château d’Yquem 1937 is a conquering warrior. It’s the glorious, juicy, happy Yquem, it’s Marlon Brando in his youth. 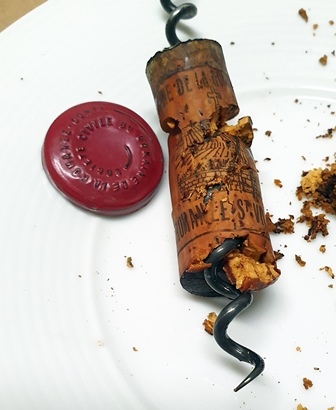 Because this Yquem is very young, and will live many decades more. 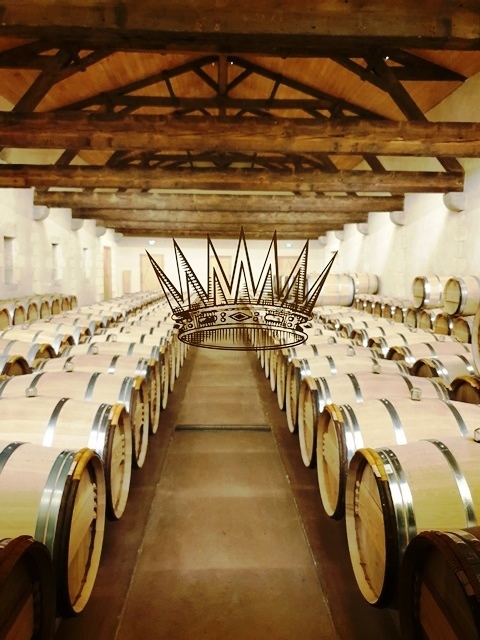 The Château d’Yquem 1891 is of infinite complexity. I fall under his spell because he is so subtle, evocative, intriguing. His journey in the mouth is multifaceted. He has the charm, the seduction then the enigma, the subtlety, the same plot. We never go around. I am fascinated by its complexity because it is not a powerful Yquem, it is a Yquem of meditation. The cheeses have done well with the three sauternes and the agreement with the mango dessert is so natural that we enjoy it without question, because it’s perfect. Now comes the judicious financiers cakes on Malaga 1872 whose handwritten label bears only these mentions. I swoon. Because its exotic, unreal flavors are unimaginable. We are transported to a planet of lust. Everything is powerful but so delicate. The length is infinite. We are in paradise. And what makes it magical is that there are totally unfamiliar tastes. Joe, a faithful friend present at Veuve Clicquot dinner and at the 200th dinner, tells me that never in his life did he have a dinner of this quality. He is thrilled and I admit that I did not expect that all the wines of the dinner cannot be the object of any criticism. They are at the top of what they can bring. How to vote in these conditions, many tell me but it is the rule to vote. We are twelve to vote for the five favorite wines on fourteen wines. 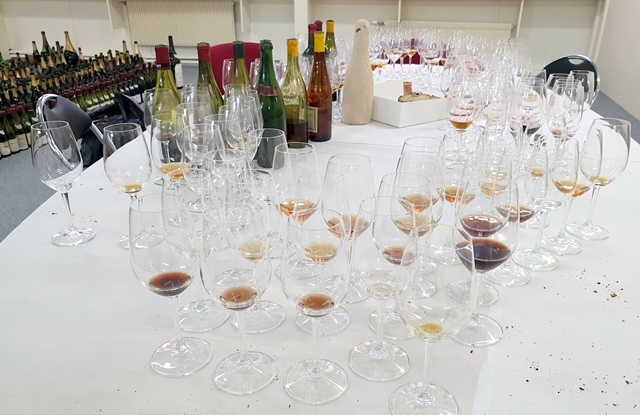 Thirteen wines appear in the votes which confirms the excellence of all. 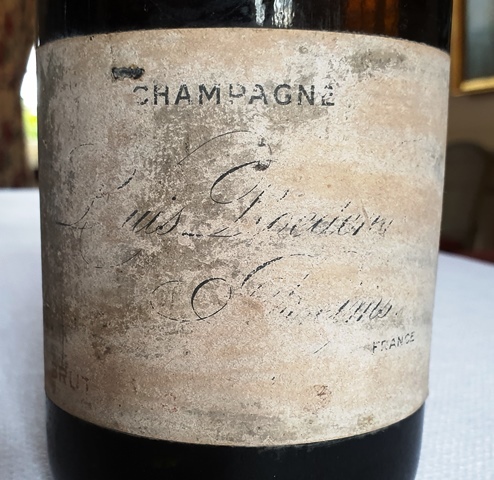 If the Charles Heidsieck is not in the votes it is not because of its quality which is extreme, it is that at the end of the meal, the memory fades on the wines of the beginning. What delights me even more is that eight wines were deemed worthy of being first. Unbelievable ! Four wines were judged first twice and four wines were judged first once. 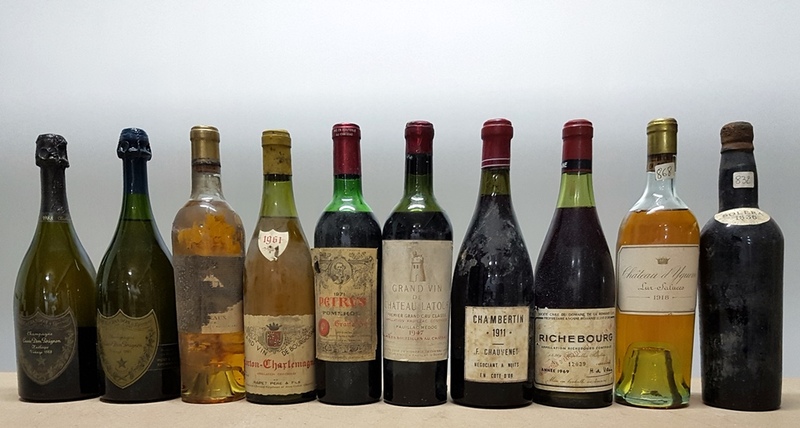 The doubles first are: Lafite 1878, Yquem 1937, Yquem 1891 and Malaga 1872. 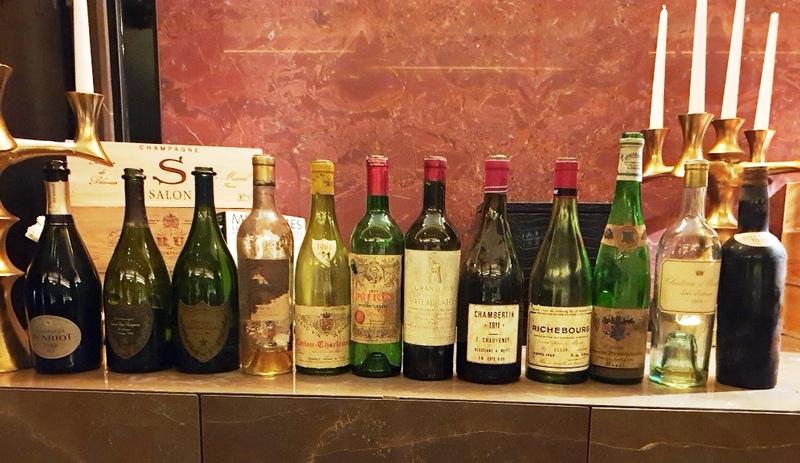 The four first-time votes are: Cheval Blanc 1945, Mouton 1928, Mazy Chambertin 1966 and Sigalas Rabaud 1917. Sometimes people say that I influence the votes. If eight wines are named first, my influence is very small. 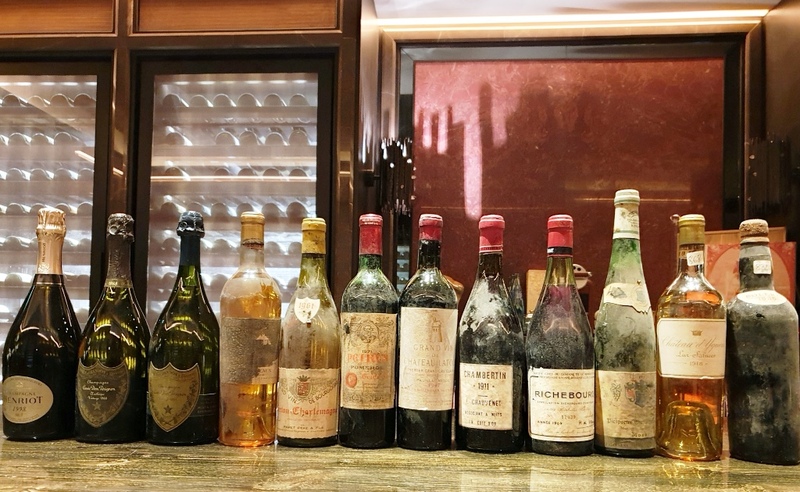 The consensus ranking would be: 1 – Château Lafite-Rothschild 1878, 2 – Château d’Yquem 1891, 3 – Château Mouton Rothschild 1928, 4 – Château Cheval Blanc 1945, 5 – Château d’Yquem 1937, 6 – Malaga 1872. 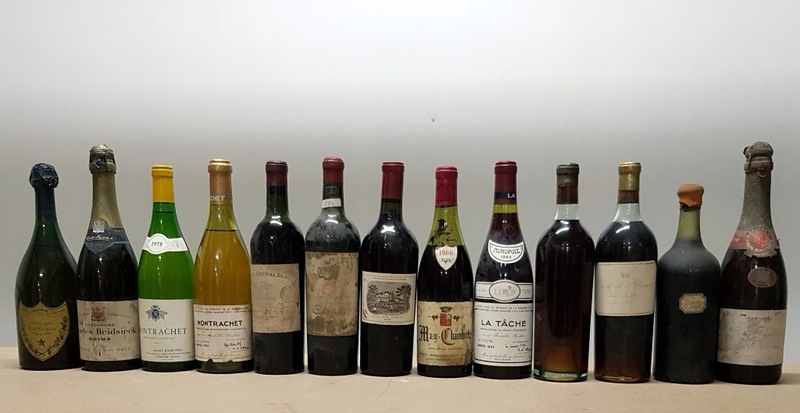 My classification is: 1 – Malaga 1872, 2 – Château d’Yquem 1891, 3 – Château Lafite-Rothschild 1878, 4 – Château Cheval Blanc Fourcaud Laussac 1945, 5 – Champagne Louis Roederer 1928. 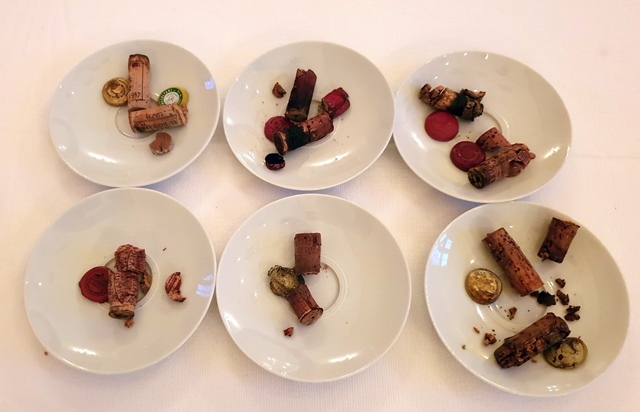 In a dinner where there are two excellent wines from the Domaine of Romanée Conti, note that neither of the two is among the top six, this indicates the level of others. 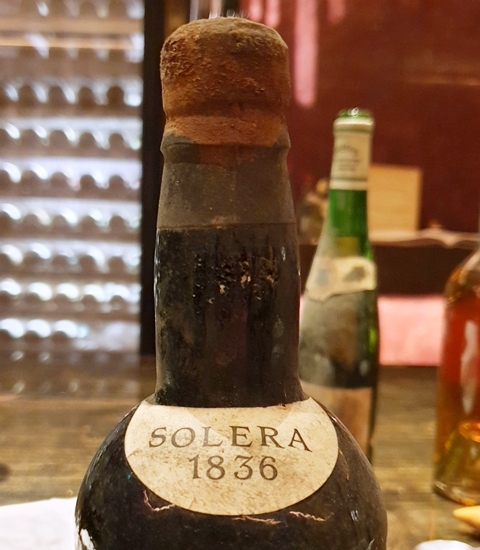 One reason is that we have crowned the very old wines since the average age of the six classified wines is 110 years old. This explains that. What about this dinner otherwise than everything was perfect. The wines made a no-fault that impressed the guests. Food and wine pairings, even daring, were perfect. 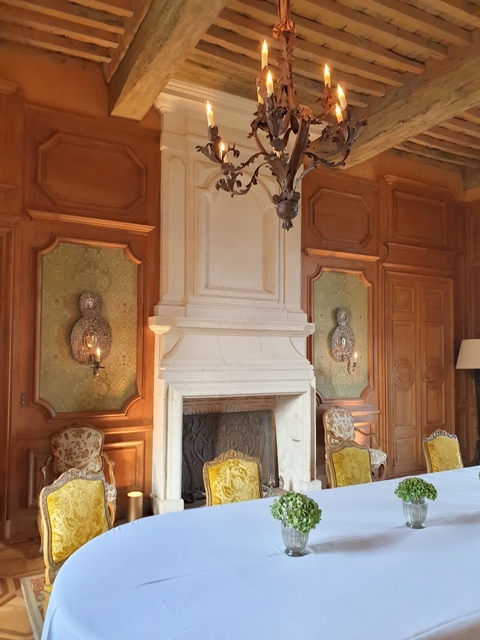 The place where the dinner was held is magical and Pierre Lurton welcomed us with friendship. It’s probably one of the three best dinners I’ve had, if not the biggest one. 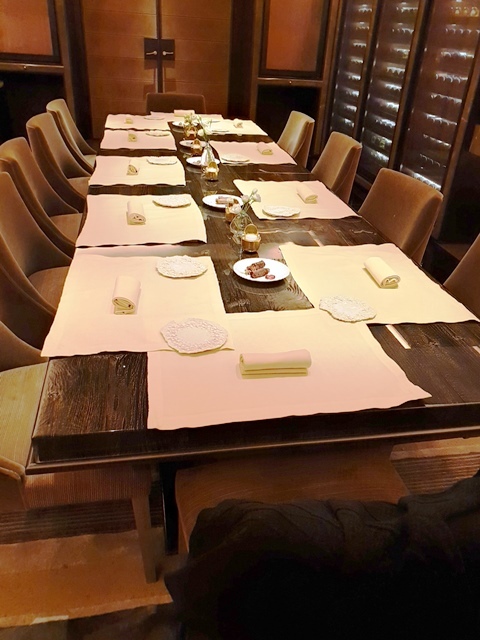 The atmosphere of friendship that has developed between the guests makes it a rare dinner. 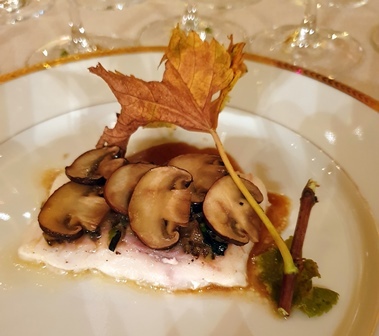 Cette entrée a été publiée dans dîners de wine-dinners le 1 décembre 2018 par François Audouze. 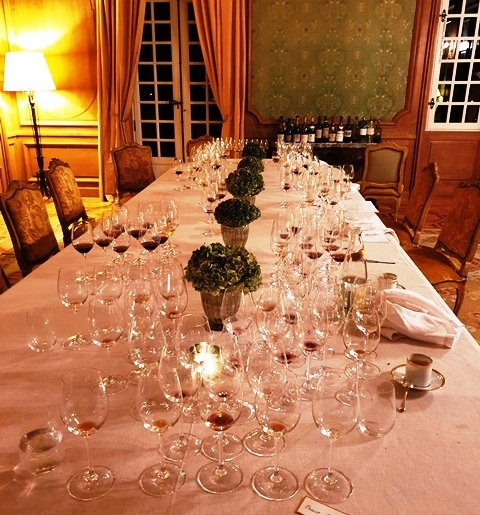 Le rendez-vous du 230ème dîner de wine-dinners est à 18 heures dans le salon le plus ancien du château d’Yquem. Nous serons douze à table, reçus par Pierre Lurton, président d’Yquem et de Cheval Blanc. Notre assemblée de huit hommes et quatre femmes est très cosmopolite avec trois américains de trois villes différentes, Charlotte, Boston et San Francisco, un français vivant à New York, un français vivant à Singapour avec sa femme d’origine japonaise, deux chinois vivant à Oxford, un italien, un allemand et moi. Trois participants étaient au 200ème dîner, trois participants étaient au dîner au siège de Veuve Clicquot. Les deux américaines et les deux chinois ont participé à de très nombreux dîners. Cinq convives participent pour la première fois. Nous nous présentons et Pierre Lurton nous rejoint pour nous souhaiter la bienvenue. 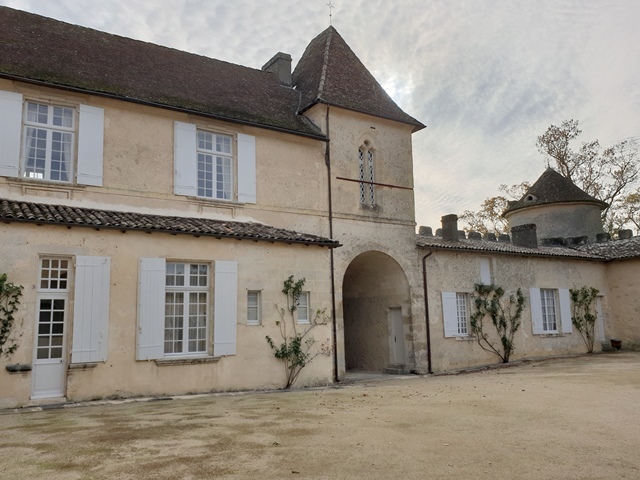 Il nous fait visiter les chais et donne rapidement des explications sur le botrytis, la récolte et le vieillissement d’Yquem. Nous allons ensuite dans la jolie salle de dégustation pour goûter trois jeunes Yquem. Leurs couleurs sont très proches et très claires, le 2001 étant à peine plus ambré. 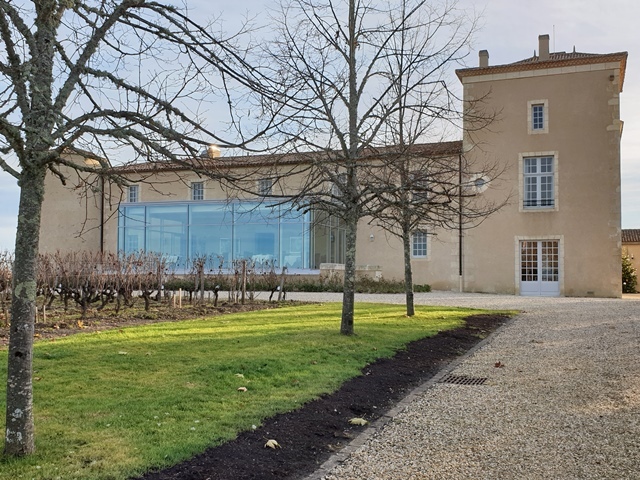 Pierre Lurton dit qu’il préfère le Château d’Yquem 2015 que nous buvons au 2016. Je suis d’accord avec lui pour le futur car le 2015 est puissant et riche. Mais pour le plaisir immédiat je préfère le 2016 bu ce midi, plus fluide, plus délicat, alors que le 2015 est très marqué par un sucre fort. 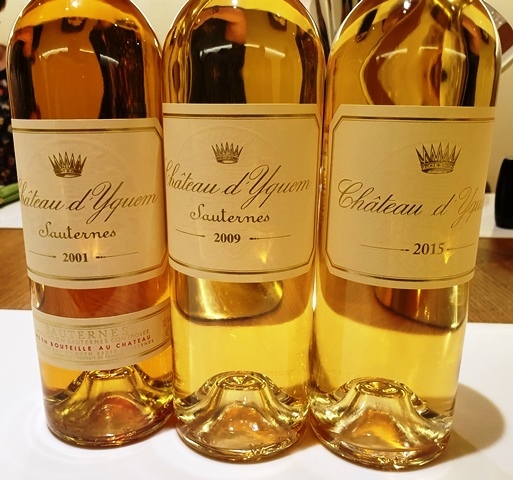 Le Château d’Yquem 2009 est une petite merveille d’équilibre. Il a tout pour lui. 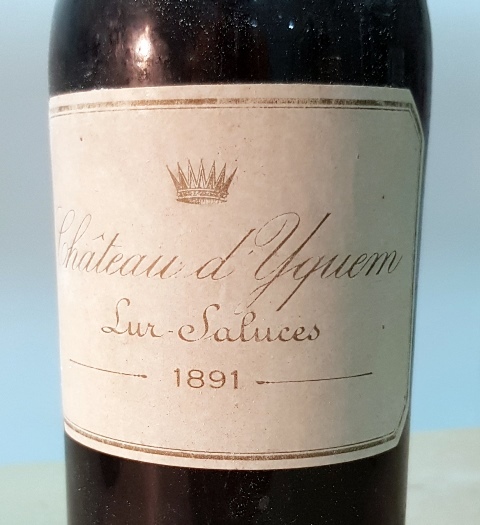 Il m’évoque volontiers le 1893 qui est probablement le plus équilibré de tous les Yquem. Ce 2009 c’est la joie de vivre. 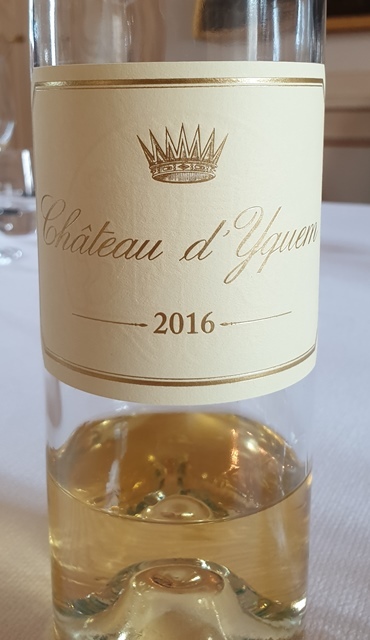 Le Château d’Yquem 2001 est un coup de poing dans mon cœur. Ce 2001 est un Yquem guerrier conquérant et dans mon imaginaire, alors que je n’ai jamais bu le 1847, l’Yquem le plus célèbre avec 1811, je me représente le 2001 comme aussi grand et légendaire que le 1847. Cet Yquem a tout pour lui. Après cette rapide dégustation commentée par Pierre Lurton toujours aussi truculent, nous nous rendons dans le grand salon antique pour l’apéritif. J’ai ouvert tous les vins mais je n’ai ouvert aucun champagne. 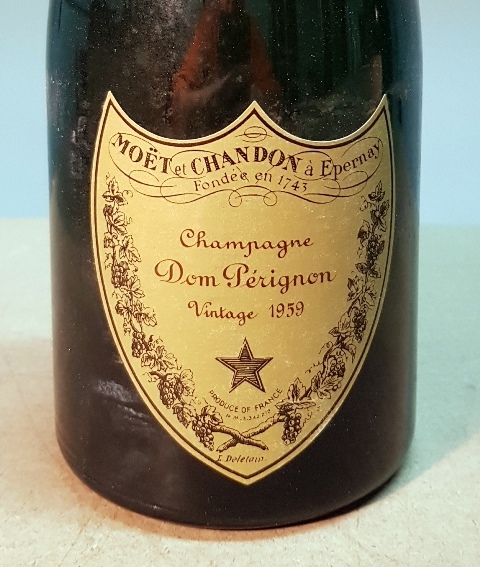 Aussi est-ce pour moi une grande inconnue, car si nous commençons par un champagne fatigué, cela peut changer l’atmosphère du dîner. 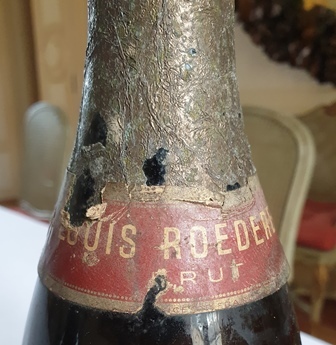 Je prie le ciel et le sommelier me verse le premier verre du Champagne Louis Roederer 1928. La couleur est quasiment rose. 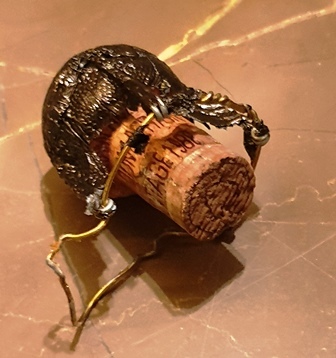 Il n’y a aucune bulle mais en bouche je ressens le pétillant et, ouf, le champagne est d’une pureté exemplaire. Il est précis, n’a pas un gramme de défaut et son goût est charmant, intense, profond. 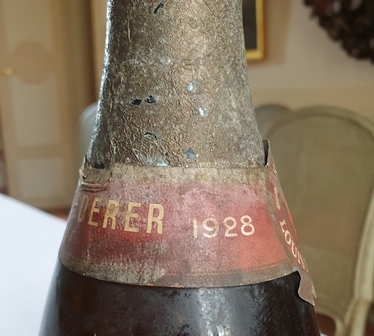 C’est un immense champagne de 1928. Il laisse en bouche une trace forte faite de beaux fruits rouges. 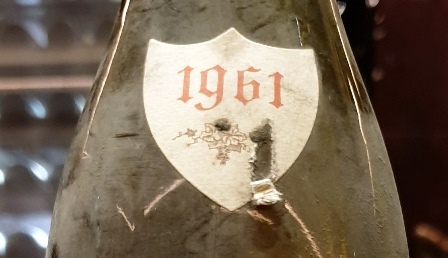 Le Champagne Dom Pérignon 1959 est ouvert et si le pschitt est faible, la bulle est plus visible et la couleur est plus claire. 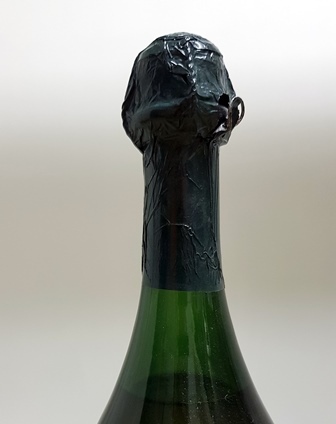 C’est manifestement un grand Dom Pérignon, vineux, actif et présent, mais j’avoue que j’ai un petit faible pour le Louis Roederer plus complexe. Les petits canapés sont délicats. 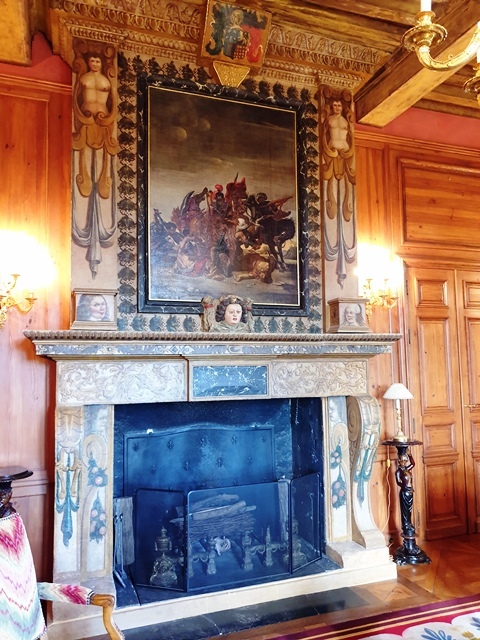 Nous passons à table dans la très jolie salle à manger du château. 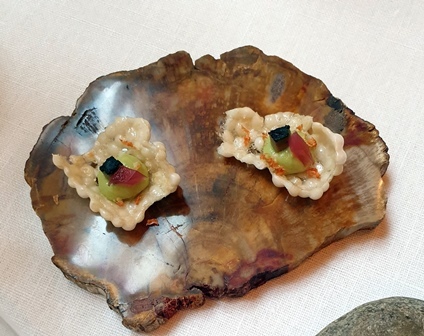 Le menu conçu par Olivier Brulard, chef du château et mis au point avec moi est : amuse-bouches à déguster du bout des doigts / langoustines « au bleu » à l’eau fraîche de pamplemousse, caviar Royal en robe des champs / homard cuisiné doucement au sautoir, jolies écailles de truffes primeur / bar de ligne en habit d’automne / pigeonneau en bécasse « Grande Tradition » / foie gras de M. Dupérier légèrement fumé / foie gras poché, à la croque-au-sel / fromages sélectionnés et affinés par Dominique Bouchait M.O.F. 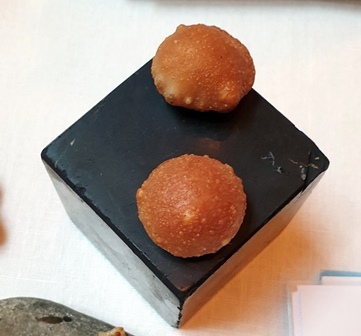 / Croustade « 18 Carats » de mangue cueillie bien mûre au jus de passion / financiers d’une bouchée à la réglisse. 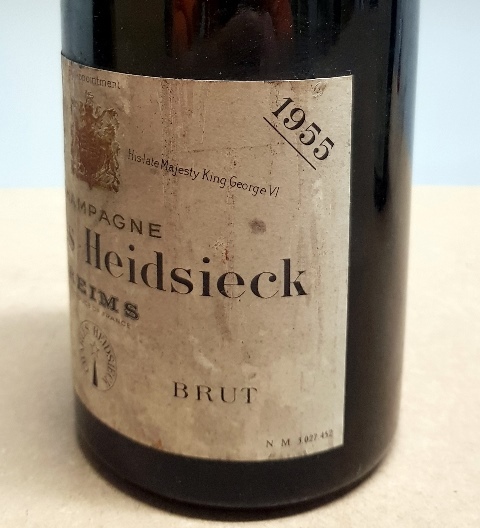 Le Champagne Charles Heidsieck 1955 est comme les deux précédents d’une pureté et d’une précision remarquables. 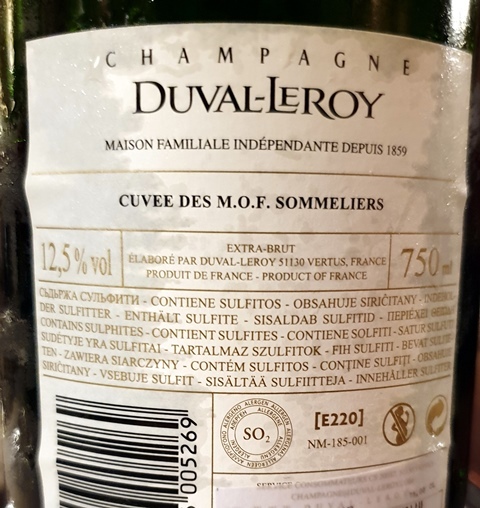 Mes convives se demandent comment il est possible d’avoir trois champagnes aussi anciens, donc à risque, qui se présentent aussi parfaits. Le 1955 est racé, long, avec une personnalité affirmée qui va trouver avec la langoustine et sa gelée d’eau de pamplemousse un accord qui est probablement le plus beau du repas avec celui que l’on aura sur un foie gras poché. La présentation du plat est d’une esthétique remarquable. Le champagne vibre avec la chair de la langoustine servie fraîche mais encore plus avec l’eau de pamplemousse. 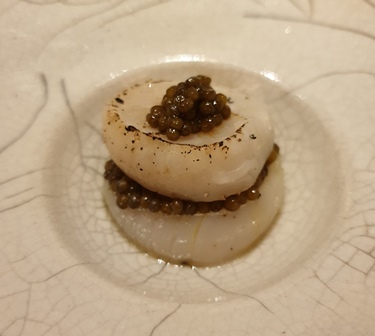 Et le point final est donné par le caviar mis en valeur par une douce pomme de terre qui donne un coup de fouet au champagne. Des trois champagnes, c’est le Dom Pérignon qui faisait son âge c’est-à-dire une belle maturité, tandis que les deux autres du fait de leur intensité n’ont pas d’âge. Sur le homard nous avons deux montrachets. Le Montrachet Domaine de la Romanée Conti 1997 a le nez glorieux du montrachet du domaine. Théoriquement il n’est pas d’une année très puissante, mais en pratique il est flamboyant et très large. Gouleyant il n’est pas gras comme d’autres plus puissants mais il est joyeusement épais et intense. 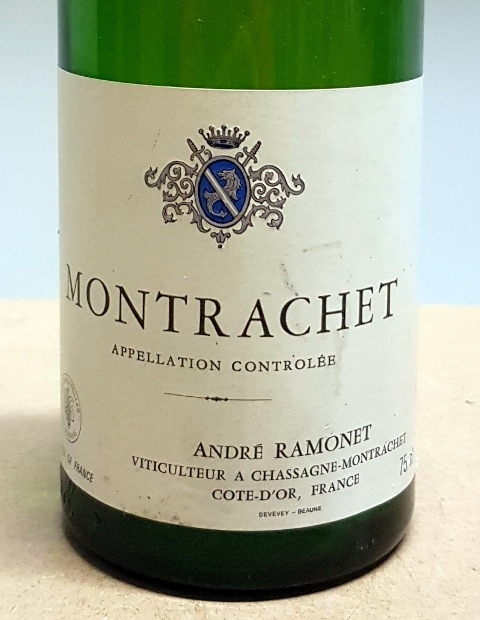 Le Montrachet Grand Cru Domaine Ramonet 1978 est très différent. Tout d’abord il n’a pas la moindre trace de bouchon que je redoutais. Je m’étais fait peur pour rien. Si le 1997 est d’une largeur extrême, donnant une bouche joyeuse, le 1978 est tout en profondeur et en raffinement. Préférer l’un ou l’autre n’est pas facile. L’ami italien préfère le Ramonet qui est d’une présentation idéale et n’a pas d’âge. 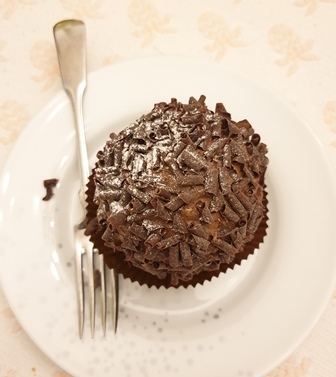 Le Ramonet est très racé, le Conti est très gourmand. 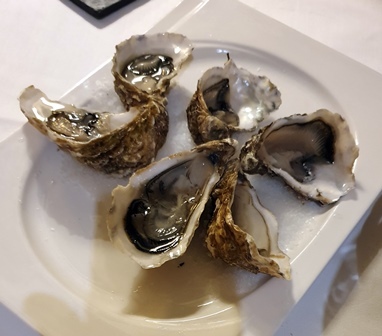 Je dirais que pour le homard parfait et généreusement truffé, c’est le Conti 1997 qui est le plus gratifiant. Mais la noblesse du Ramonet est extrême. Le bar de ligne aux champignons est accompagné de deux grands bordeaux et beaucoup de convives vont être admiratifs de la pertinence d’un accord qu’ils n’auraient pas imaginé. 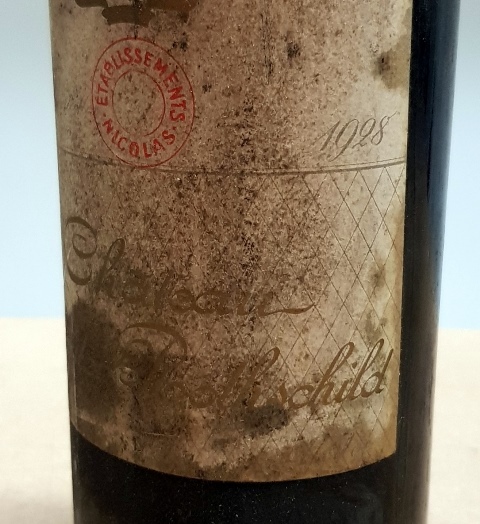 Le Château Cheval Blanc Fourcaud Laussac 1945 a un nez de truffe d’une puissance extrême et en bouche, il est généreux, puissant, concentré, carré, glorieux et tellement bon qu’on serait prêt à le placer au-dessus du 1947 plus légendaire et plus atypique. Ce vin truffé est une splendeur et je suis heureux d’avoir pu le mettre en présence de celui qui dirige le château Cheval Blanc. 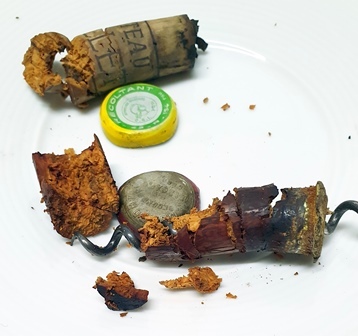 Le vin a un tel équilibre qu’il semble indestructible et bâti pour l’éternité. 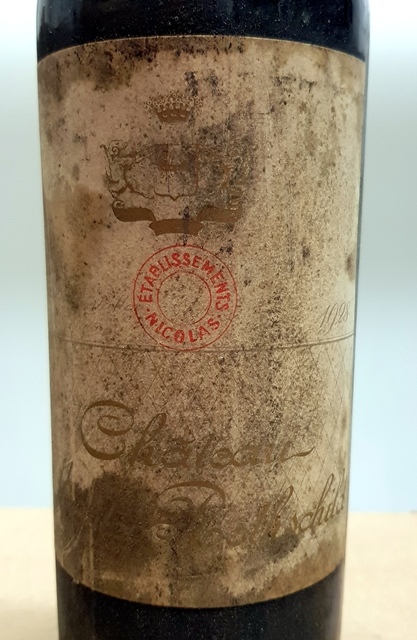 A côté de lui le Château Mouton Rothschild 1928 est un Mouton exceptionnel, tout en charme et en énigmes. Il est insaisissable. Je suis totalement sous son charme. Le Cheval Blanc est masculin, solide guerrier alors que le Mouton est féminin, tout en charme. Et ce qui est bien, c’est que les deux vins ne se nuisent pas, au contraire, on passe de l’un à l’autre en développant son plaisir. 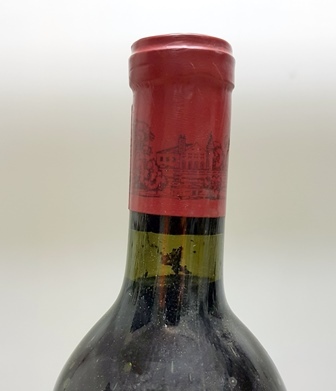 Nous buvons deux immenses bordeaux et je ne m’attendais pas à ce que Mouton 1928 soit aussi complexe et brillant. Le pigeon accompagne deux bourgognes, et là aussi on a comme pour les montrachets et les bordeaux deux vins très différents. 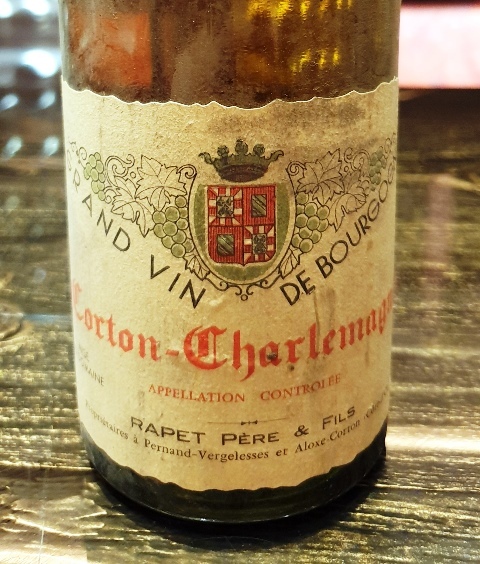 Le Mazy Chambertin Grand Cru Domaine Armand Rousseau 1966 a un nez diabolique à réveiller les morts. C’est l’affirmation de la Bourgogne la plus terrienne, travailleuse, les pieds dans la glaise. 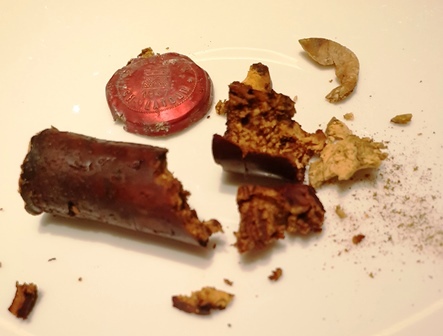 C’est une Bourgogne qui prend aux tripes et en bouche on a un vin de plaisir, nature, diaboliquement séduisant. 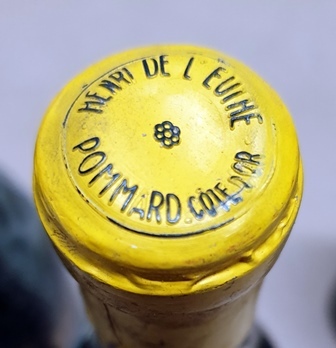 A côté, La Tâche Domaine de la Romanée Conti 1983 est porteuse de la subtilité du domaine de la Romanée Conti. On est dans l’élégance. Le pigeon parle beaucoup plus avec le Mazy Chambertin. Alors que le foie gras fumé qui est servi après converse élégamment avec La Tâche. J’ai un petit faible pour le plus roturier des deux. 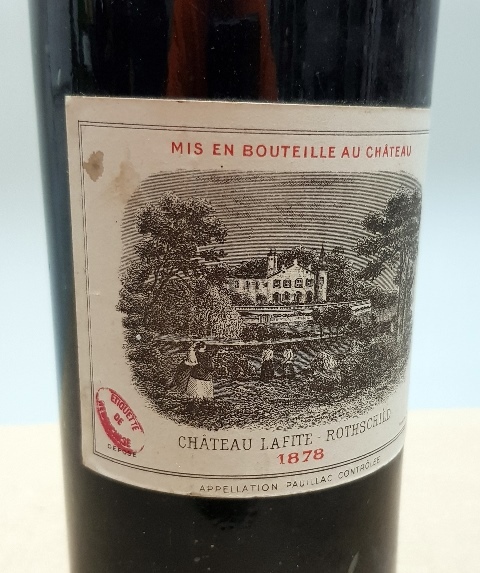 Le Château Lafite-Rothschild 1878 est comme le Charles Heidsieck 1955 seul sur un plat, sur le foie gras poché. 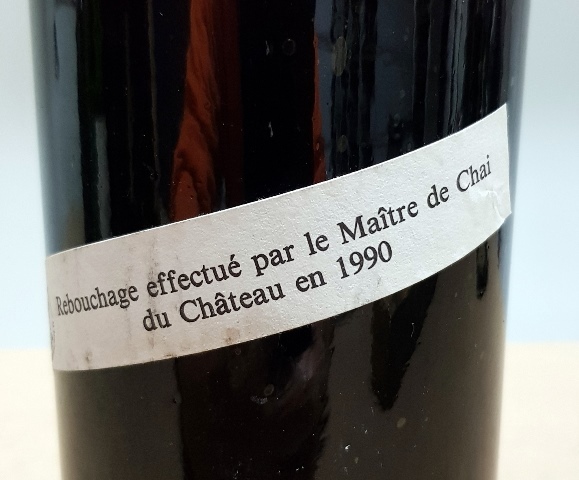 Ce vin a été reconditionné au château en 1990 avec les marques qui attestent de cette opération. Le vin a une belle couleur très jeune. Le nez est intense. Il est incroyable de finesse, de noblesse et d’accomplissement. Il paraît si naturel. 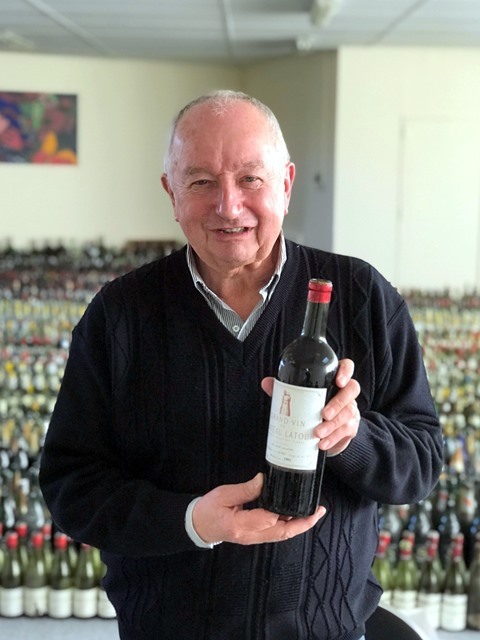 J’en ai parlé discrètement avec Pierre Lurton, qui est d’accord avec moi, l’âge se sent avec un léger goût viandeux probablement latent et surgi lors du rebouchage, ce qui signe l’authenticité du vin et ne nuit pas au plaisir au point que ce vin sera le seul à figurer sur les douze feuilles de vote, consacrant sa première place des vins du repas. L’accord avec le foie gras est magique et la douceur met en valeur toutes les subtilités du vin. 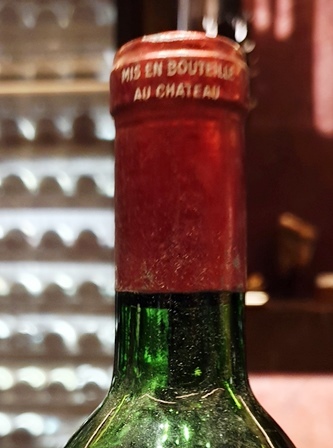 Nous avions eu au 200ème dîner un Lafite 1898 superbe. Celui-ci est au moins au même niveau, peut-être un peu plus romantique et délicat. 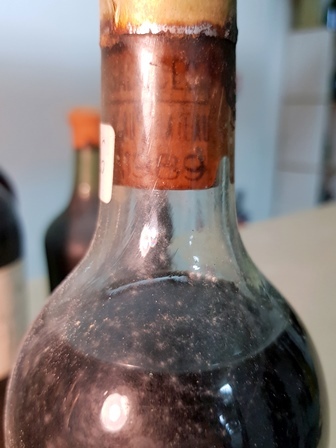 C’est un vin d’anthologie de 140 ans. 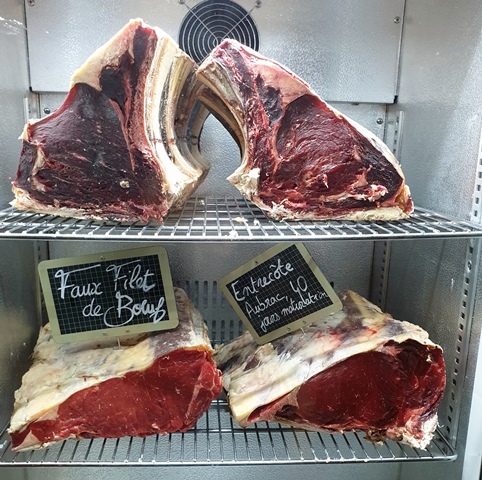 A ce stade nous nous demandons comment nous allons pouvoir hiérarchiser des vins aussi différents et tous parfaits. C’est maintenant le moment des trois sauternes servis en même temps. 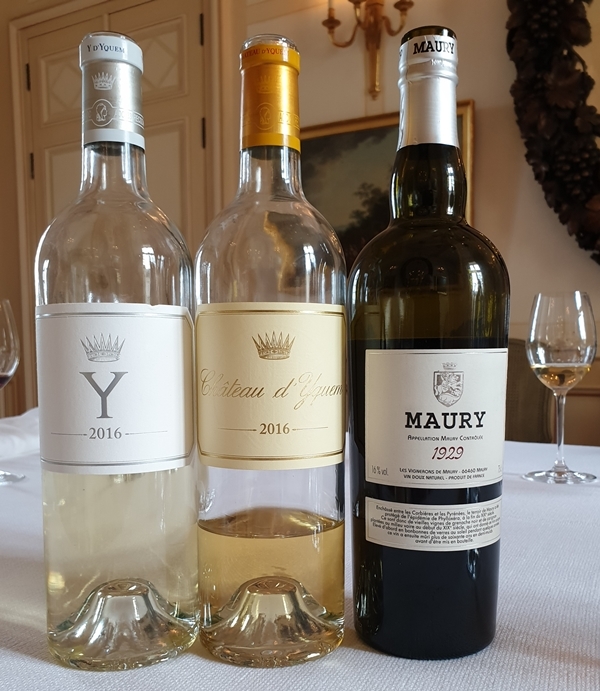 De gauche à droite nous avons Château Sigalas Rabaud 1917, Château d’Yquem 1937, Château d’Yquem 1891. Les couleurs des deux extrêmes sont quasiment identiques, d’un acajou très foncé, et le 1937 est ambré mais plus clair que les deux autres. 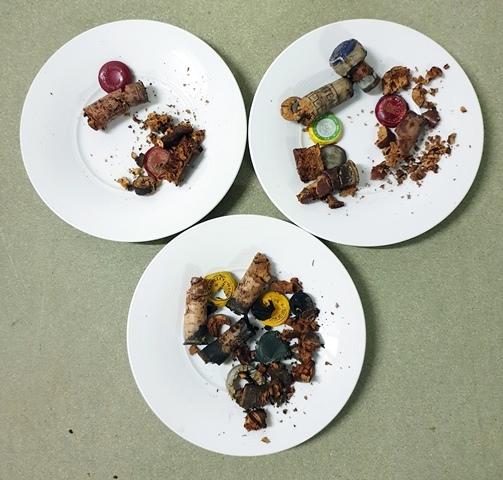 Ces trois vins auront deux services, les cinq fromages puis le dessert. 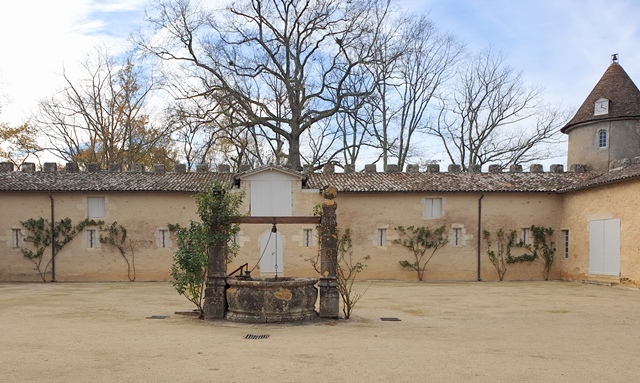 Le Château Sigalas Rabaud 1917 est une immense surprise car il se situe tout en haut de l’élite des goûts de sauternes. Il est profond, riche, avec de notes de caramel ou de banane confite, mais c’est surtout sa race qui est belle. Il sera voté une fois comme premier et il le mérite. 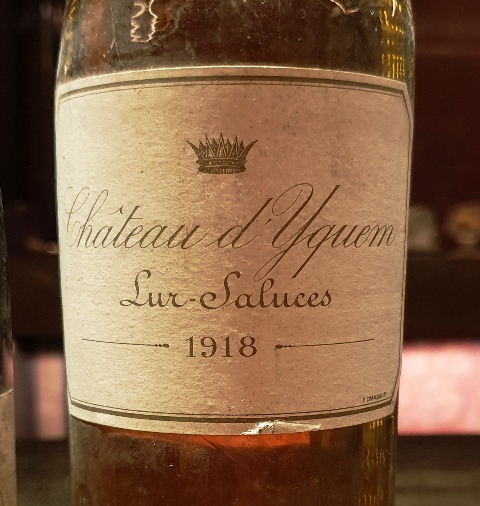 Le Château d’Yquem 1937 est un guerrier conquérant. C’est l’Yquem glorieux, juteux, joyeux, c’est Marlon Brando dans sa jeunesse. Car cet Yquem est très jeune, et tiendra des décennies. 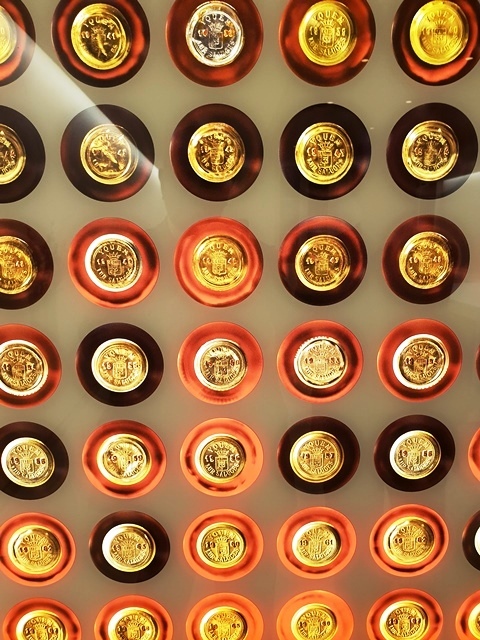 Le Château d’Yquem 1891 est d’une complexité infinie. Je tombe sous son charme, car il est tellement subtil, évocateur, intrigant. Son parcours en bouche est à multiples facettes. Il a le charme, la séduction puis l’énigme, la subtilité, l’intrigue même. On n’en fait jamais le tour. Je suis conquis par sa complexité car ce n’est pas un Yquem puissant, c’est un Yquem de méditation. 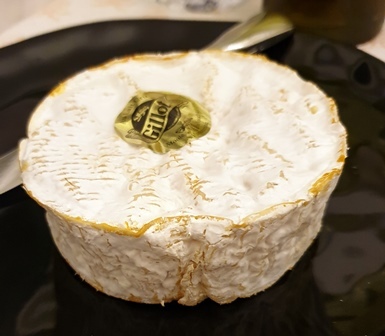 Les fromages se sont bien comportés avec les trois sauternes et l’accord avec le dessert à la mangue est tellement naturel qu’on en jouit sans se poser de question, car c’est parfait. Vient maintenant sur de judicieux financiers le Malaga 1872 dont l’étiquette manuscrite ne porte que ces seules mentions. Je me pâme. Car ses saveurs exotiques, irréelles sont inimaginables. On est transporté sur une planète de luxure. Tout est puissant mais tellement délicat. La longueur est infinie. On est au paradis. Et ce qui le rend magique c’est que ce sont des goûts totalement non familiers. Joe, fidèle ami présent à Veuve Clicquot et au 200ème dîner me dit que jamais de sa vie il n’a eu un dîner de cette dimension. 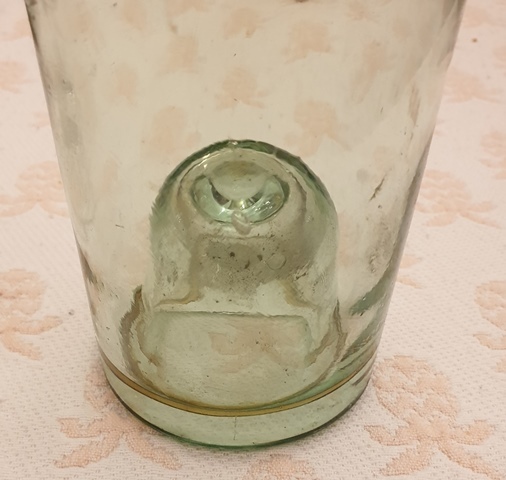 Il est aux anges et j’avoue que je ne m’attendais pas à ce que tous les vins du dîner ne puissent faire l’objet d’aucune critique. Ils sont au sommet de ce qu’ils peuvent apporter. Comment pouvoir voter dans ces conditions, beaucoup me le disent mais c’est la règle il faut voter. Nous sommes douze à voter pour les cinq vins préférés sur quatorze vins. Treize vins figurent dans les votes ce qui confirme bien l’excellence de tous. Si le Charles Heidsieck n’est pas dans les votes ce n’est pas à cause de sa qualité qui est extrême, c’est qu’à la fin du repas, la mémoire s’estompe sur les vins du début. Ce qui me ravit encore plus, c’est que huit vins ont été jugés dignes d’être premiers. Incroyable ! 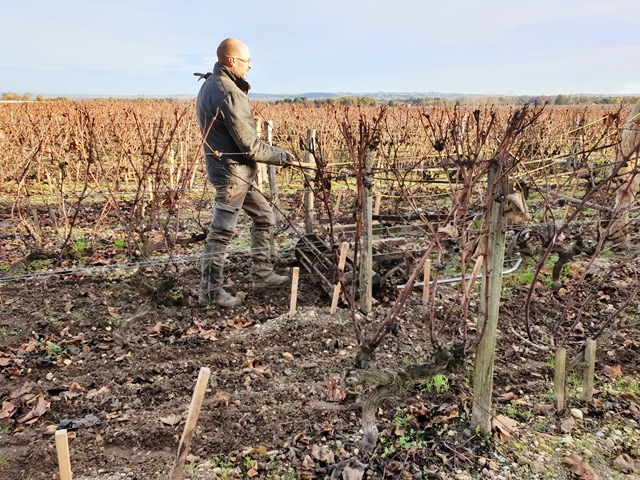 Quatre vins ont été jugés premiers deux fois et quatre vins ont été jugés premiers une fois. 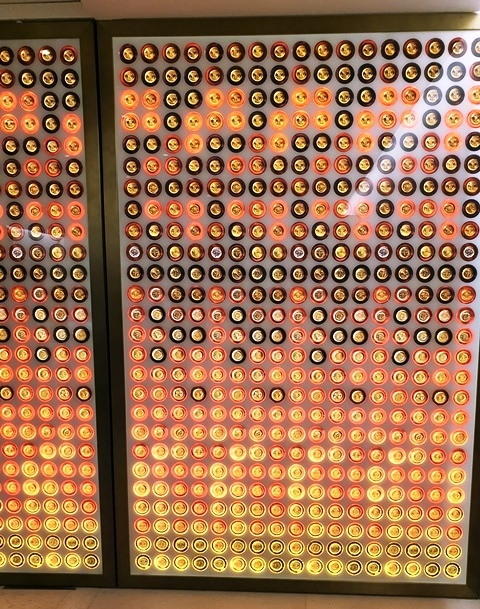 Les doubles premiers sont : Lafite 1878, Yquem 1937, Yquem 1891 et Malaga 1872. Les quatre votés une fois premiers sont : Cheval Blanc 1945, Mouton 1928, Mazy Chambertin 1966 et Sigalas Rabaud 1917. 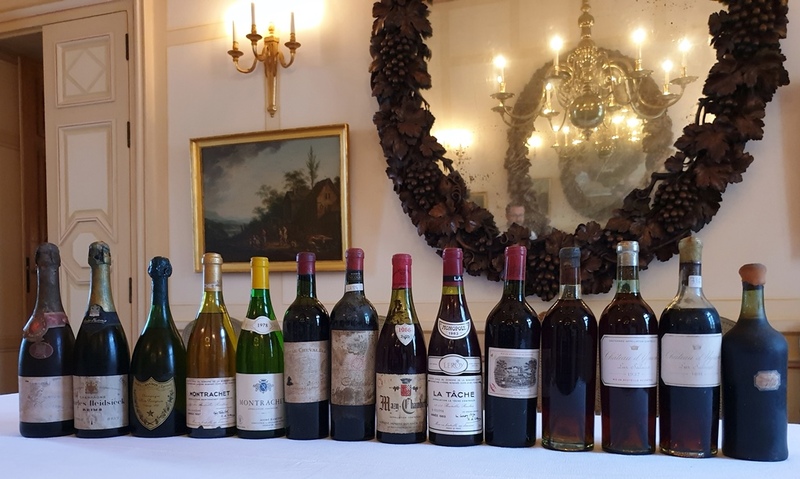 Le classement du consensus serait : 1 – Château Lafite-Rothschild 1878, 2 – Château d’Yquem 1891, 3 – Château Mouton Rothschild 1928, 4 – Château Cheval Blanc 1945, 5 – Château d’Yquem 1937, 6 – Malaga 1872. 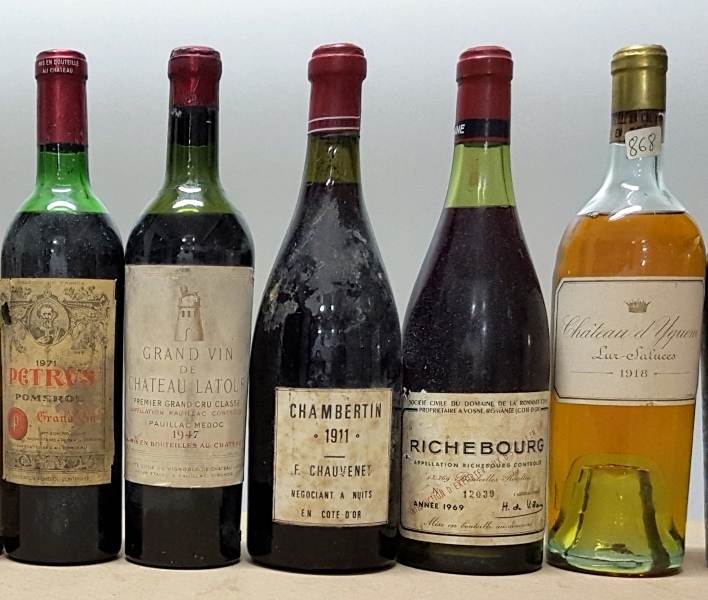 Mon classement est : 1 – Malaga 1872, 2 – Château d’Yquem 1891, 3 – Château Lafite-Rothschild 1878, 4 – Château Cheval Blanc Fourcaud Laussac 1945, 5 – Champagne Louis Roederer 1928. 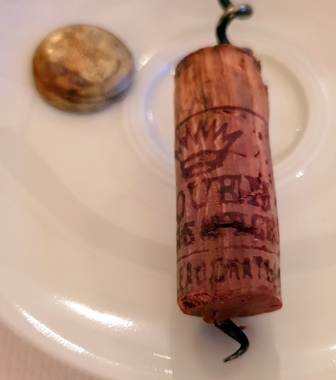 Dans un dîner où il y a deux vins excellents du domaine de la Romanée Conti, constater qu’aucun des deux ne figure parmi les six premiers, cela indique le niveau des autres. 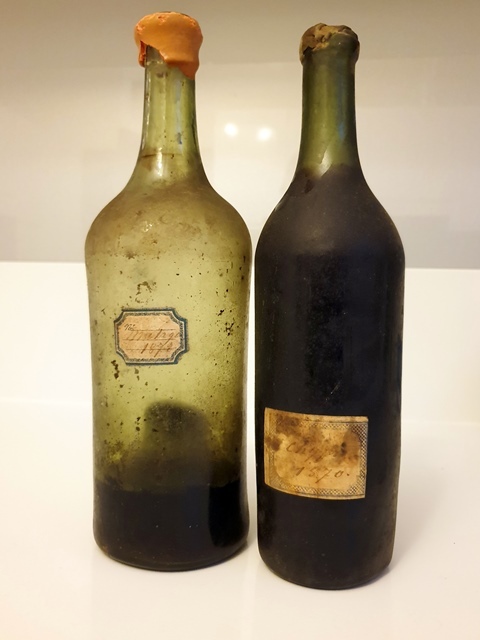 Un raison est que l’on a couronné les vins très anciens puisque l’âge moyen des six vins classés est de 110 ans. Ceci explique cela. Que dire de ce dîner sinon que tout fut parfait. Les vins ont fait un sans-faute qui a impressionné les convives. Les accords mets et vins, même osés, furent parfaits. Le lieu où s’est tenu le dîner est magique et Pierre Lurton nous a accueillis avec amitié. C’est probablement l’un des trois plus grands dîners que j’ai organisés, sinon le plus grand. L’atmosphère d’amitié qui s’est créée entre les convives en fait un dîner rare. 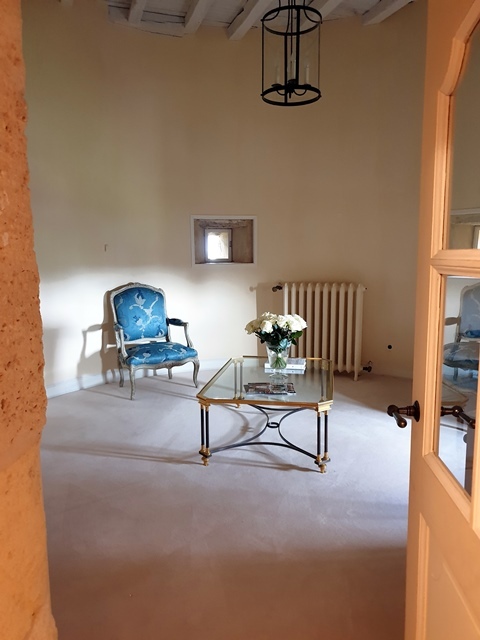 salle de dégustation à la jolie décoration et des Yquem jeunes ! Après une nuit de repos à l’hôtel Lalique, j’ouvre les volets sur un jour ensoleillé. La journée commence bien. 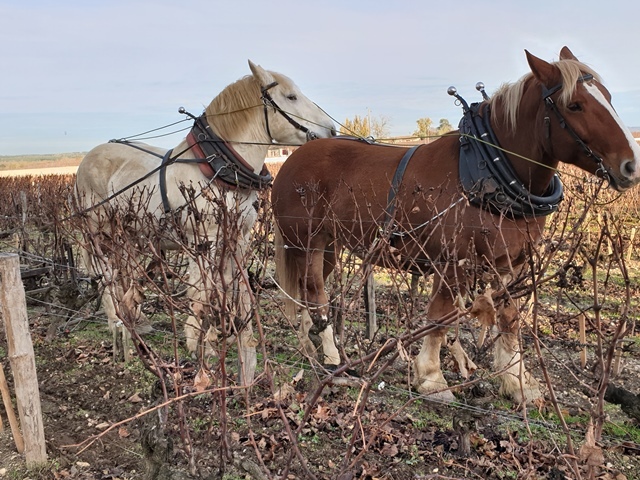 Je marche un peu avant le petit-déjeuner et je vois un vigneron qui dirige deux chevaux, un blanc et un marron, qui tirent un soc de sa fabrication qui permet, selon ses dires, de diviser par deux le nombre de passes dans les rangées de vignes du château Lafaurie-Peyraguey. 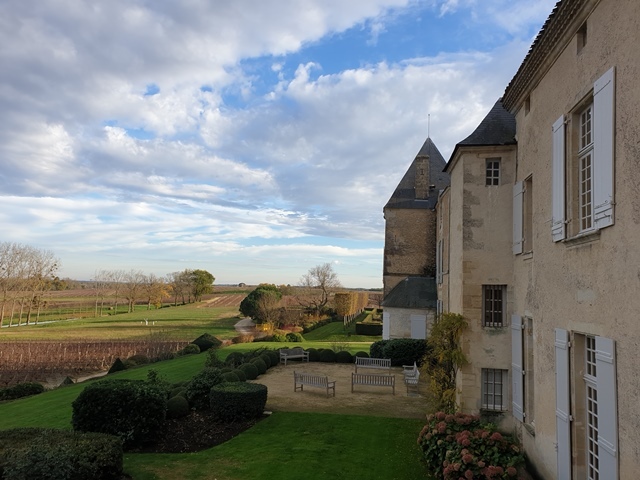 Je prends le petit-déjeuner avec mes deux amies américaines qui vont déjeuner avec moi au château d’Yquem. A midi nous nous présentons au château. 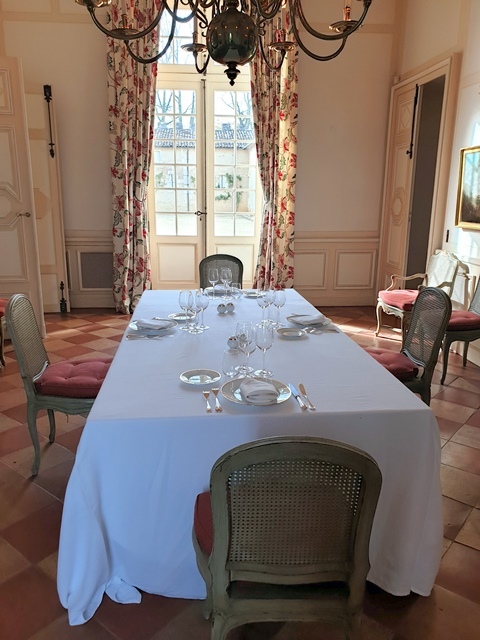 Valérie, la collaboratrice précieuse du président d’Yquem qui assistait Alexandre de Lur Saluces et maintenant Pierre Lurton sera présente au déjeuner traditionnel qui précède mes dîners en ce lieu, alors que Sandrine Garbay et Francis Mayeur, qui font Yquem et ont assisté aux précédents repas ne seront pas là, retenus par d’autres obligations. 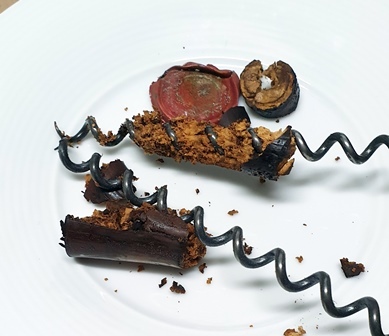 Nous serons donc quatre à tester des plats du dîner que j’ai mis au point sur le papier il y a deux mois avec Olivier Brulard, le chef du château, meilleur ouvrier de France (MOF) 1996 qui a fait ses armes notamment avec Michel Guérard. 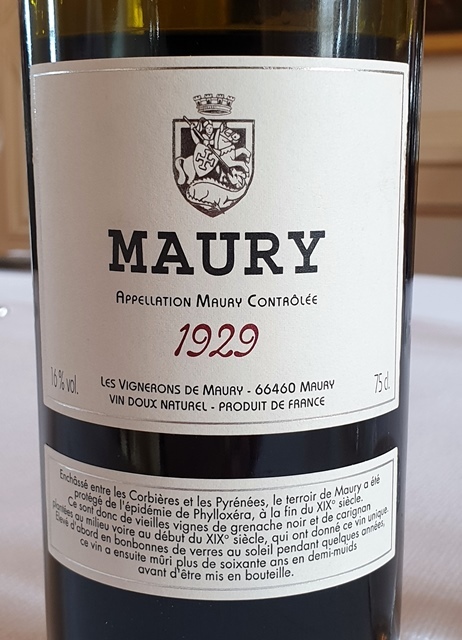 J’ai apporté un Maury des Vignerons de Maury 1929 qui peut accompagner les plats que nous allons tester mais ne servira pas de témoin, car ce sont des vins bien différents qui seront bus sur les plats ce soir. 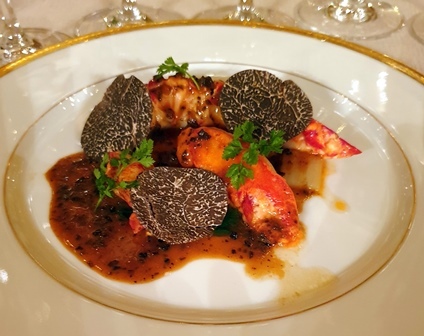 Le premier plat que nous essayons est le homard cuisiné doucement au sautoir avec de jolies écailles de truffes primeur. Le plat est délicieux. Le cerfeuil en fines feuilles rafraîchit bien le plat ainsi que les feuilles de blettes mais il faut enlever le cœur de blette trop abondant et amer et n’en conserver que des timbres postes. 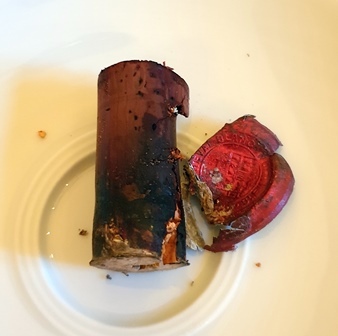 Nous buvons un ‘Y’ d’Yquem 2016 très vert et un peu trop sec, qui va s’élargir dans la suite du repas. Le Maury est très adapté au homard et crée un bel accord car ce vin qui titre 16° a beaucoup de fraîcheur. Il a vieilli en demi-muids pendant plus de soixante ans ce qui lui a donné une belle fluidité et une grande délicatesse. 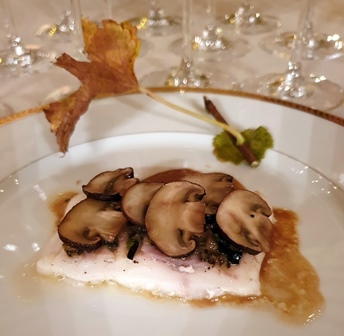 Le plat accompagnera deux montrachets, un du domaine de la Romanée Conti et un de Ramonet. Olivier est d’accord de faire un plat moins réduit, plus aérien et moins salé. Nous nous comprenons bien. Nous essayons ensuite le foie gras. Dans le menu il est prévu : foie gras de M. Dupérier légèrement fumé puis poché, à la croque-au-sel. 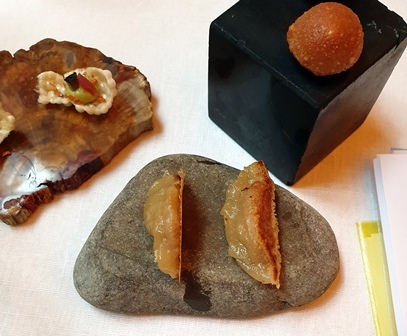 L’assiette comporte les foies gras en deux façons, poché et fumé. 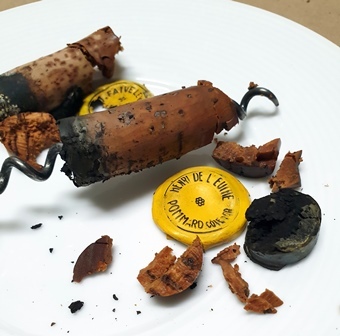 Il m’apparaît tout de suite qu’il ne faudra pas de fumé, Car le Lafite 1878 ne l’acceptera pas. Il faut aussi enlever les pignons de pin plantés dans les foies. Il se trouve qu’Olivier qui a préparé les foies ne pourra pas mettre deux tranches de poché par personne aussi la solution que nous adoptons est que les foies gras fumés soient servis en deuxième plat pour les bourgognes, après le pigeon, et le foie gras poché sera comme prévu pour le Lafite. 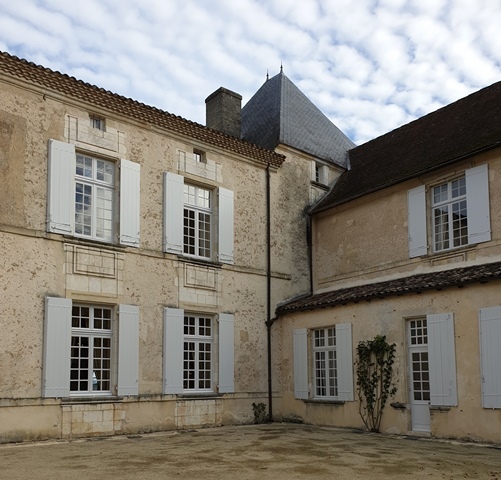 Nous buvons le Château d’Yquem 2016, merveilleux dans sa jeunesse folle car il a la candeur et les joues roses d’un bébé. Et cela va bien avec les foies. Le Maury aussi trouve sa place avec le foie non fumé. 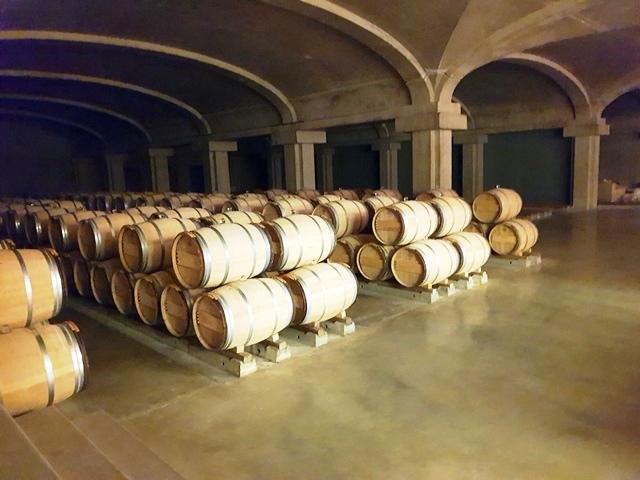 L’Yquem 2016 sera grand, un Yquem plus frais que puissant. 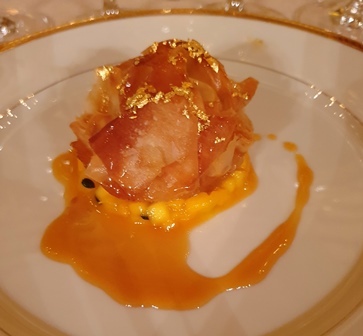 Le dessert est une croustade « 18 Carats » de mangue cueillie bien mûre au jus de fruit de la passion. 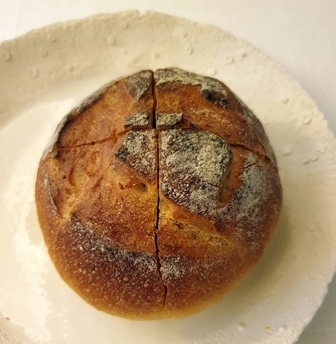 J’ai un peu de mal avec la mâche de la croustade, dont le feuilleté se brise en bouche, mais comme mes charmantes convives s’en accommodent, on ne touchera pas à cette recette traditionnelle landaise qui sera parfaite pour les trois sauternes de 1937, 1917 et 1891. Nous refaisons le point avec Olivier Brulard. 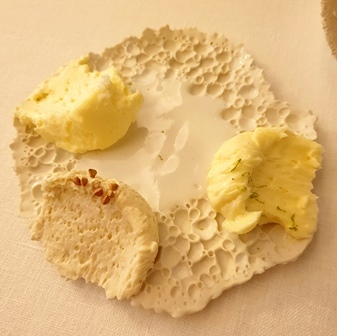 Je change la taille des couteaux pour couper le homard, j’exclus les pains pour l’assiette de fromage, je détermine la position des verres sur table, car nous en aurons quatorze qui resteront sur place, je donne les consignes de service du vin par rapport aux plats. Tout semble sur les rails. Ce soir Olivier sera assisté du chef de Cheval Blanc pour qu’il profite de cette expérience. Mes amies américaines logeront comme moi ce soir au château. 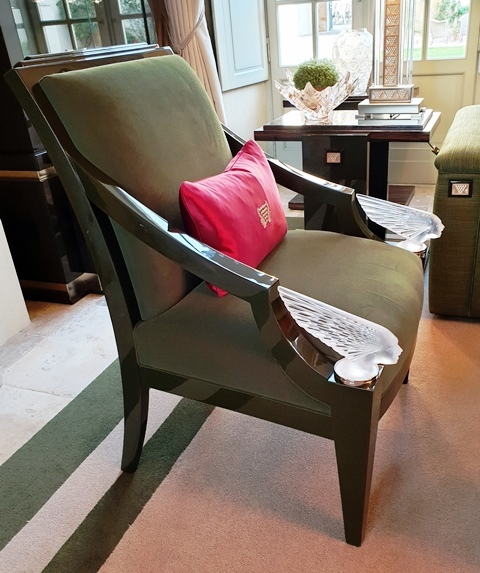 Il se trouve qu’elles ont oublié quelque chose à l’hôtel Lalique. Il est à moins de deux kilomètres de distance. C’est un bon prétexte pour aller faire une promenade digestive réparatrice, car à 16 heures, c’est à mon tour de travailler pour une phase cruciale, l’ouverture des vins. Après la promenade et une minuscule sieste, je suis d’attaque pour l’ouverture des vins. Valérie a renforcé l’équipe de cuisine habituelle du château et il y aura un sommelier pour le service des vins, qui assiste en plus de mes amies américaines à cette cérémonie. J’ouvre les vins dans l’ordre de service. 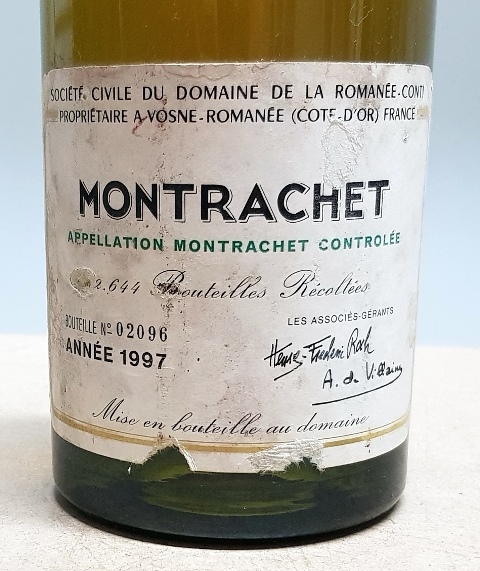 Le Montrachet Domaine de la Romanée Conti 1997 a un parfum d’une générosité rare. Il est gras et joyeux. Le Montrachet Domaine Ramonet 1978 me fait peur. Je redoute un éventuel goût de bouchon, malgré le fait que le bouchon ne sent pas le bouchon. 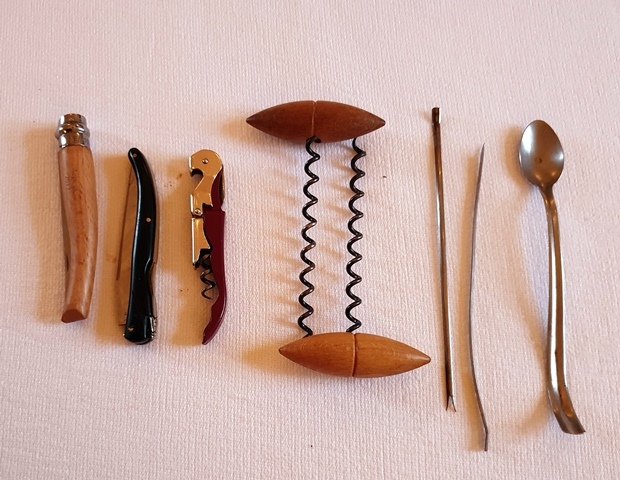 Le sommelier ne ressent rien. Espérons que tout se passe bien. Le parfum du Cheval Blanc 1945 est impérial et glorieux. Ouf ! Car j’aurais été gêné si le vin que dirige Pierre Lurton n’était pas à la hauteur. 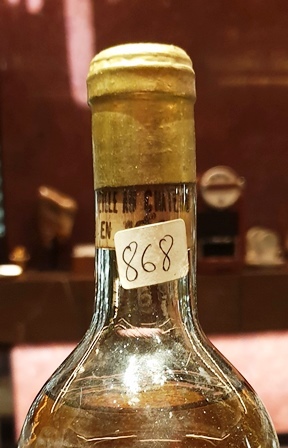 Le Mouton Rothschild 1928 a un parfum qui me semble d’une délicatesse rare. Pour l’instant, ça va. 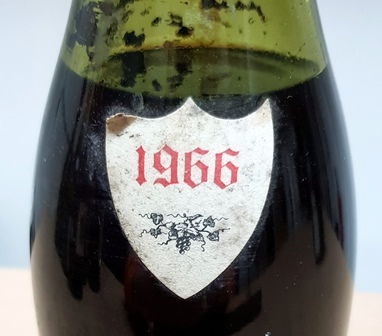 Le Mazy Chambertin Armand Rousseau 1966 a un parfum diabolique. C’est toute la Bourgogne terrienne et laborieuse qui explose dans mes narines. 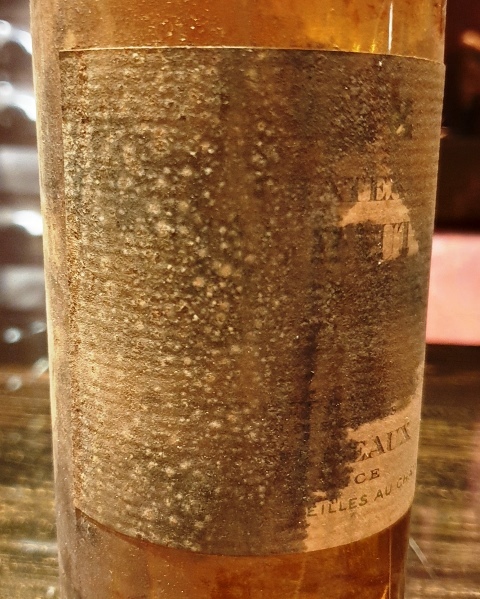 A l’inverse, La Tâche Domaine de la Romanée Conti 1983 a un parfum noble et distingué tout en retenue. Ça allait pour les bordeaux, ça va pour les bourgognes. Comme disait Laetitia, la mère de Napoléon, « pourvu que ça dure ». 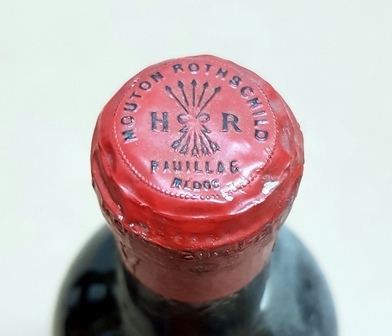 Le Lafite-Rothschild 1878 a un parfum miraculeux. 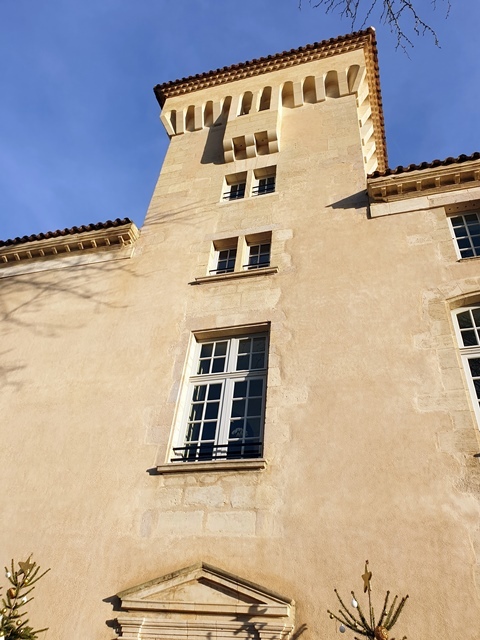 La bouteille a été reconditionnée au château en 1990. Le vin a une couleur très rubis clair. Le vin s’annonce suave. Là aussi, je pousse un « ouf » de satisfaction. 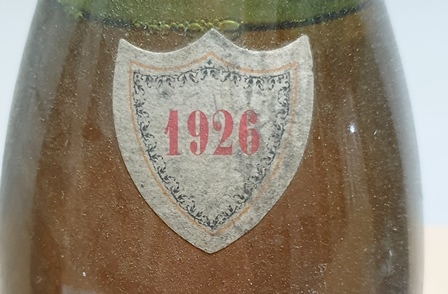 Le Sigalas Rabaud 1917 est une énorme surprise car son parfum (je ne goûte aucun vin, je les sens seulement) joue dans la cour des grands. 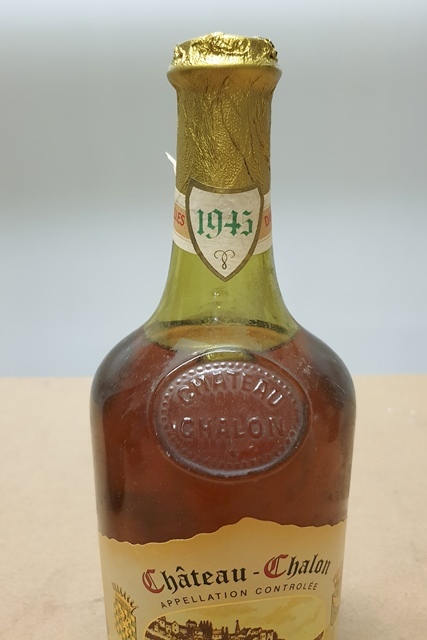 Il va faire jeu égal avec le parfum tonitruant de l’Yquem 1937 qui provient de la cave d’Yquem et n’a jamais bougé, et avec le parfum d’une subtilité confondante de l’Yquem 1891. 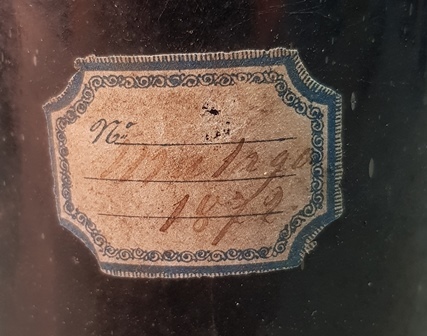 Et la cerise sur le gâteau, comme l’apparition de Liz Taylor en Cléopâtre, c’est le parfum inouï du Malaga 1872, concentré de parfums des mille et une nuits. L’opération d’ouverture a duré une heure et demie car je me suis bagarré avec de nombreux bouchons qui ne voulaient pas sortir. 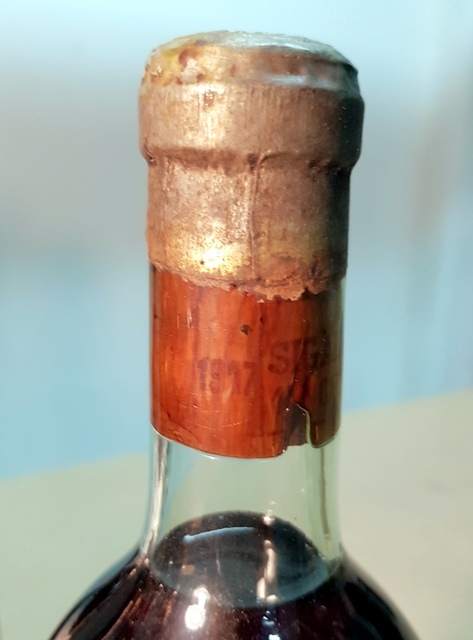 Et j’ai eu une frayeur qui m’a donné des suées, c’est avec le bouchon de l’Yquem 1891 qui, dès que j’ai sectionné la capsule est descendu dans le goulot et aurait plongé dans le liquide si je n’avais pas réussi à l’agripper en faisant des manipulations d’une douceur extrême puisque chaque essai de piquer le bouchon le faisait descendre. Epuisé par ces 90 minutes de tension permanente je remonte dans ma chambre pour me préparer car les festivités commencent dans une demi-heure. Sous ma douche j’ai le sourire béat de l’idiot du village, je suis ‘lou ravi’ car je sais que mes vins seront au rendez-vous. 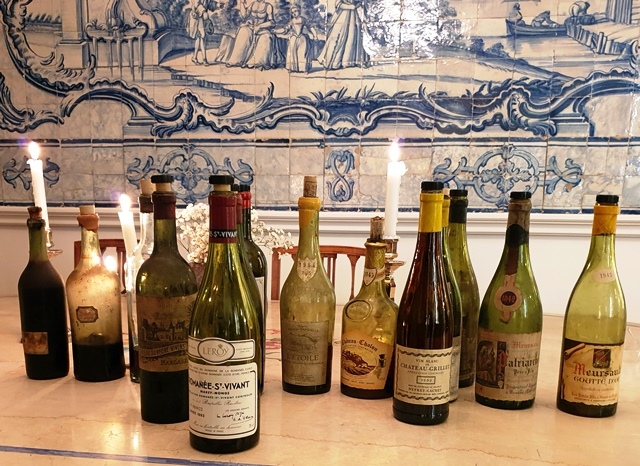 This is the 18th year that I organize a dinner of winemakers known as the « dinner of friends of Bipin Desai » because it was he who had the idea. He is a great collector of wines of Indian origin living in California, organizer of fantastic vertical tastings of the greatest estates, and also professor of nuclear physics at Berkeley. 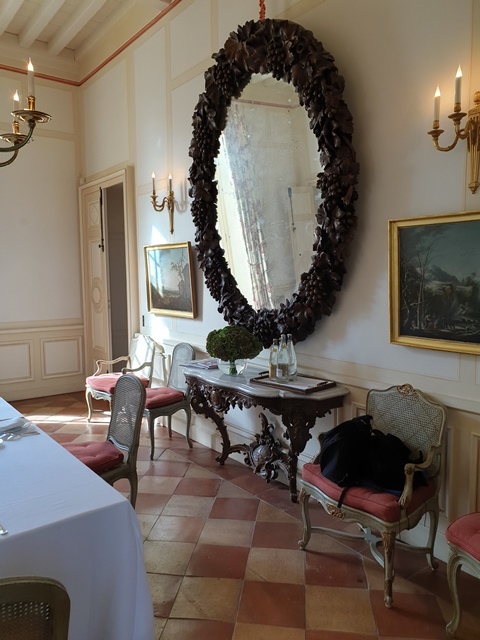 My task was to collect, register, receive the wines brought by the winemakers and develop the menu, thanks to Ghislain, very competent sommelier, with the chef of restaurant Laurent, Alain Pégouret. The dinner being organized as one of my dinners will be the 229th. 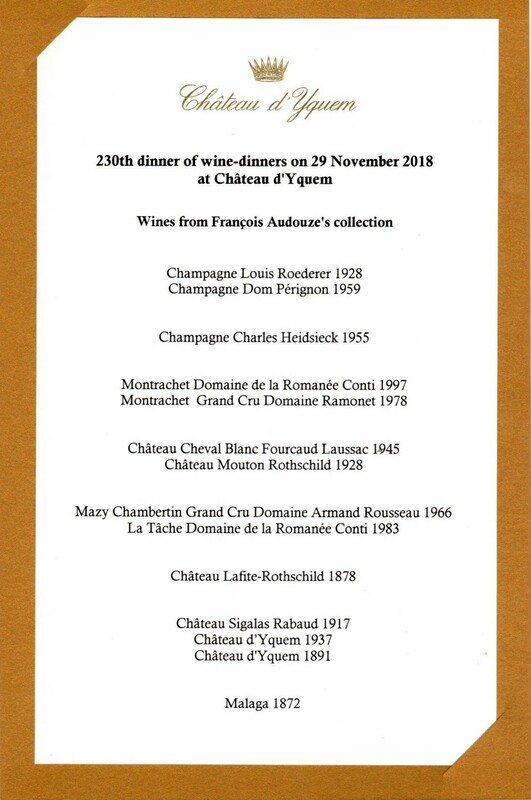 There are ten of us: Frédéric Barnier (Louis Jadot), Philippe Foreau (Clos Naudin), Marc Hugel (Maison Hugel), Jean-Luc Pépin (Comte Georges de Vogüé domain), Rodolphe Péters (Pierre Péters champagnes), Charles Philipponnat (Champagnes Philipponnat), Pierre Trimbach (Maison Trimbach ), Aubert de Villaine (Domaine de la Romanée Conti), Bipin Desai and me. At 16:30 I open the bottles which, with few exceptions, are relatively young. 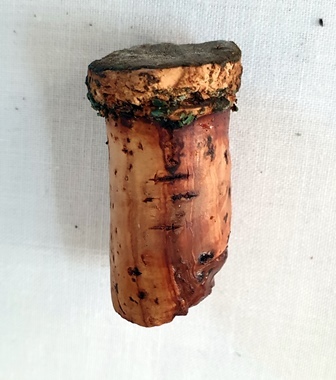 I find that almost all corks are very tight in the necks, requiring great effort to remove them. Is it weather-related, I do not know. All smells are encouraging, and some even magical. 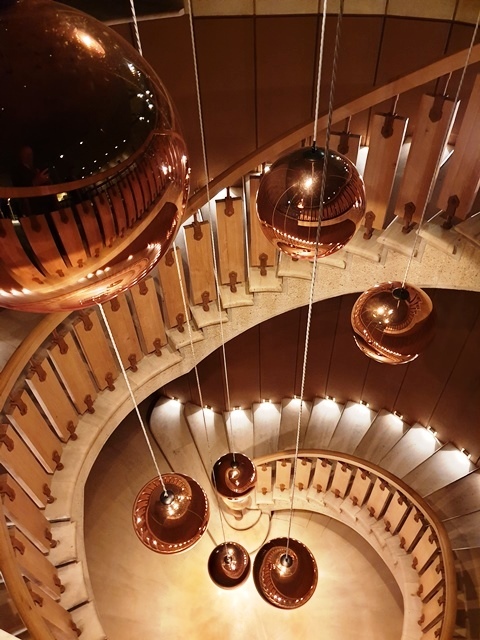 The aperitif is taken in the beautiful rotunda of the entrance of the restaurant with Champagne Pierre Péters Cuvée Les Chétillons magnum 2002 disgorged in 2012. 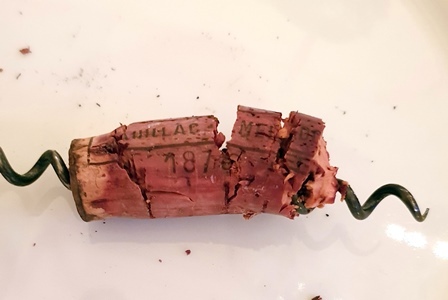 I had it opened by Ghislain an hour and a half before the aperitif and despite that the champagne seems to me closed, a little tight. But it needed the delicious appetizers to reveal it. These appetizers are precise, without fuss and very effective to expand the champagne. 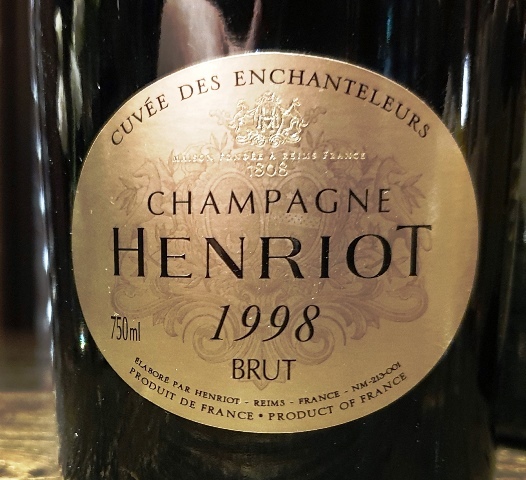 Rodolphe Péters says that this 16-year-old champagne is starting to take its personality and the scale it must have. It’s a big balnc de blancs of Mesnil-sur-Oger, the mecca of blanc de blancs. We sit down to table. The menu created by Alain Pégouret is: Scallops marinated with a mushroom of olive oil lemon caviar and red pepper of Pondicherry, jelly of cucumber and mint, tortilla guacamole / sweet onion confit and caramelized, light cream of apple ‘ Charlotte ‘, Alba white truffle, Parmesan cheese and flowing yellow / Veal sweetbreads caramelized with balsamic apple vinegar, chips and chestnut muslin, chanterelles and bacon au jus / Rack of lamb of Lozère cooked on a marinière, « shots and creamy artichokes and crystalline / Queen apple pudding, blackcurrant yoghurt, ice cream with beer / Financiers. 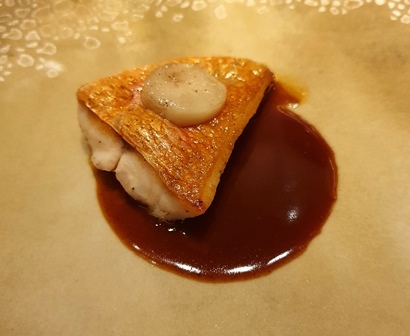 The dish of Saint-Jacques is aerial. It is accompanied by a champagne and a white wine. 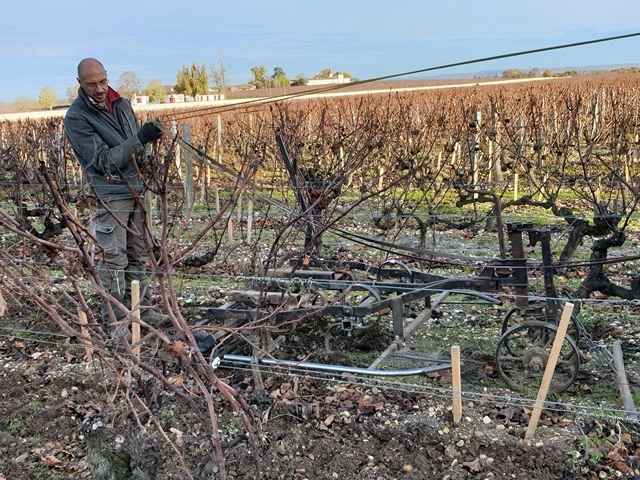 Pierre Trimbach thinks that the Riesling makes a little shade on Philipponnat Champagne Clos des Goisses 1996 disgorged in 2010, but we are many to think that both fertilize each other. 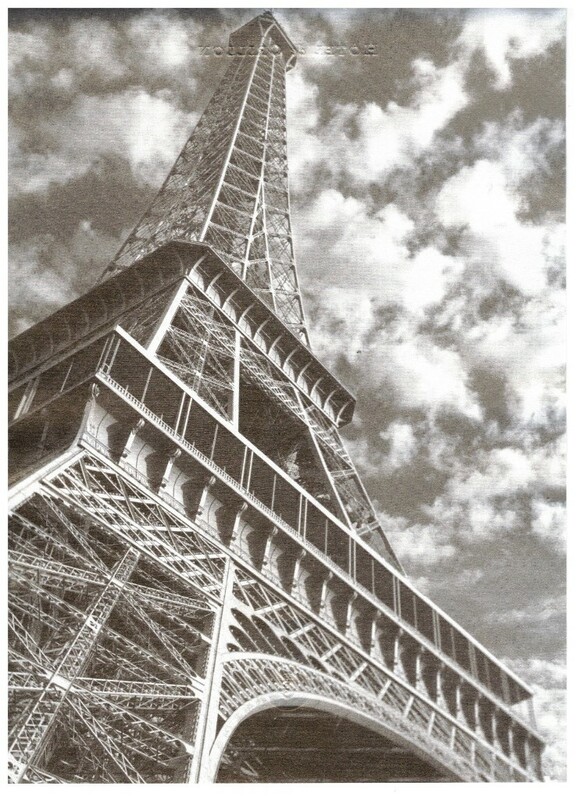 There are many bridges that are created between champagne and the Riesling Cuvée Frédéric Emile Trimbach magnum 1990. The champagne is equally made of Pinot Noir and Chardonnay and has a beautiful personality. He is alive. Riesling has an incredible scent. This perfume is conquering. The wine achieves this miracle of appearing warrior, invader, but also of great elegance. Riesling seduces me with its extreme precision. It’s fresh. It is a huge wine and Philippe Foreau notes that the combination is realised with the mint notes of the very fresh dish. I think it’s the cucumber dice that create the bridge between the two, champagne and wine. We are delighted with this beautiful association. The onion is superb and the truffle of Alba releases haunting perfumes. The dish is accompanied by two very disparate wines, whereas they are of the same year. The Bâtard-Montrachet Grand Cru Louis Jadot Magnum 1999 is like the Riesling a warrior wine. 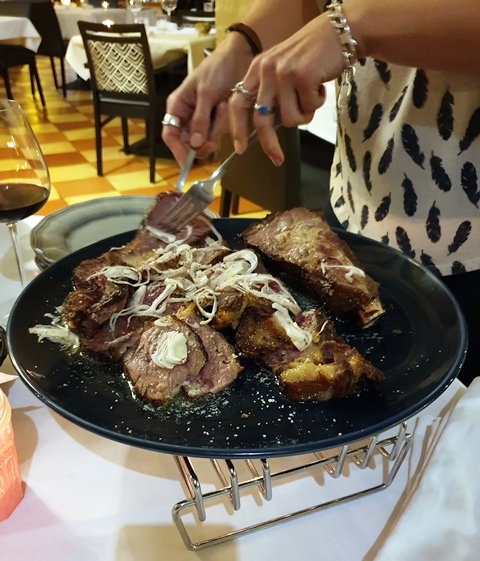 When it is served, it shows its muscles, with a heady perfume. But as soon as the wine is refreshed in the glass, the subtleties appear. Power and elegance are his two strengths. 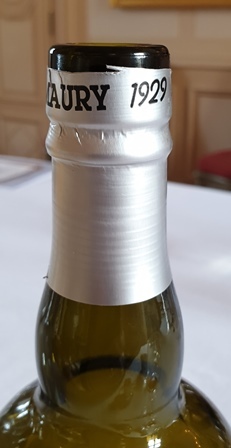 The White Burgundy Domaine Georges de Vogüé 1999 is in fact a White Musigny which by humility erases since 1991 its name as long as the replanted vines are not old enough. It reclaims its appellation from the 2015 vintage. This wine is more discreet than the Batard and is of rare elegance. He suggests more than he affirms and shows his refinement. 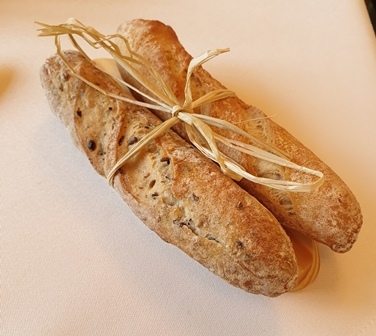 The agreement is very interesting, Batard successfully facing the white truffle while the wine of Vogüé is measured gently with the delicious onions and egg very justified for the consistency of the dish. 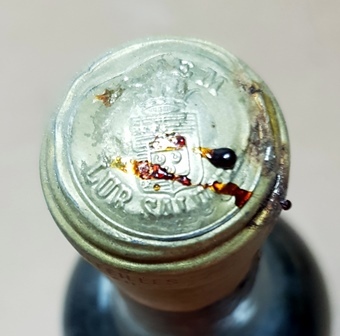 Aubert de Villaine, who has read the menu, is worried about the appearance of a sweet wine that risks harming the two red wines that will follow. Philippe Foreau says his Vouvray semi-dry Clos Naudin 2005 will have no negative effect on the reds. 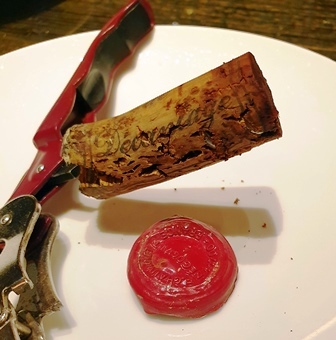 I ask in the kitchen if we can pass the dish red before the planned dish, but the service is launched also I open a second bottle of Clos des Goisses 1996, we drink after the Loire wine and before the red. 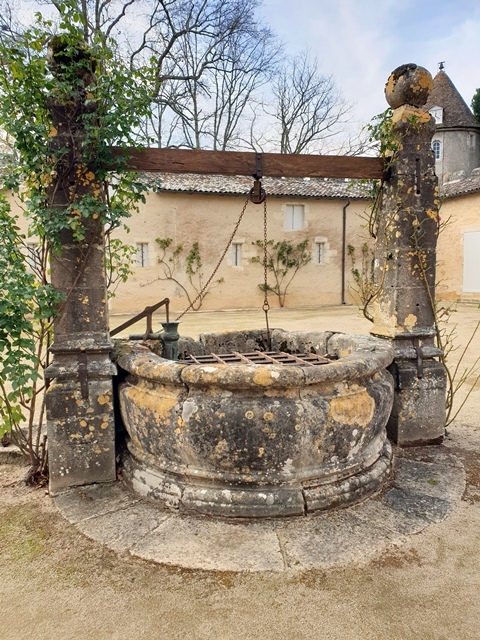 The Loire wine is quite simple at first contact, but it is like a Bugatti that needs a few minutes before the engine with innumerable cylinders begins to sing its symphony. The agreement that Philippe Foreau had suggested to me, with sweetbreads, is superb. The subtle wine is discreet, a message of courtly love, and if it is sweet, it keeps the mouth fresh. Philippe was right, the palate is not marked and we could have gone to red wines, but it is more prudent not to challenge the devil. 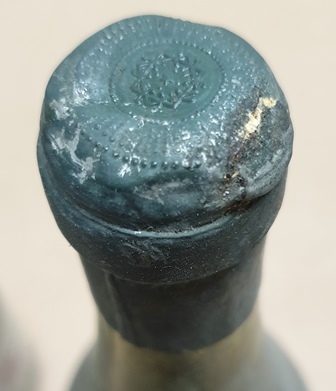 The bottle of Champagne Philipponnat Clos des Goisses 1996 disgorged in 2010 is fundamentally different from the first while they come from the same batch. 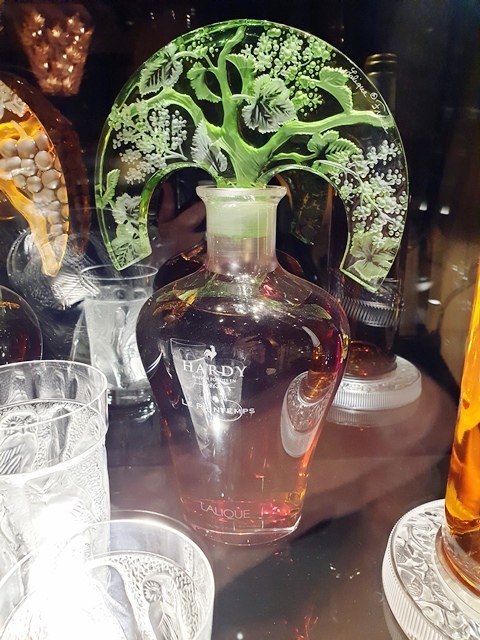 Philippe Foreau suggests that the second bottle would be more dosed than the first and Charles Philipponnat is categorical, it is impossible that the dosage is different. 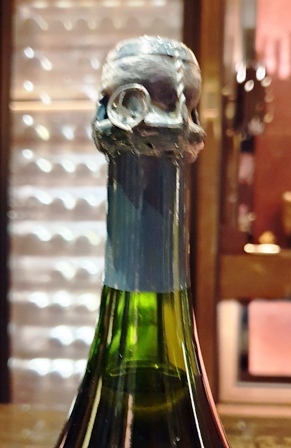 The taste of this champagne is richer, more powerful, with strong evocations of almonds and hazelnuts. Personally I preferred the first bottle served, but opinions are shared. Our palates are calibrated and arrive the rack of lamb, chosen not to hit the two big reds. 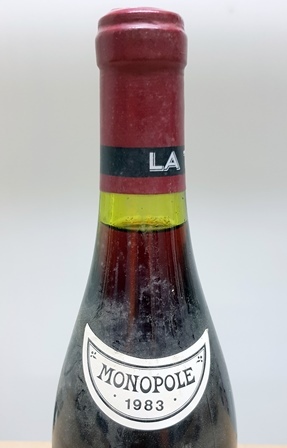 At the opening at 17 hours, the Musigny Vieilles Vignes Domaine George Vogüé 1970 had conquered me by its perfume of a rare elegance, all in suggestion. But the wine I drink now is a little tired, more evolved than it should be. But he will make a fantastic comeback, come together, will lose his veils of excessive maturity to become gallant. It is a very charming wine. He is very fine, even in this year of little renown. 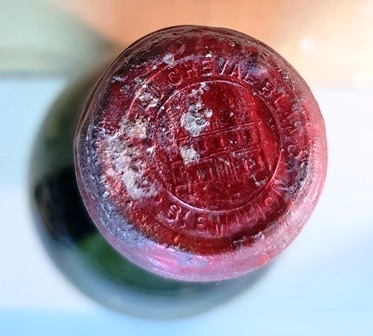 The Richebourg Domaine de la Romanée Conti 1964 has a very young fruit. He is solid and robust and only gradually delivers the complexities of the Domaine. It is a wine with a wide range of flavors, that it declines elegantly. Neither wine harms the other and we enjoy two Burgundian expressions of great talent. As we drink big thirst I ask that we do not serve cheese because there will not be enough wine. Fortuitously no cheese was listed on our menus while it was planned. Despite some expressed wishes, we go directly to dessert. 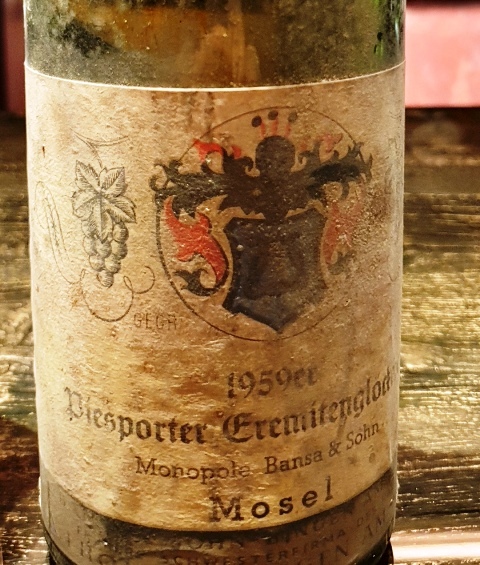 The Late Harvest Riesling Sélection Personnelle Jean Hugel 1935 is announced by Marc Hugel as being very dry and although it is late harvested, it is actually very dry. This wine is a marvel of subtlety. We could have a meal with this wine alone, to explore its exciting ability to marry the gastronomy. This wine is a wine of meditation. It gives me a very strong emotion. 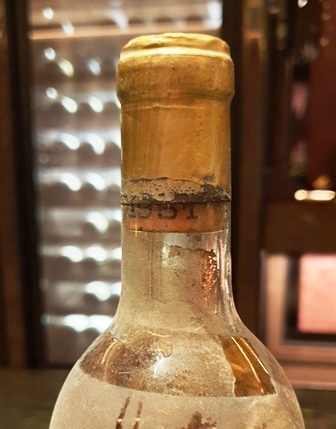 The Vouvray Goutte d’Or moelleux Clos Naudin 1947 with the extremely amber color is the reverse of the previous one. It is absolutely fantastic in very strong notes where Philippe Foreau finds evocations of an incredible imagination, like the horse that comes back to the stable, whereas I find under its very roasted message, almost molasses, notes of tea. This wine is a thundering prodigy of gourmet sweets. You can go from one wine to another, each offering admirable sensations. 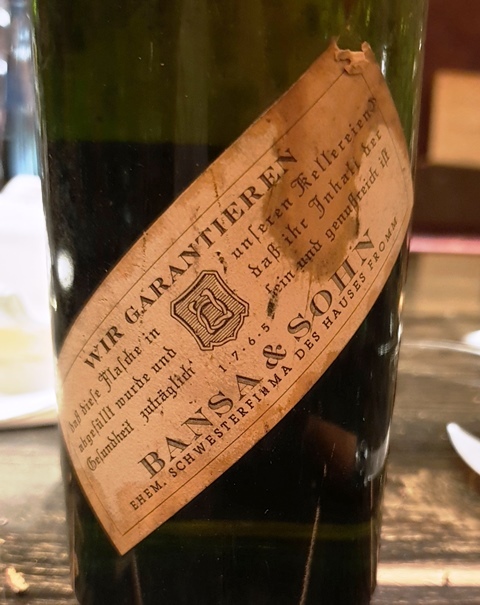 I had told at the beginning of the meal that thanks to Etienne Hugel, brother of Marc Hugel, I had the chance to drink a Constantia of South Africa of 1791 belonging to Jean Hugel. 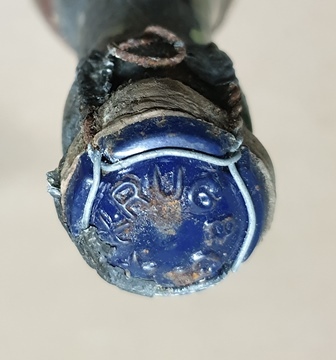 The presence of Marc made me want to open for my friends winemakers a Red Constantia J. P. Cloete Great Constantia South Africa around 1860, the wine of kings, emperors and tsars, the most mythical wine that is. At the opening, I was paralyzed by the perfection of its perfume. This wine is my Grail, my search, my love. He is rich, peppery, with extreme acidity which supports the wine, and he has held the 158 years of his life without getting a wrinkle. Its length is infinite and its aromatic persistence is too. It is fat / dry. I enjoy this perfect wine and am particularly happy that my friends love it, because who better than they could appreciate these eternal flavors? 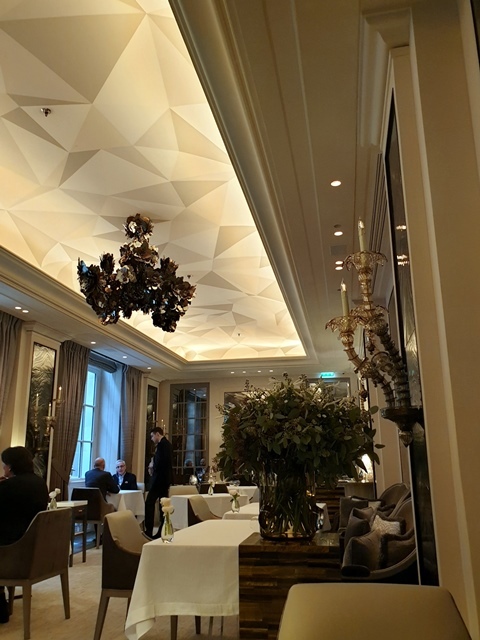 In the pretty dining room of the Laurent restaurant we had a nice table but the shape made it very difficult to have common conversations. Three or four small discussion groups were formed except when it was necessary to address a general message and the opposite wings could not speak to each other. So, when we got up, the conversations continued very late, as everyone was happy with this friendship dinner. 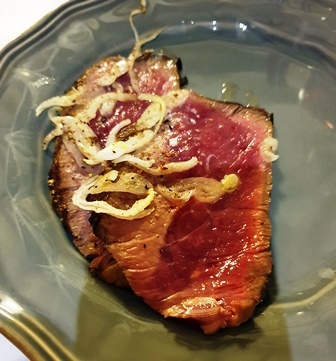 The chef made an inspired cuisine, of great delicacy and without parasitic tastes that hit the wines. The service of the dishes and wines was very attentive and intelligent. 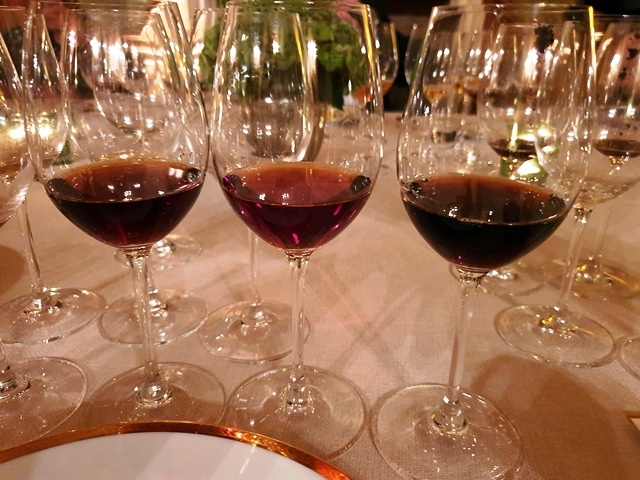 We left happy to have shared a great moment of friendship with wines that are the most beautiful expressions of prestigious domains, represented by those who embody them. Everyone has only one desire, it is to come back next year. 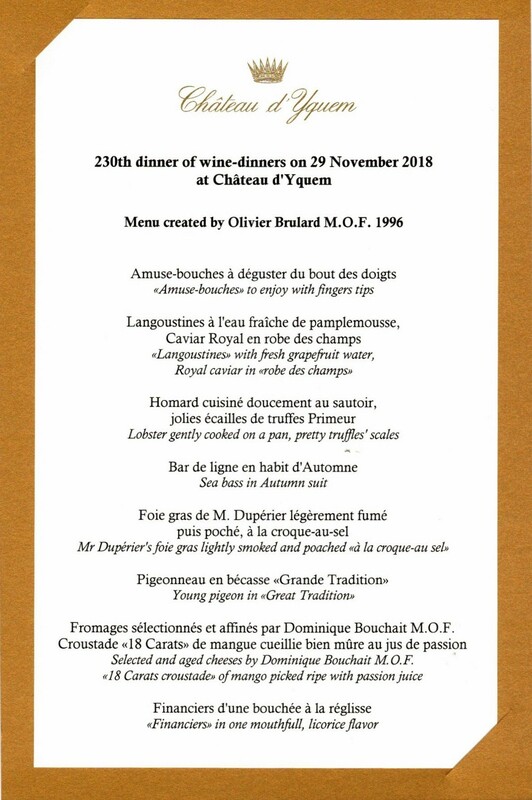 Cette entrée a été publiée dans dîners de wine-dinners le 28 octobre 2018 par François Audouze.